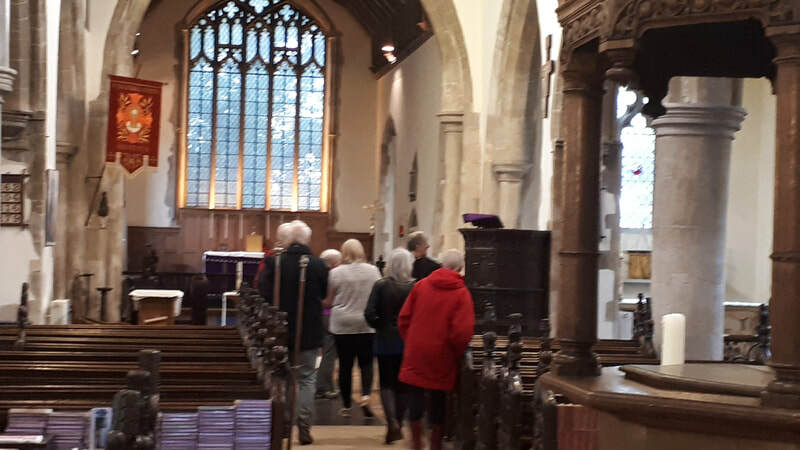 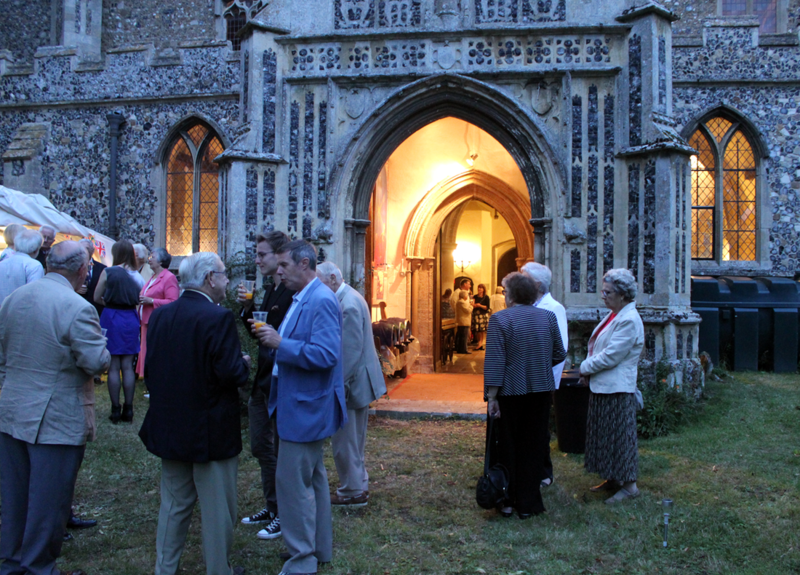 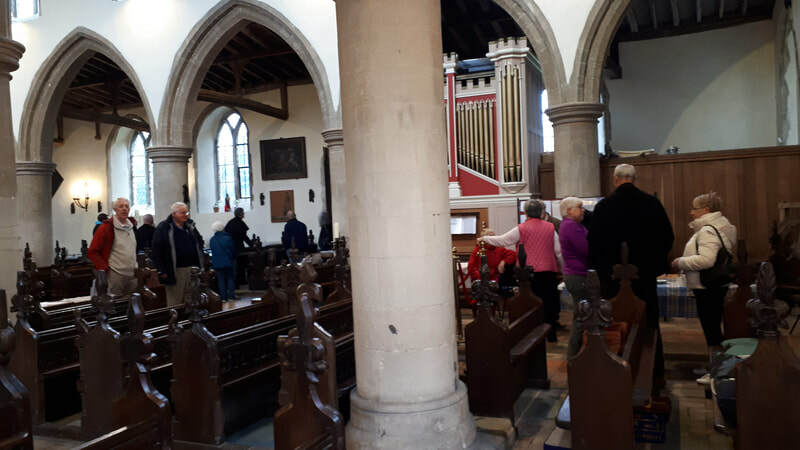 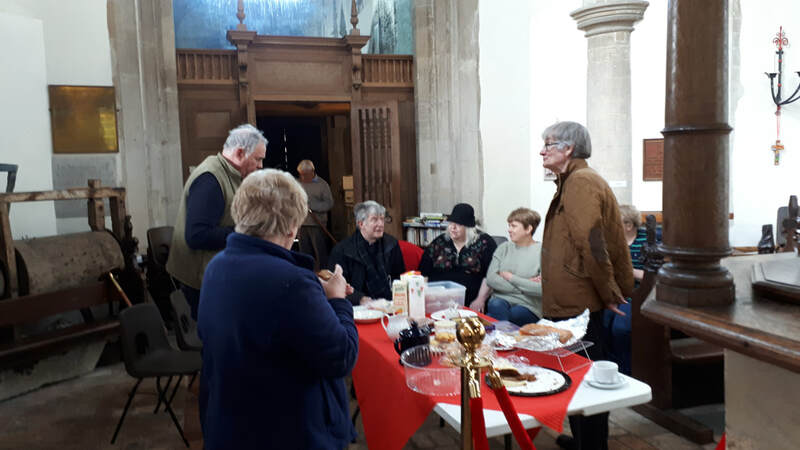 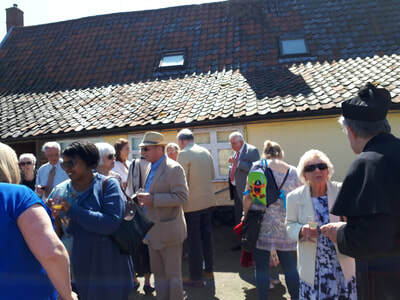 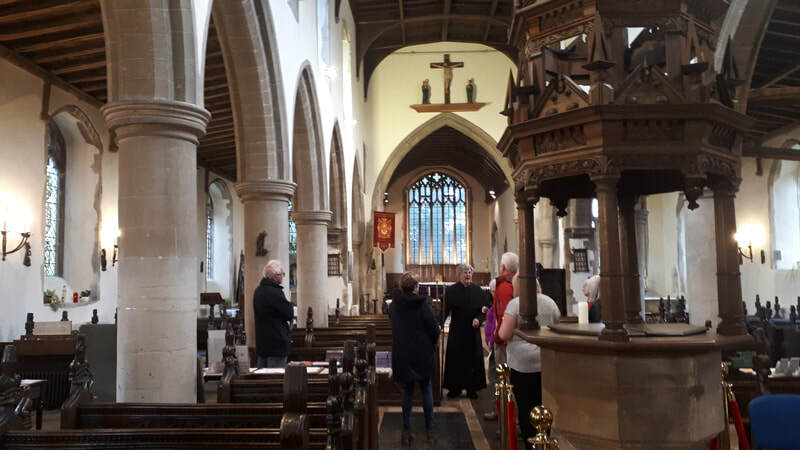 New and longer-established residents of Mendlesham were invited to tours of the church and armoury, with coffee, tea and cake to follow. 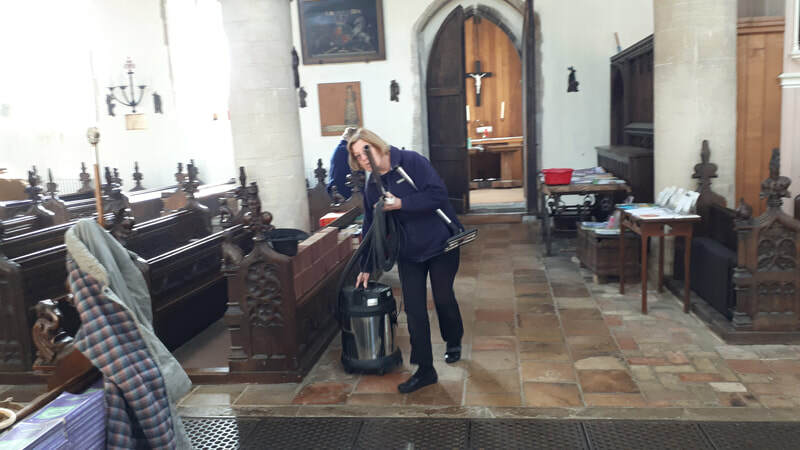 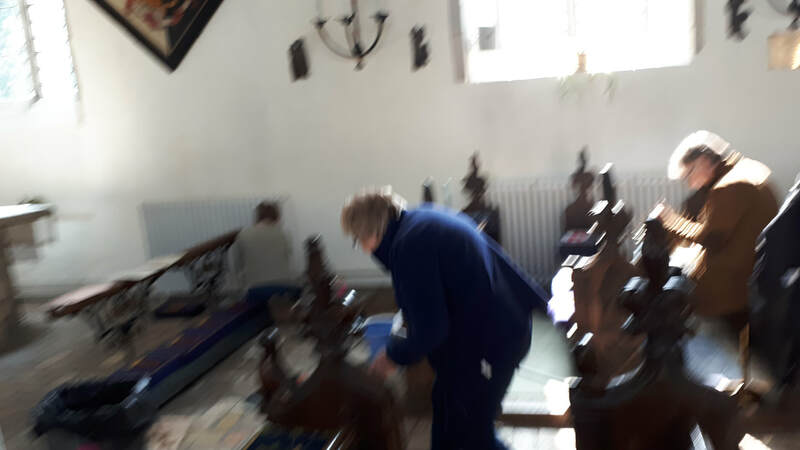 A good time was had by all as a large group of volunteers tidied, cleaned and polished the church. 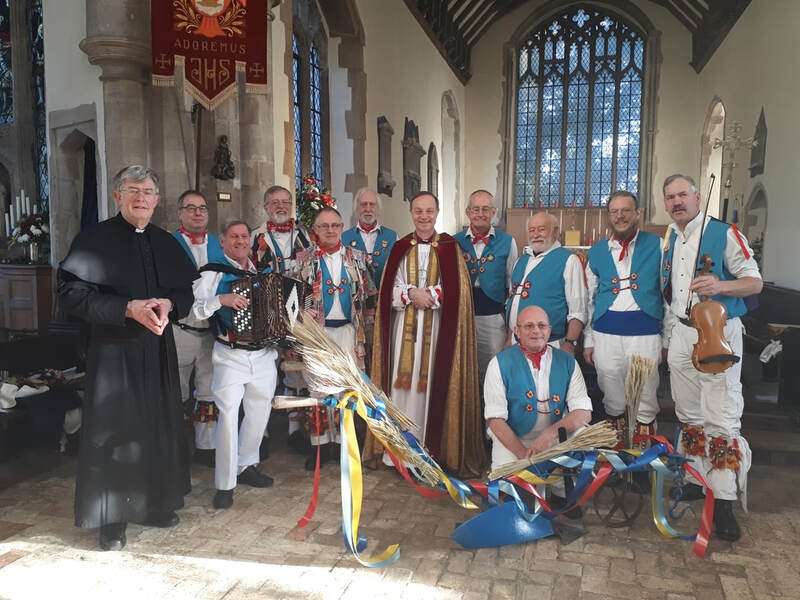 We welcomed the East Suffolk Morris Men to the 9.30 Parish Mass, when Fr Philip blessed the decorated plough and the Morris Men danced. 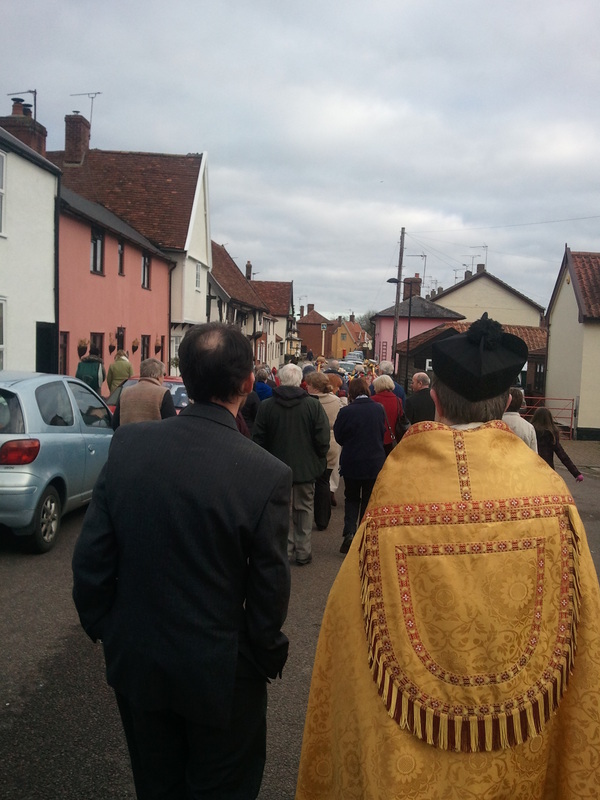 After Mass they took the plough in procession through Front Street and Old Market Street. 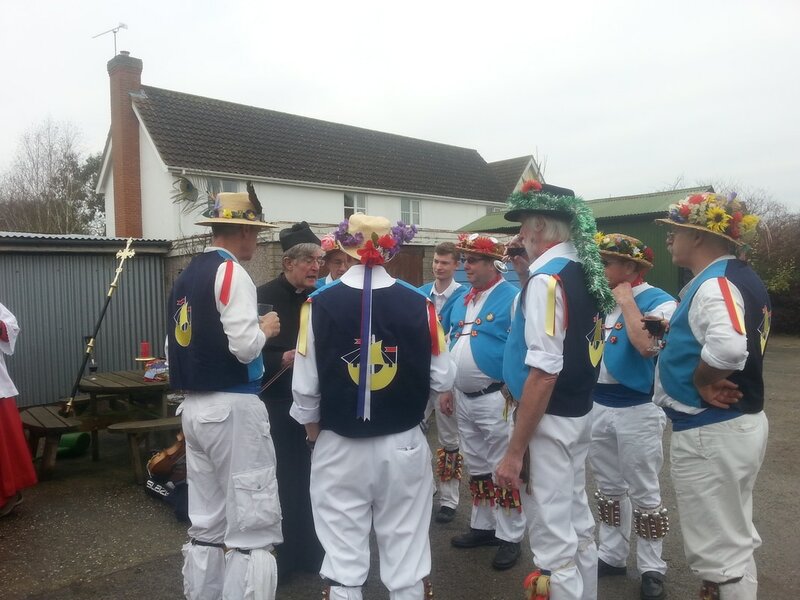 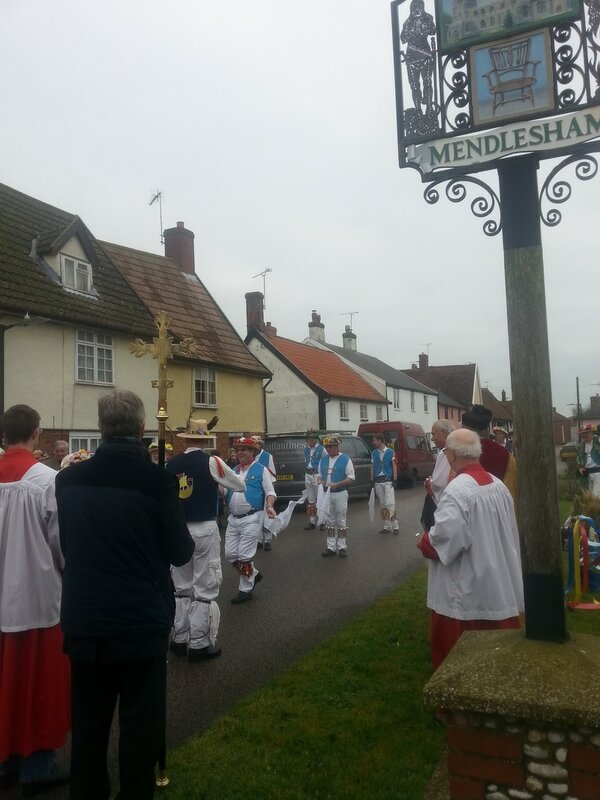 We stopped at the village sign where Fr Philip offered a prayer for the village and the Morris Men danced again. 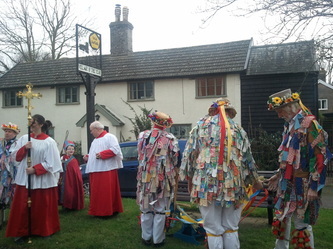 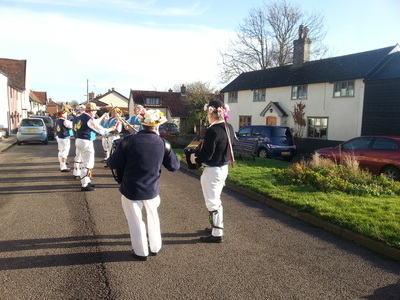 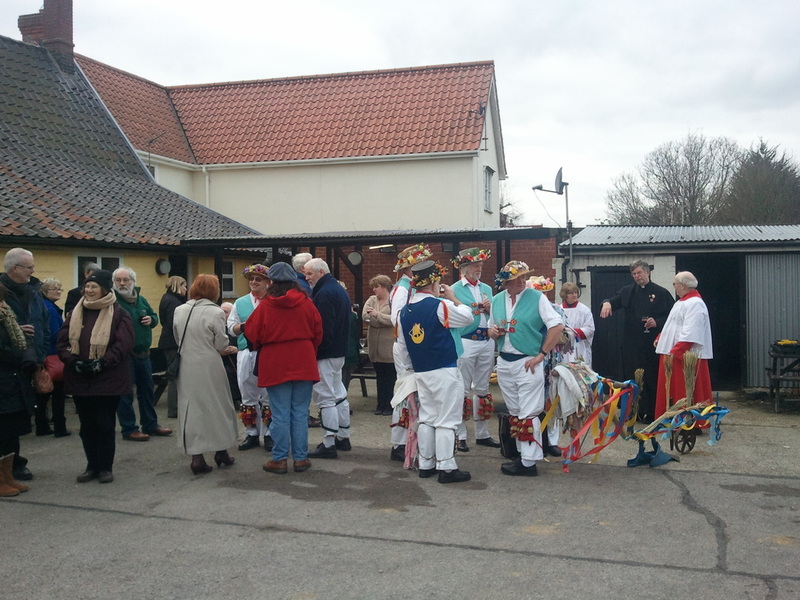 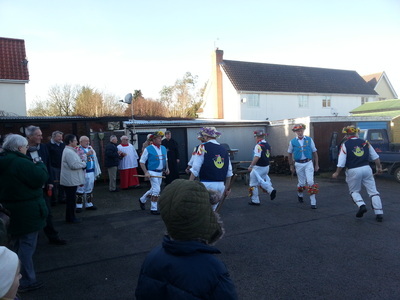 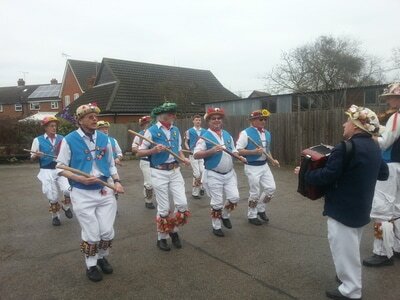 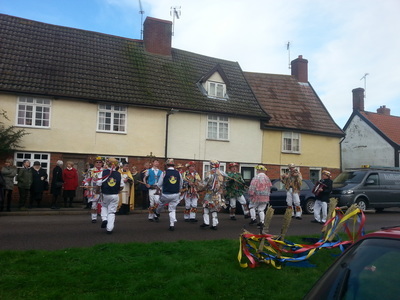 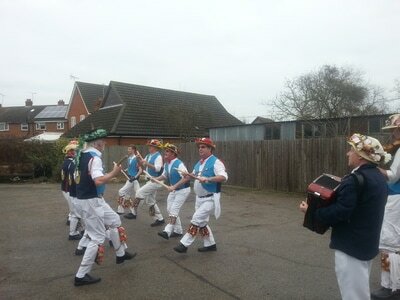 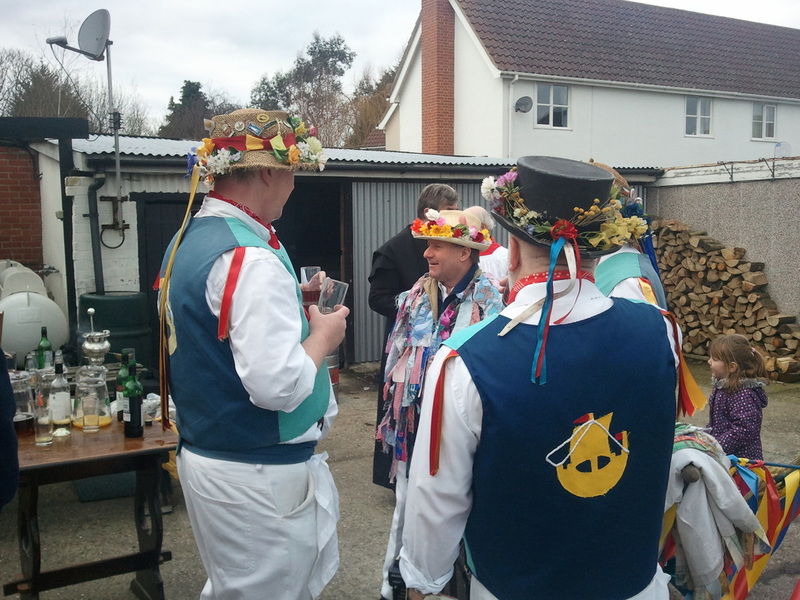 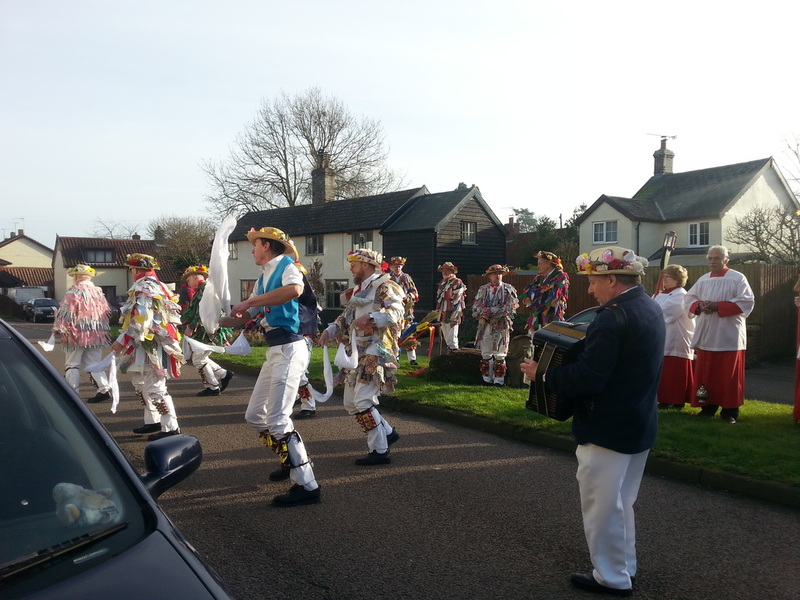 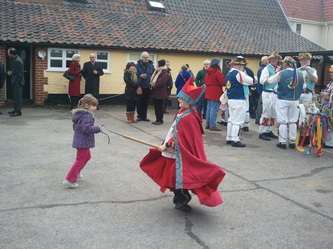 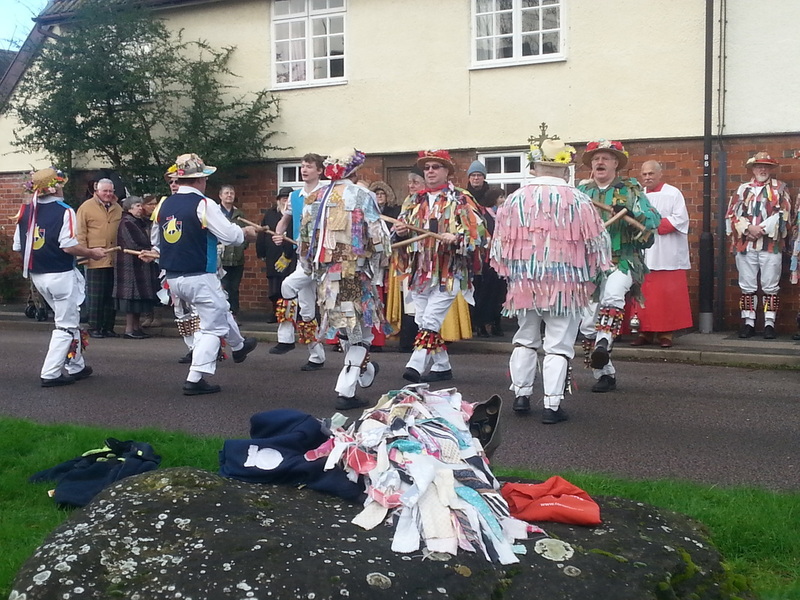 We then went to the King's Head, where there was more Morris dancing and Paul, the landlord, kindly provided drinks. 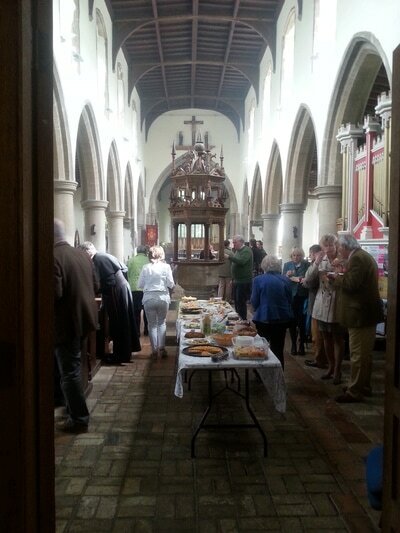 Afterwards we returned to church for a shared lunch. Thanks to the kind person, who wishes to remain anyonymous, who restored the crib figures vandalised in January. 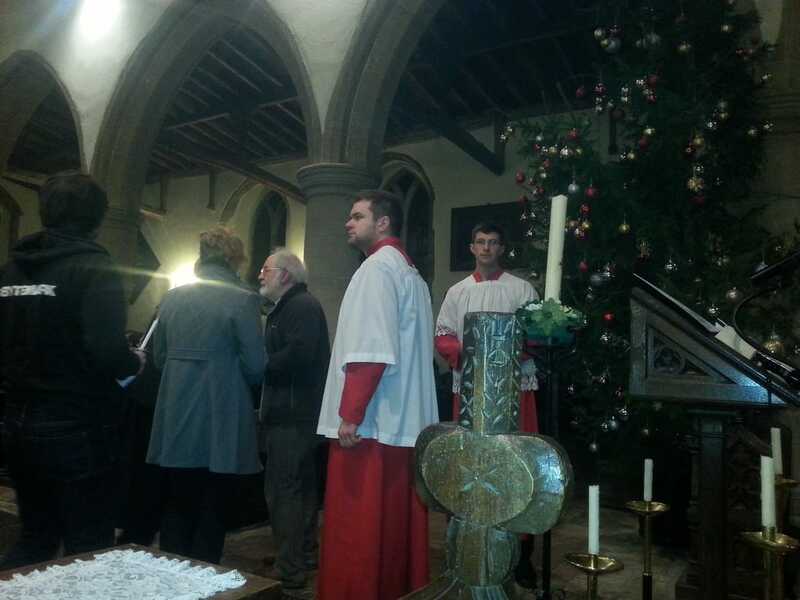 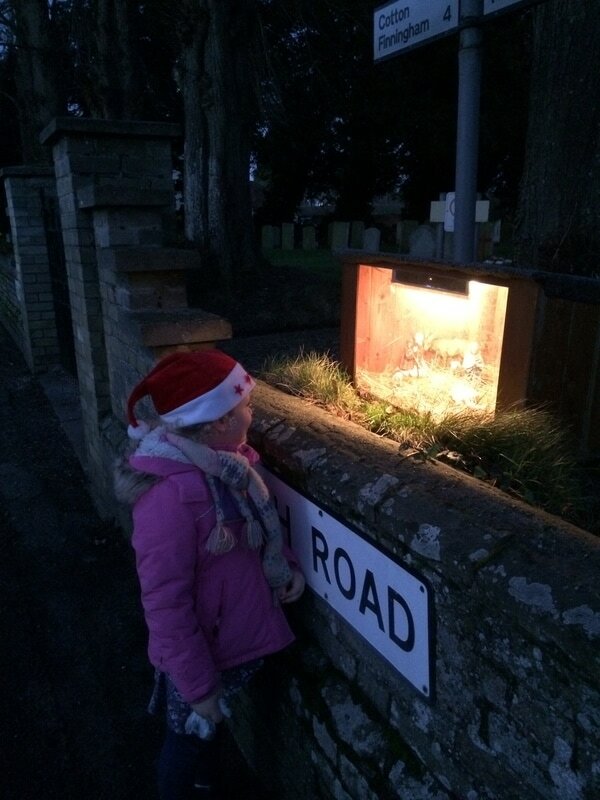 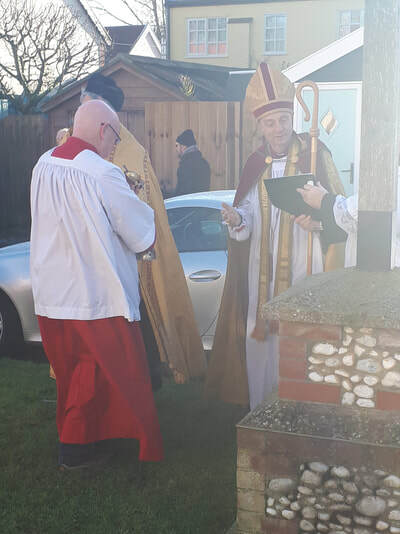 They were rededicated on Sunday 2nd December, together with a beautiful new outside crib, kindly made by Adrian Palfrey. 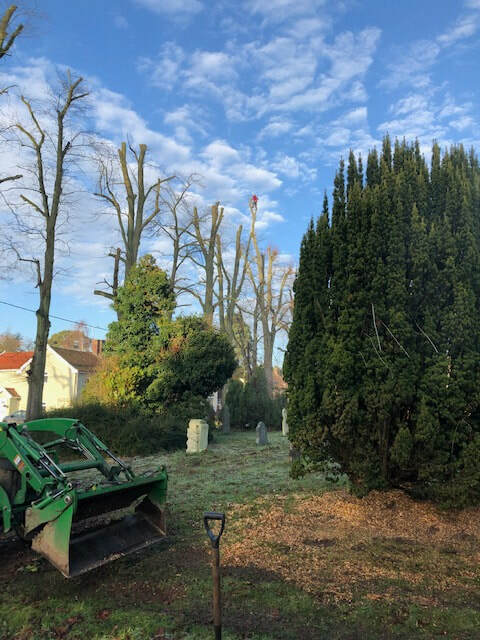 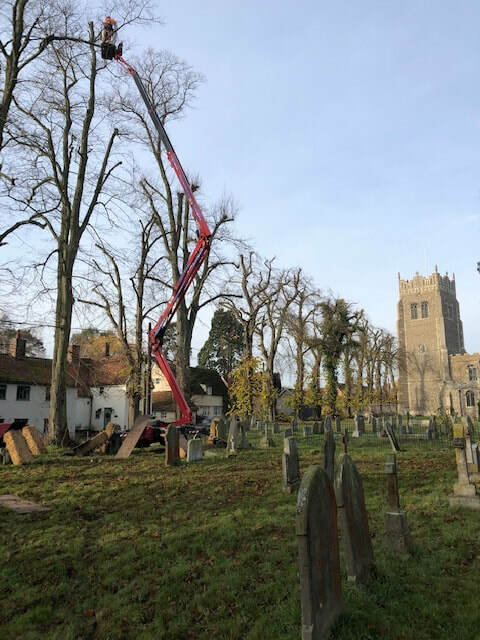 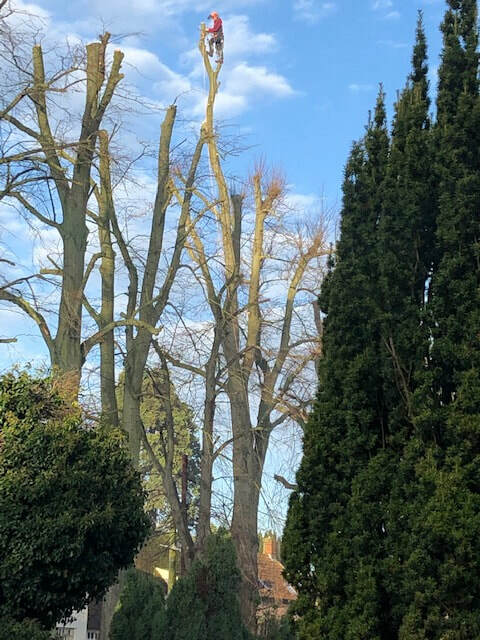 The extensive work to the lime trees bordering the churchyard which began in 2017 and was halted for bird-nesting season, was successfully completed by Fordham Landscapes Ltd in November 2018. 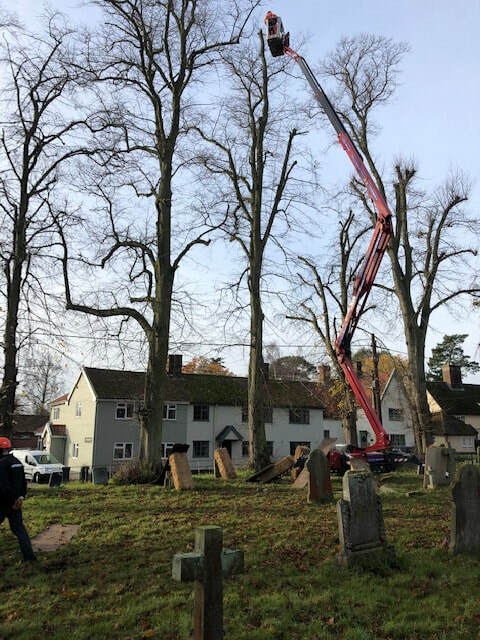 The height of the trees was reduced by 25% and crown lift to approximately 5m for reasons of safety and good tree management. 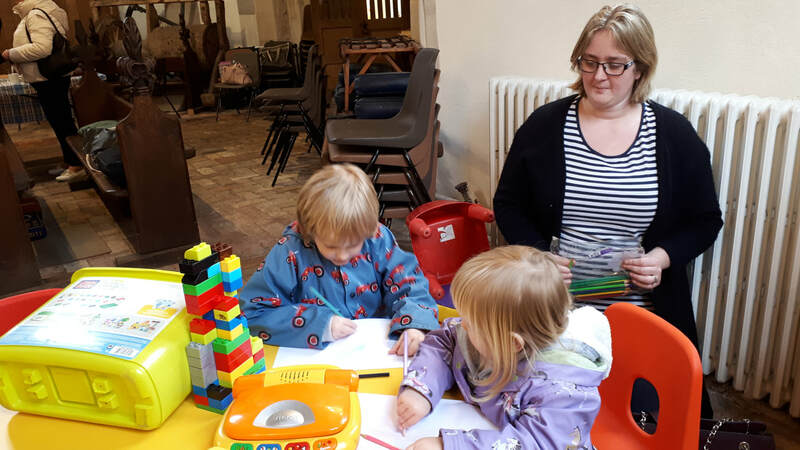 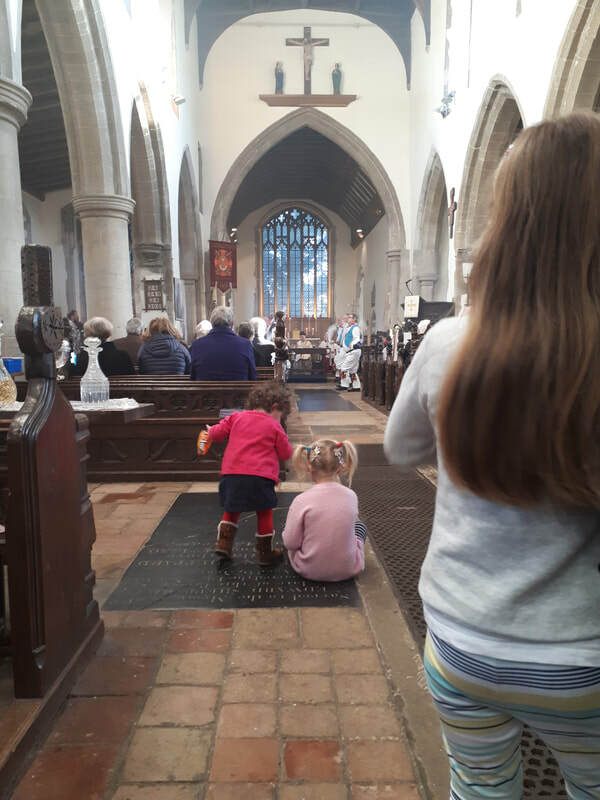 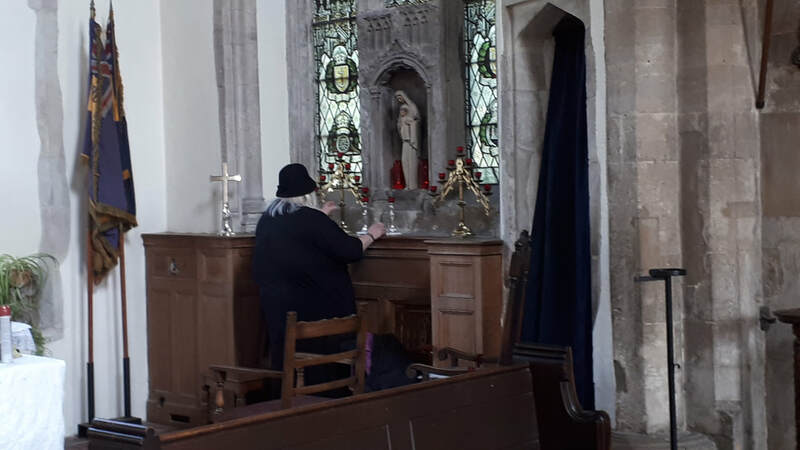 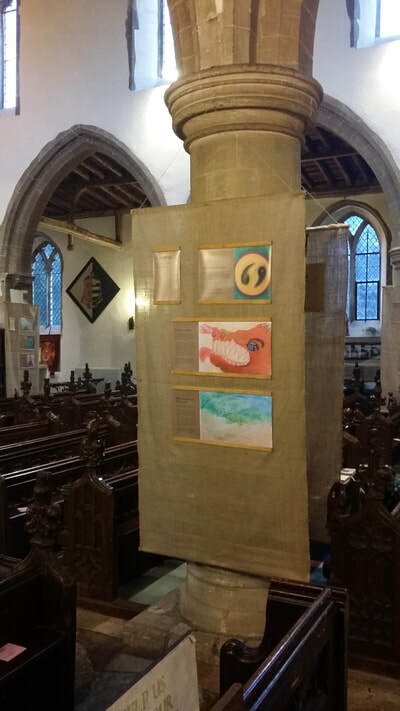 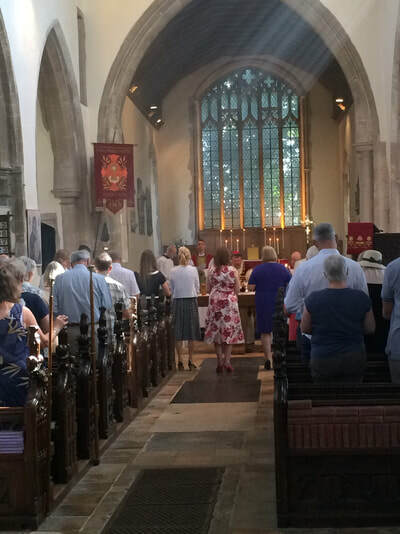 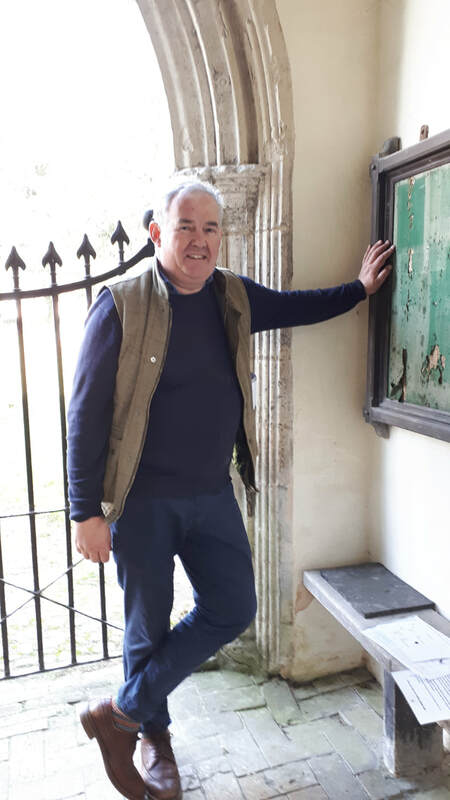 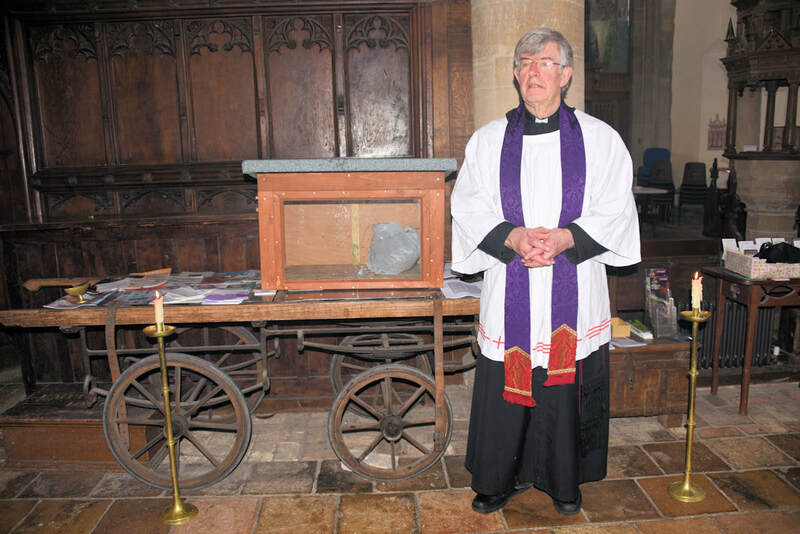 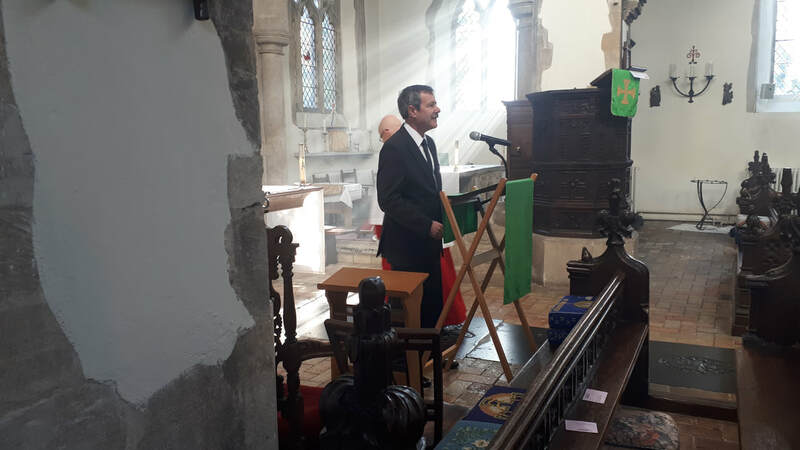 The PCC is grateful to Mendlesham Parish Council for a grant towards this costly work, the remainder of the money having had to be borne out of church funds. 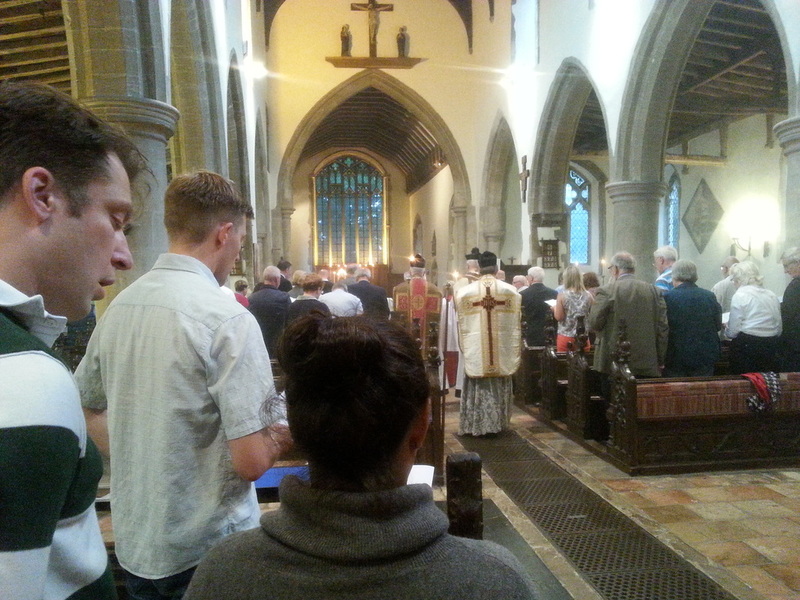 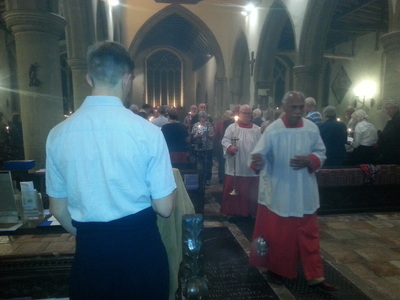 ​On Sunday 11th November about 150 people attended the sung Mass of Requiem at St Mary's for all fallen in the 2 Great Wars and since. 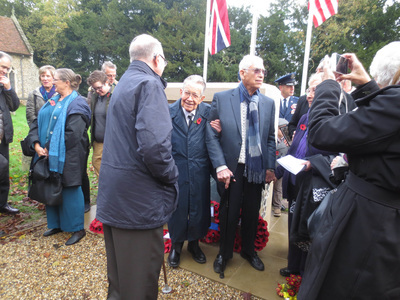 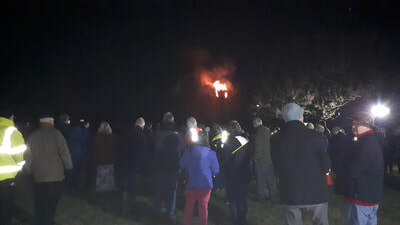 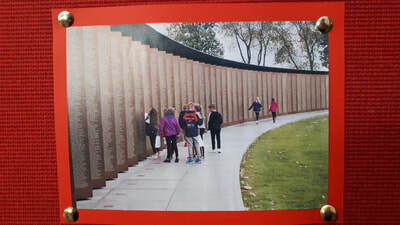 It included the 2 minutes' silence, laying of wreaths and candles lit for all the fallen from Mendlesham and the 263 US Army Airforce personnel based at Mendlesham Airfield who sacrificed their lives. 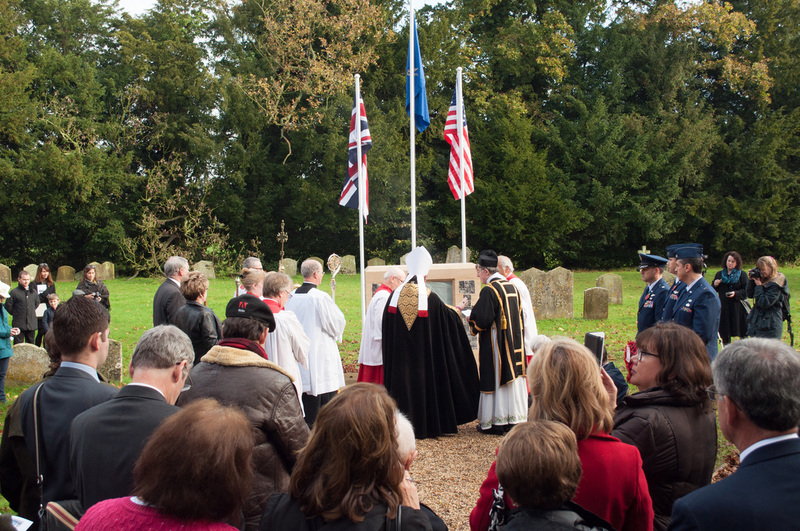 ​It was followed by a short act of remembrance at the US Memorial in the churchyard. 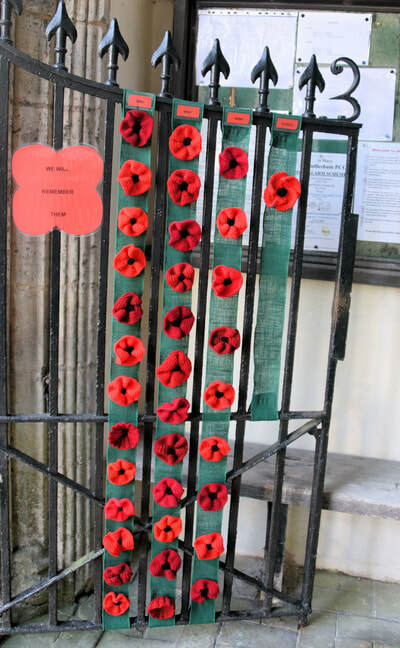 The last post was played on a bugle and the 6 bells in the tower were chimed. 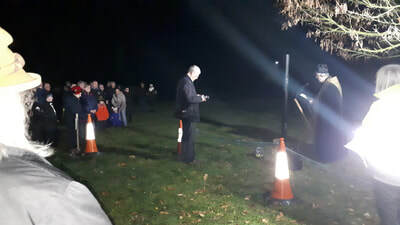 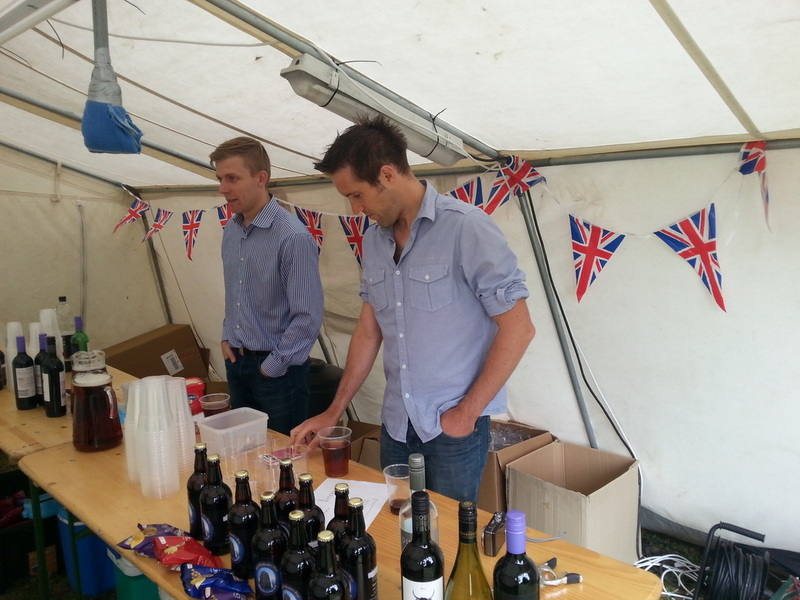 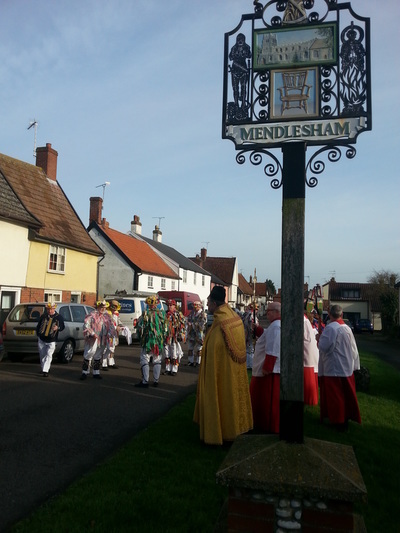 ​At 6.30 pm Mendlesham Parish's ‘Battle’s Over’ event took place at Mendlesham Green. There were readings and Fr Philip read out the Roll of Honour from WW1 and offered prayers for the departed & for peace before the last post was sounded and the beacon was lit. 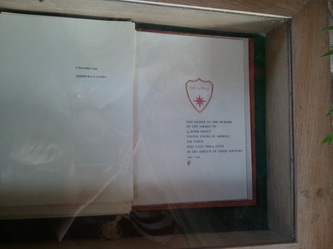 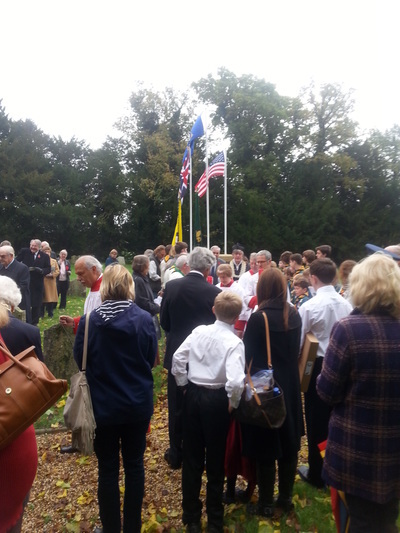 Thanks to Bernard Coxhead for updating the memorial book containing the names of the 263 USAAF personnel from the 34th Bomb Group stationed at Mendlesham who died in WW2 and for Sean Welch for his painstaking research and for travelling from Lancashire for its dedication on 18th November, when he gave a fascinating talk about his discoveries. 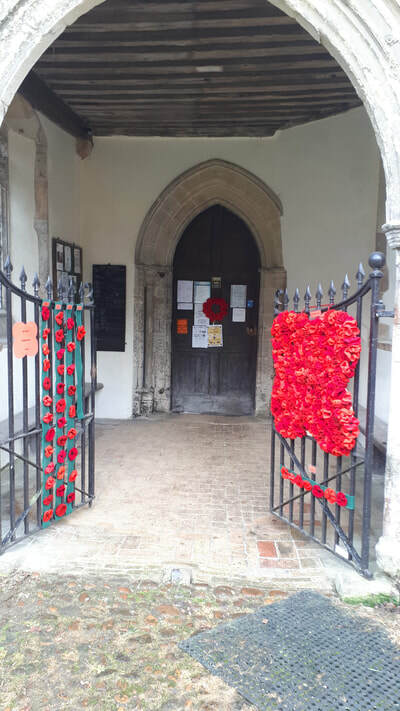 The silhouette of a WW1 soldier in the churchyard and Poppies knitted by Mendlesham WI on the church porch gate - 1 for each person from Mendlesham who gave their life in WW1 (25) WW2 (9) the Korean War (1) & the 263 USAAF airmen based at Mendlesham Airfield in WW2 & 7 Canadian Airmen who stopped there before their final journey. 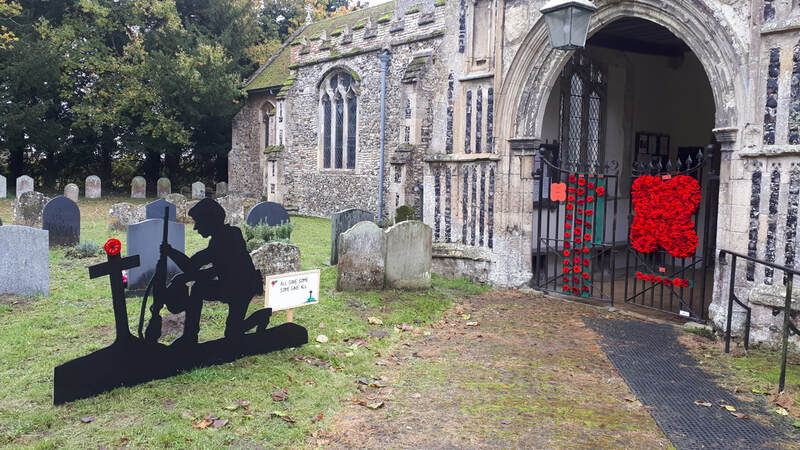 On Friday 9th November 166 pupils & staff of Mendlesham Community School, parents & parishioners attended a Remembrance Service at St Mary's, where candles were lit for each of these men. 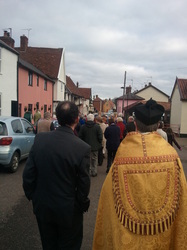 Some photos of the procession and Benediction after Mass. 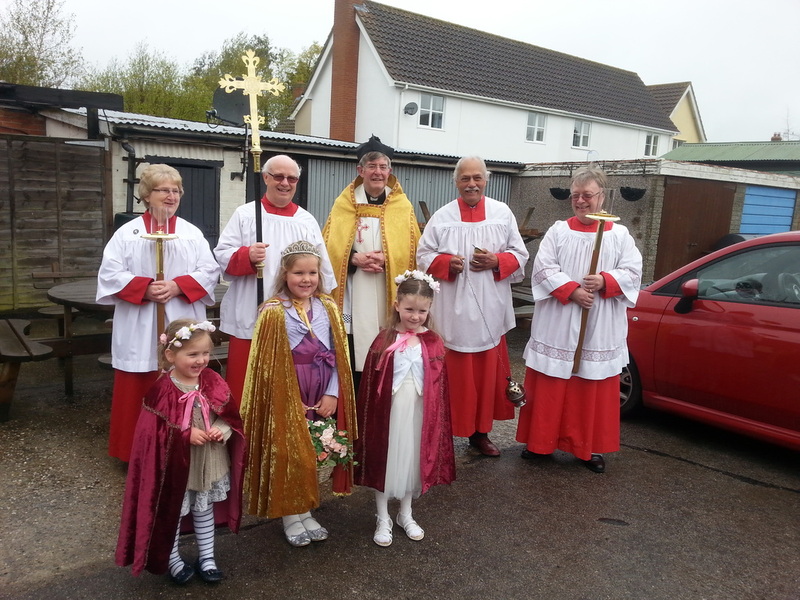 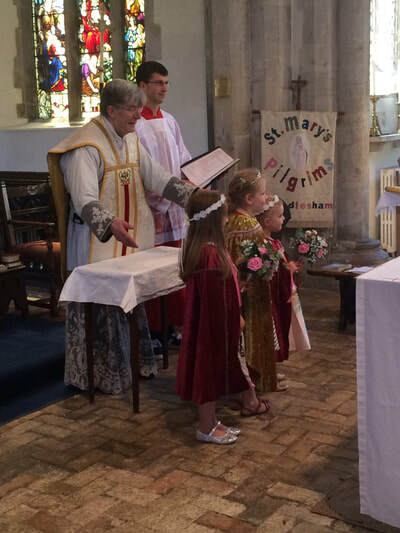 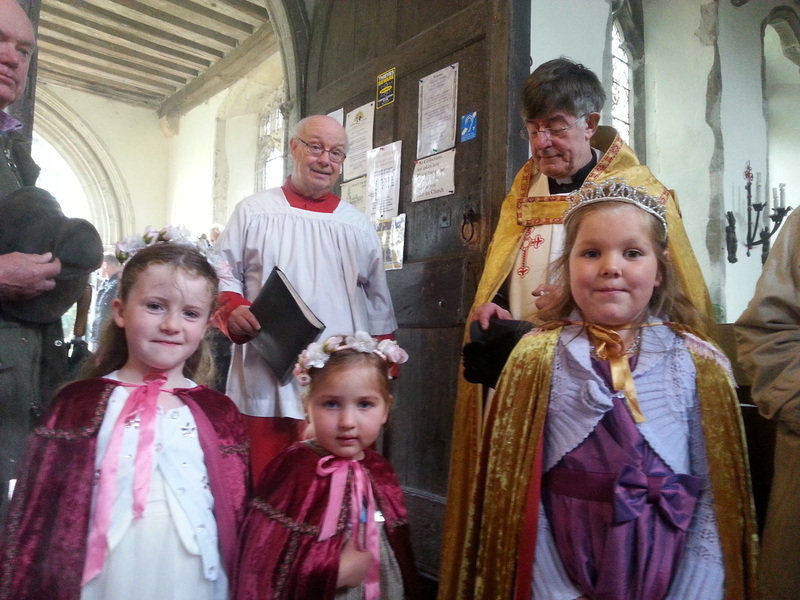 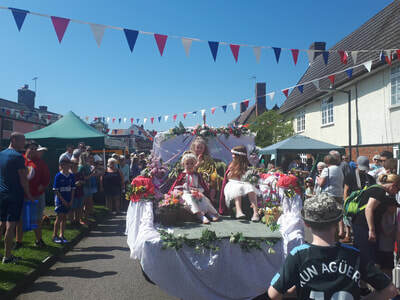 Fr Philip crowned the statue of Our Lady and then Amy as May Queen and Poppy and Lily as her attendants at the 9.30 Parish Mass, which was followed by a procession around the village in honour of Our Lady. 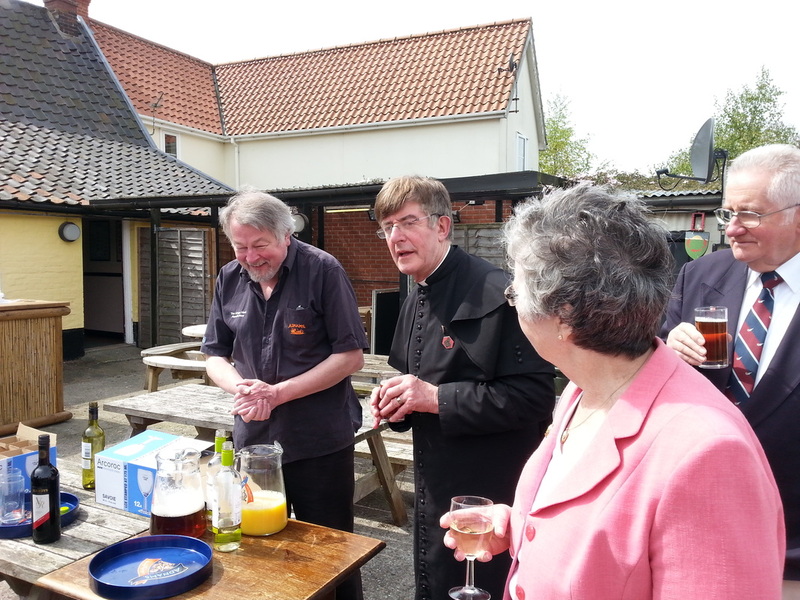 After Fr Philip offered a prayer of blessing for the village at the village sign, Paul generously offered drinks at The King's Head. 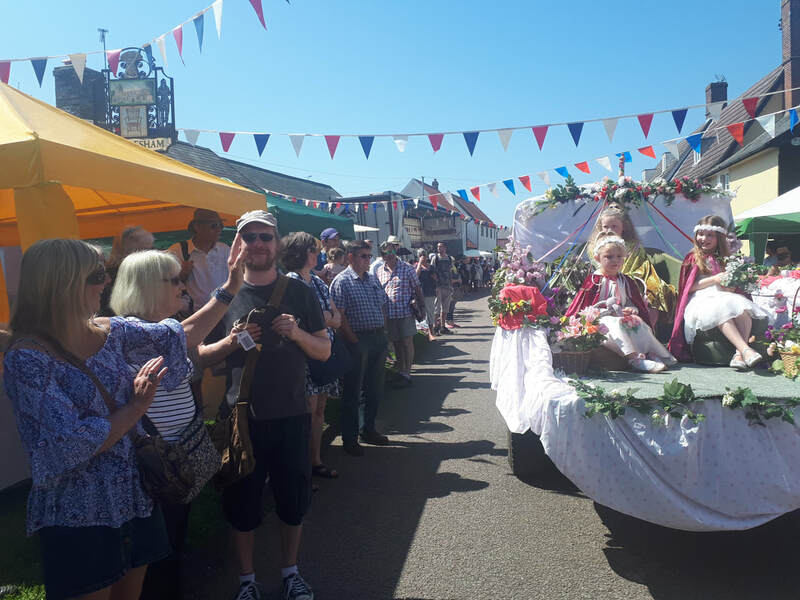 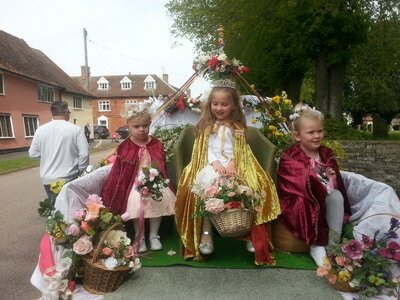 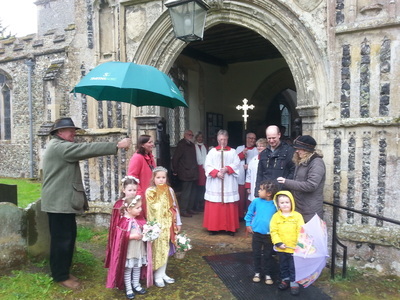 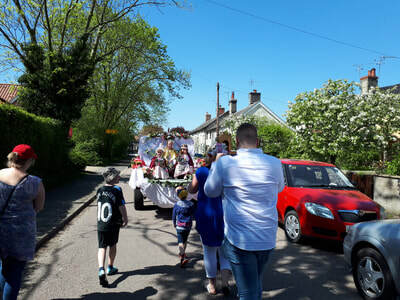 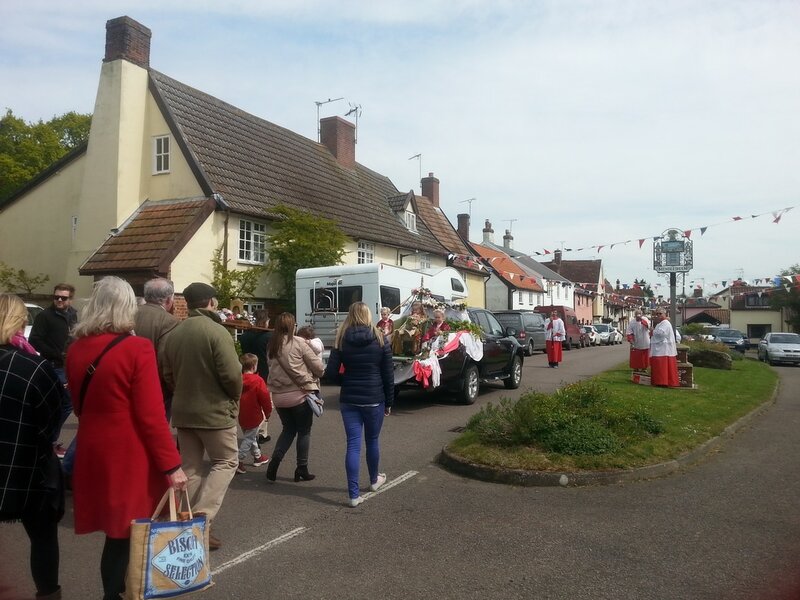 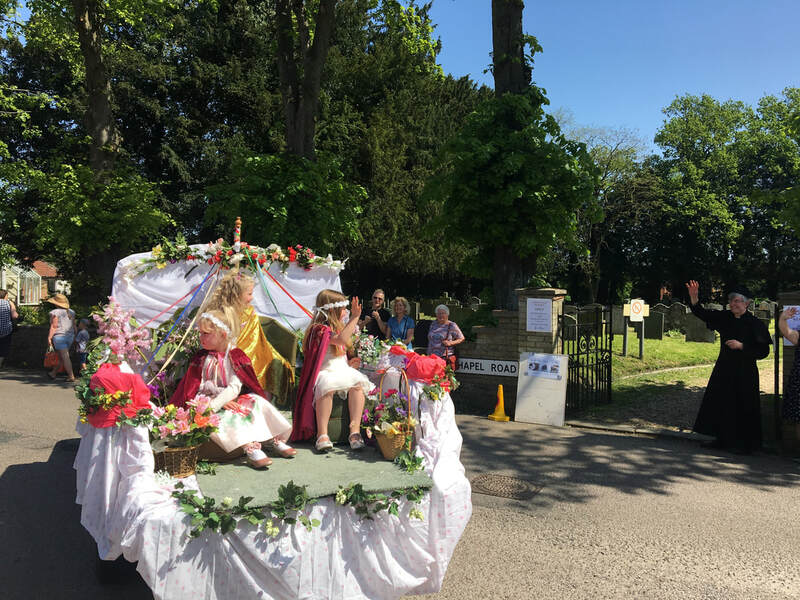 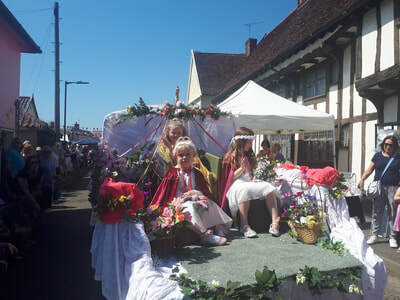 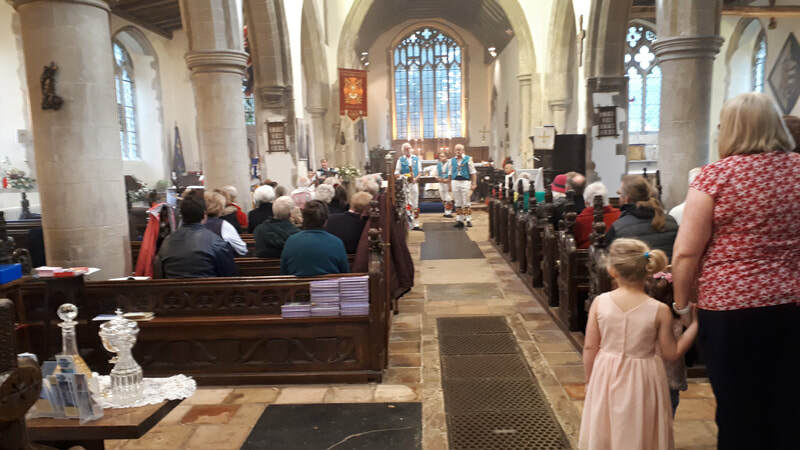 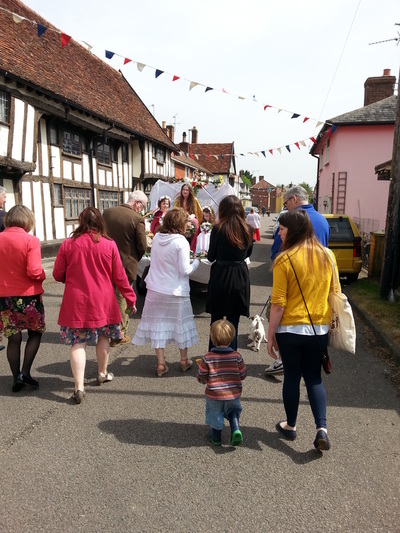 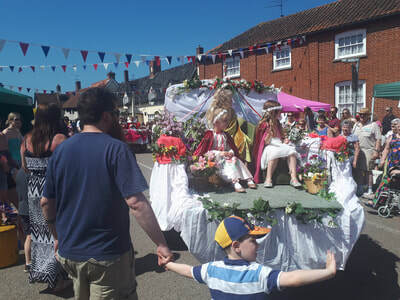 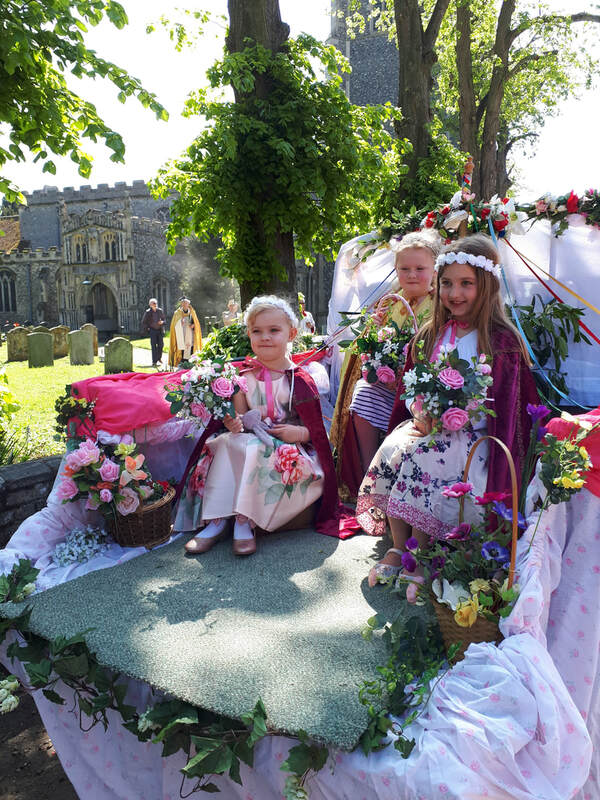 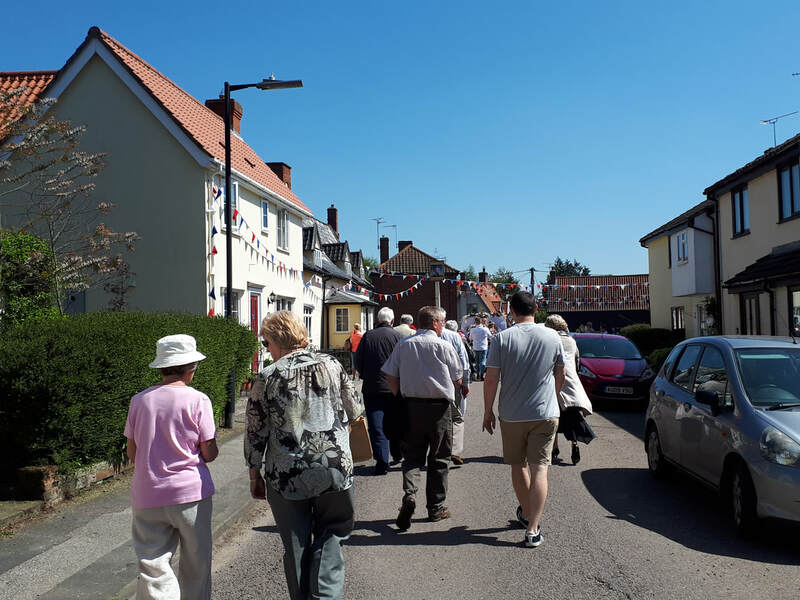 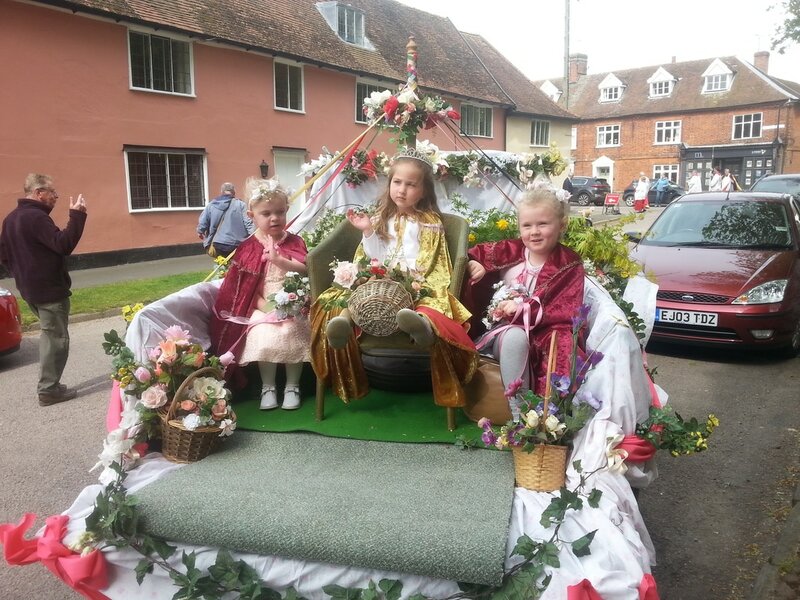 ​On Monday our May Queen and her attendants took part in the procession at the annual Mendlesham Street Fayre, when hundreds of people visit the village. 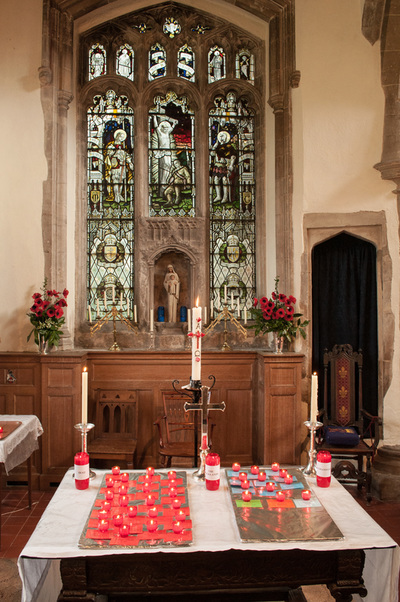 The church and armoury were open, teas were served and many people stopped to pray or light a candle in the peace of the Holy Cross chapel. 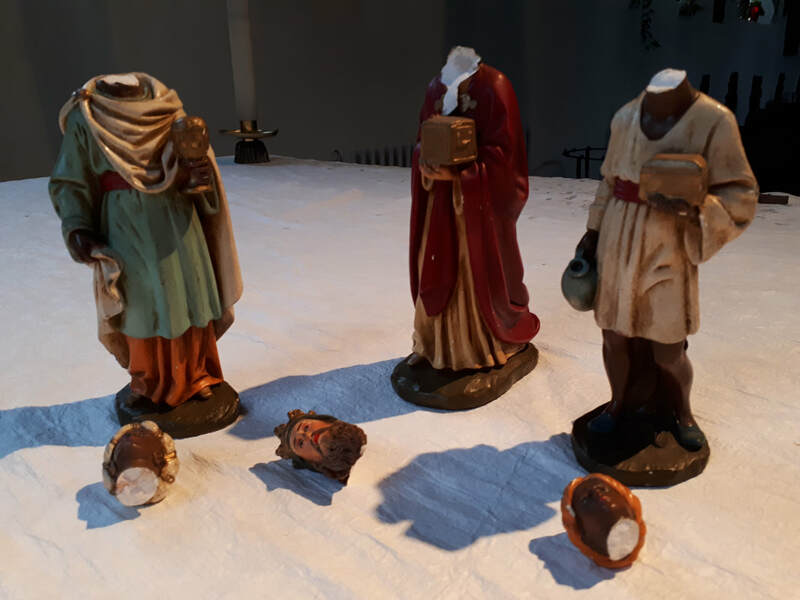 We have been touched by the great support and many kindnesses offered in the wake of the sad act of vandalism when the 70 year-old figures of 3 Wise Men in our outside crib were decapitated in January. 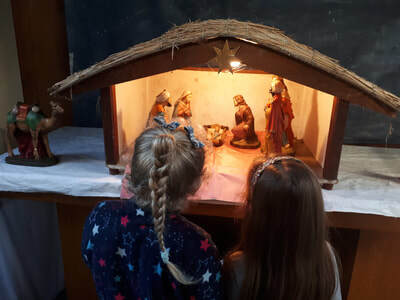 The goodwill and love shown in all kinds of ways, including a spontaneous collection of money in the village and several offers to repair the figures and provide a stronger crib housing (a more 'stable' stable!) 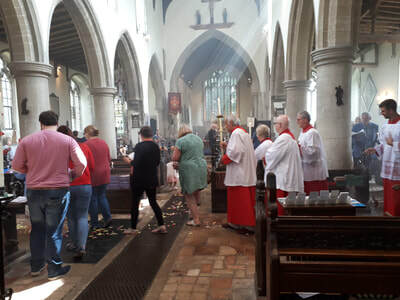 by people both in the parish and far beyond who were appalled by the action has far outweighed the mindlessness or hatred which caused this act of destruction. Good inevitably triumphs evil! 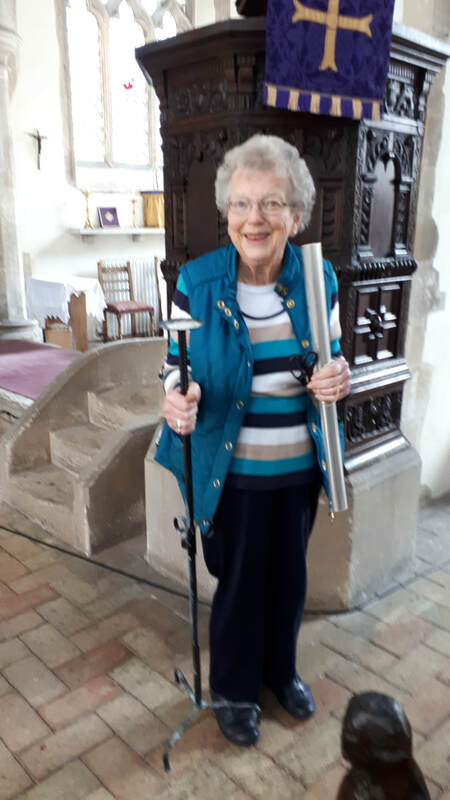 ​A total of £221.05 has been given through the collection in the village shop organised by Hayley Skilling, a donation from the Mendlesham Fundraisers Angela Lockwood, Madeleine and Chris Watson and a cheque from Jean, a friend of St Mary's who lives in Durham. 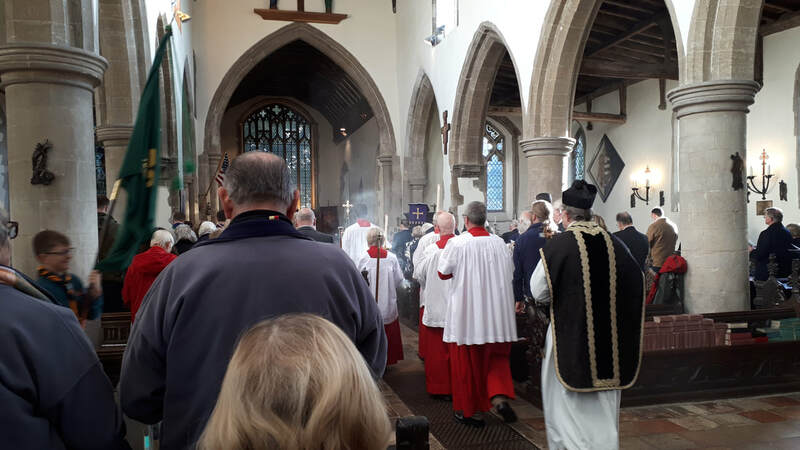 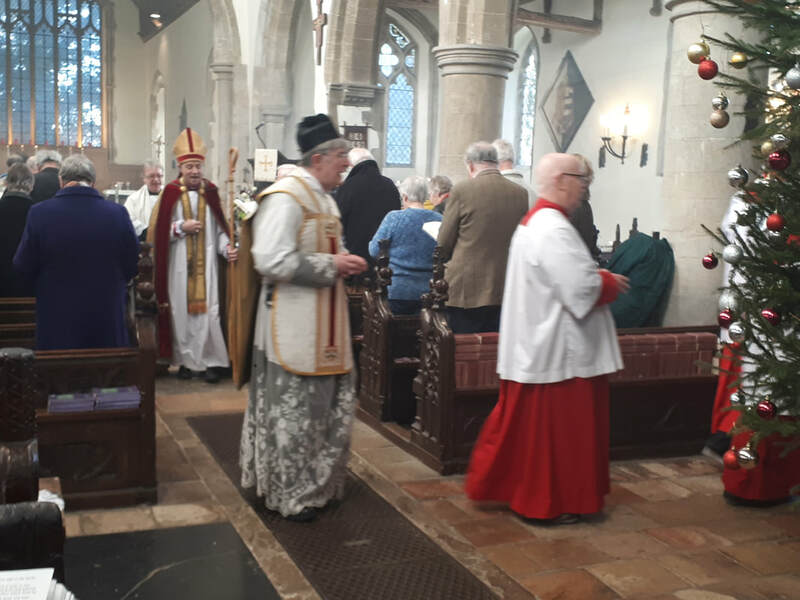 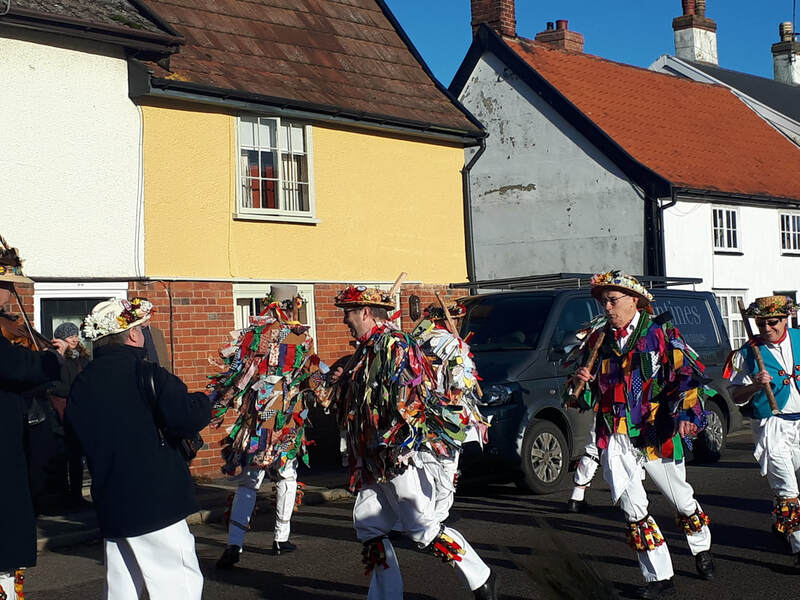 We welcomed +Mike Harrison, the Bishop of Dunwich, to preside from the throne and preach at the 9.30 Parish Mass, celebrated by Fr Philip and, as has been our custom for many years, welcomed the East Suffolk Morris Men who danced in the Mass. 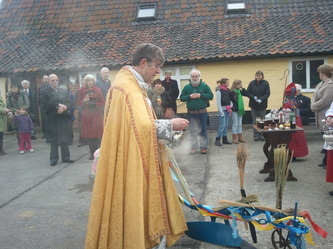 +Mike blessed the Epiphany House, chalk for marking the lintels of houses and finally the decorated plough, which was taken in procession after Mass around Front Street and Old Market Street. 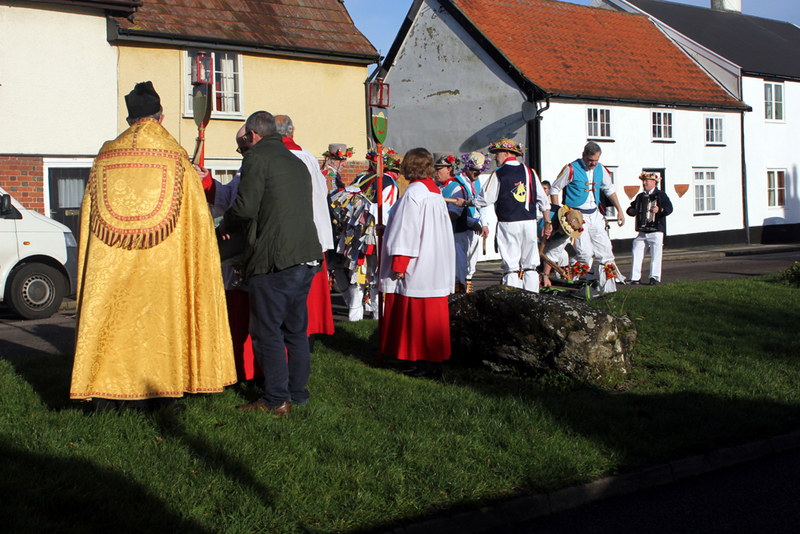 There was a prayer of blessing at the village sign in Old Market Street and more Morris Dancing and the procession concluded at The King's Head, where Paul offered his usual generous hospitality. 'A long time ago a woman named Mary and her husband Joseph travelled to Bethlehem to pay their taxes. Mary was soon to have a baby so she rode on a donkey. 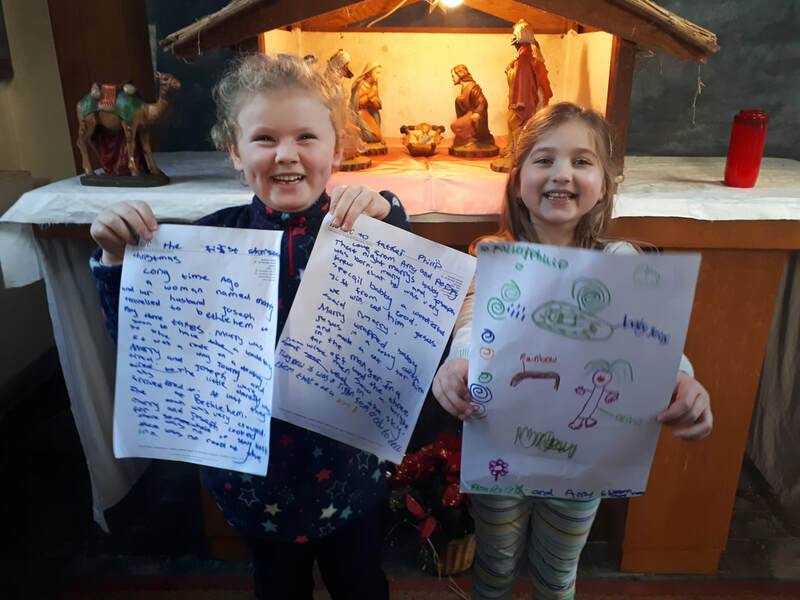 It was a long journey and Mary and Joseph were tired. The little donkey was tired too. 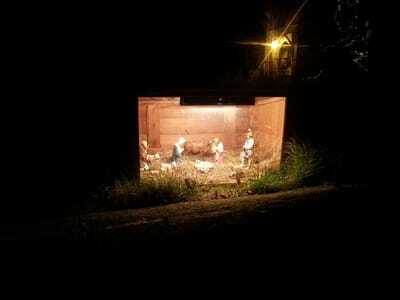 At last they arrived at Bethlehem. The town was very crowded. 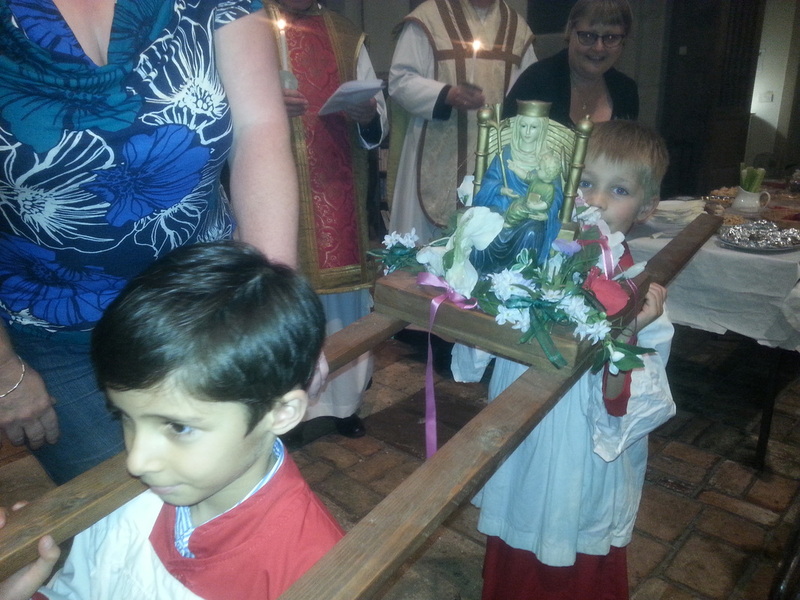 Mary and Joseph looked for somewhere to stay but there was o room at the inn. 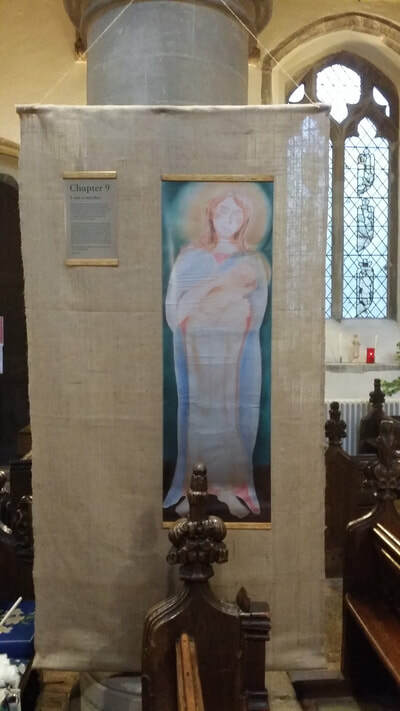 That night Mary's baby was born. Mary and Joseph knew he was a special baby, a wonderful gift from God. 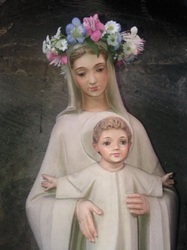 "We will call him Jesus," said Mary. Mary wrapped baby Jesus in a cosy cloth and made a cot for him in the manger. 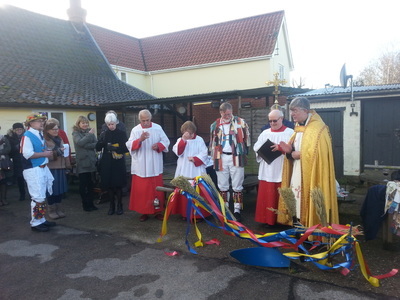 The Blessing of the plough is an ancient ceremony asking God's blessing on the land. Once again we welcomed East Suffolk Morris Men, who carried the decorated, vintage plough into church and danced in the Mass. 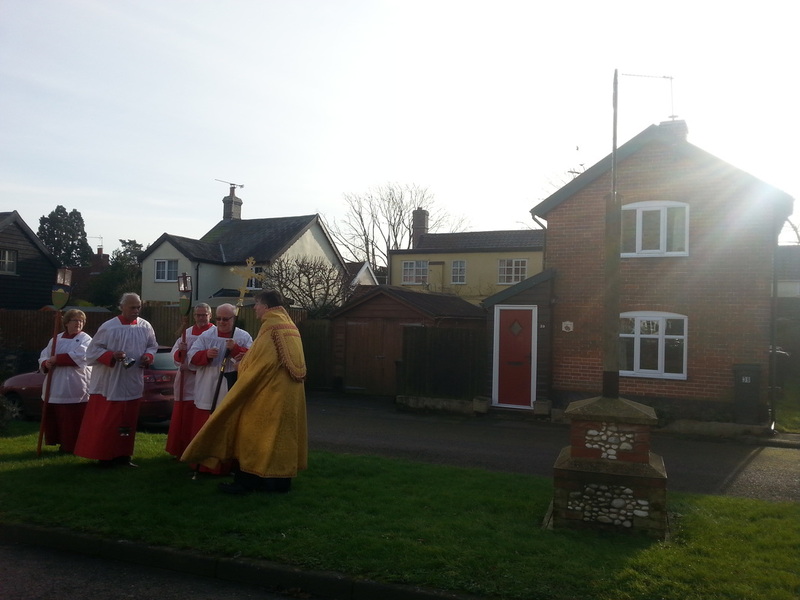 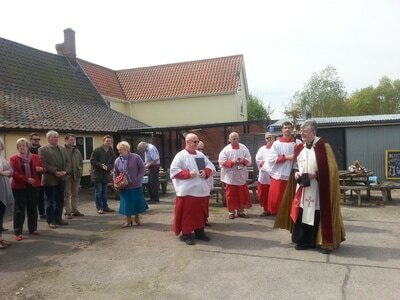 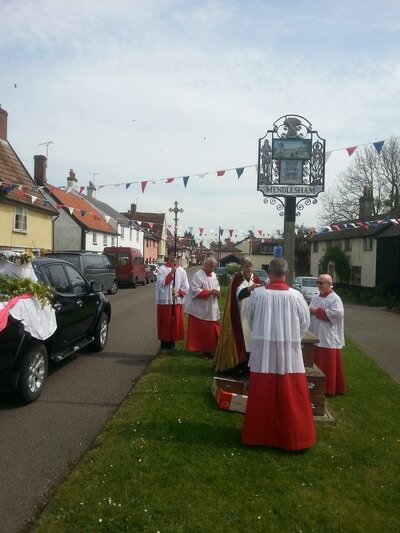 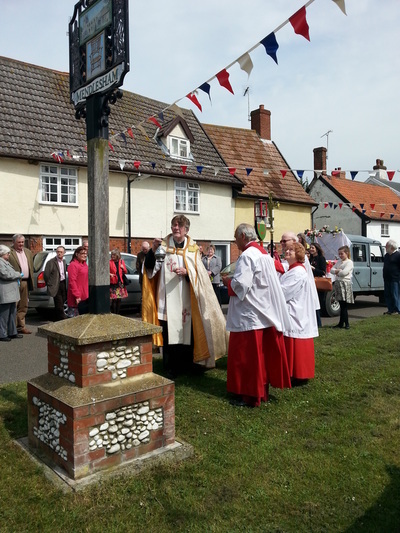 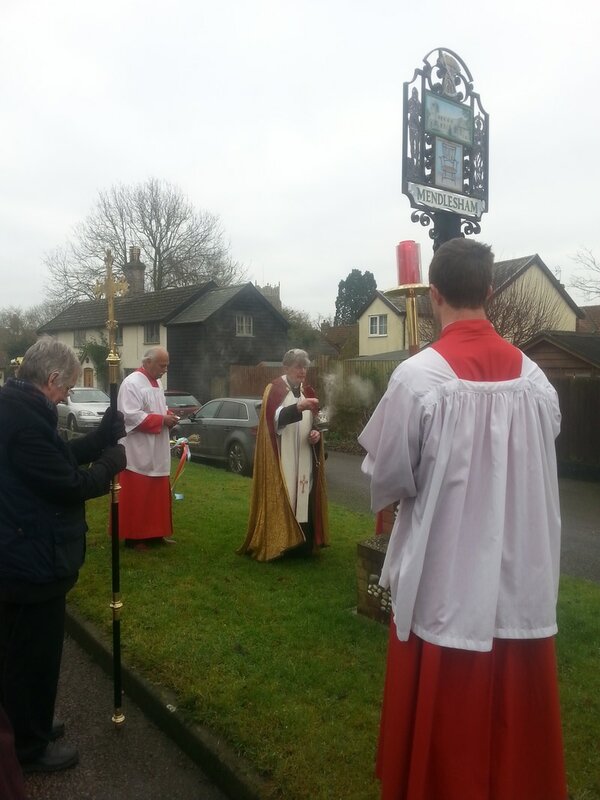 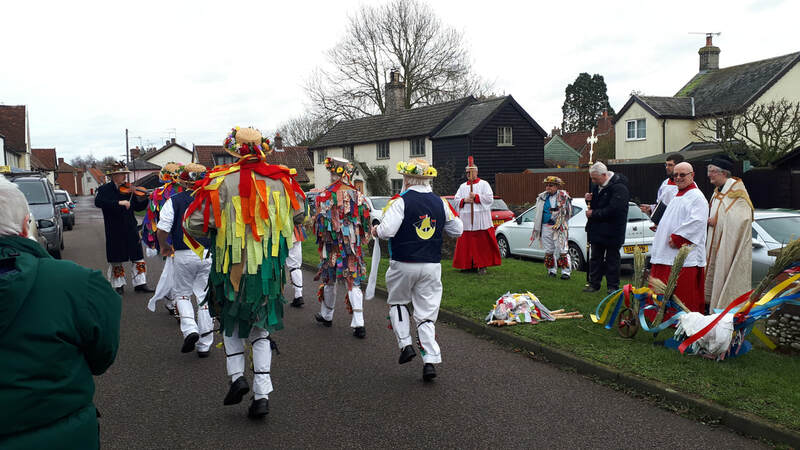 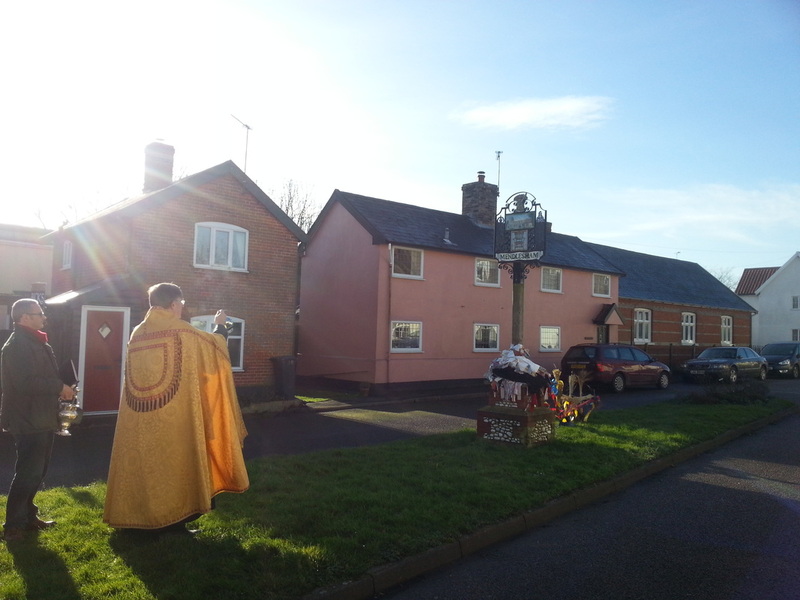 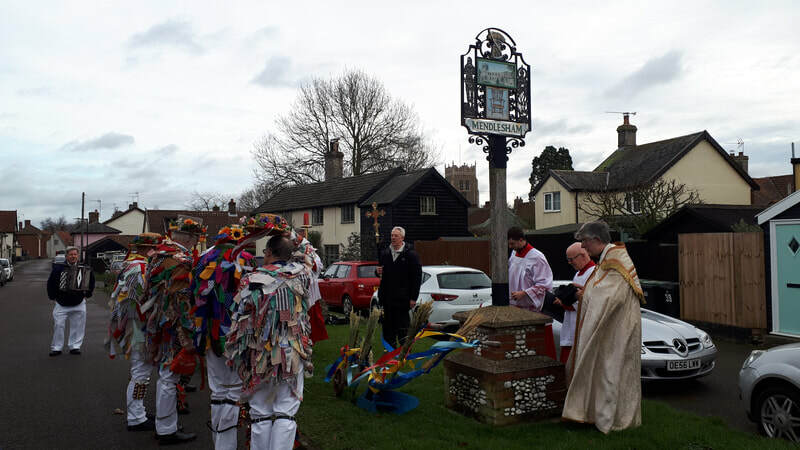 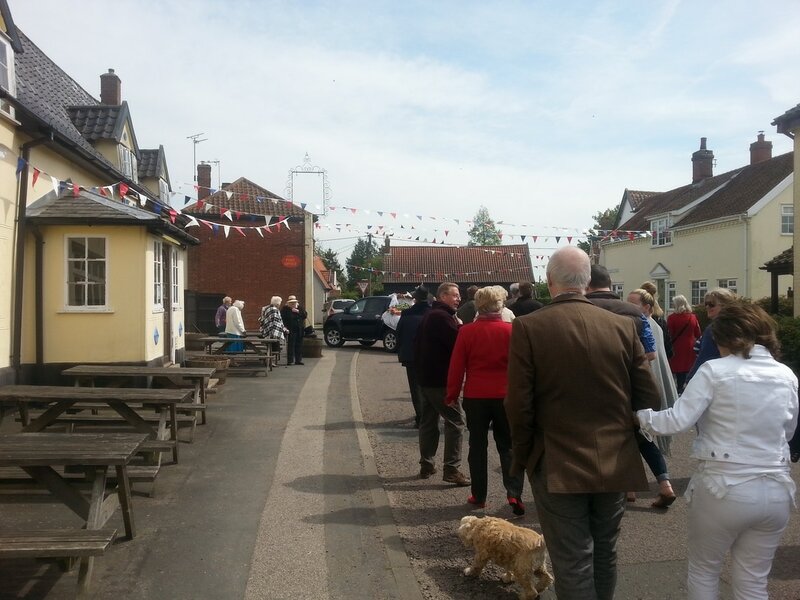 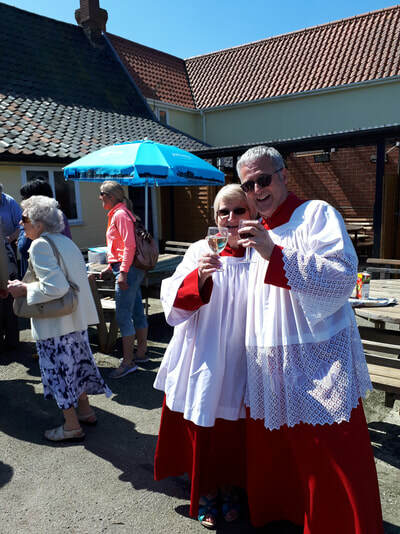 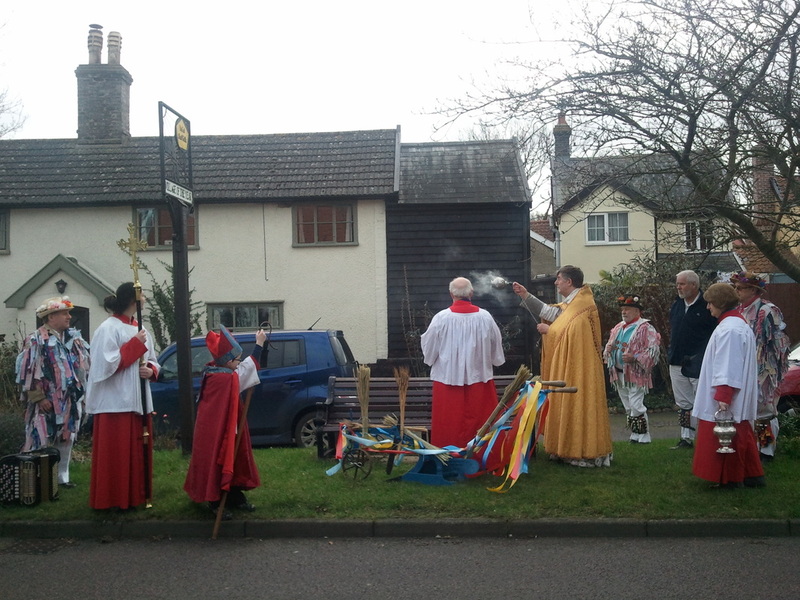 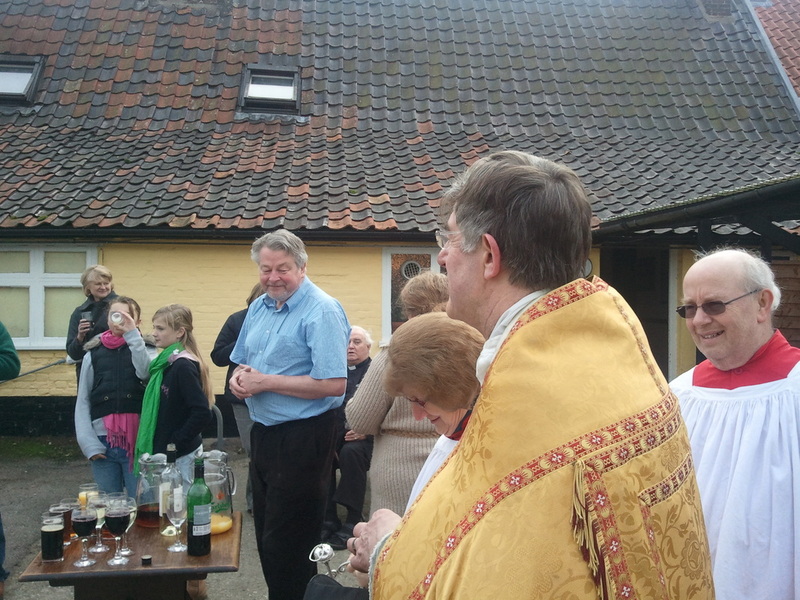 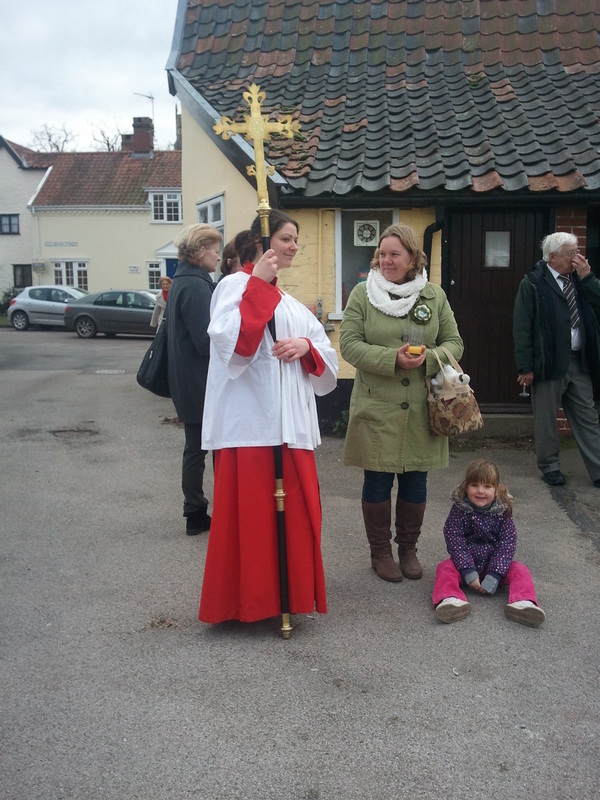 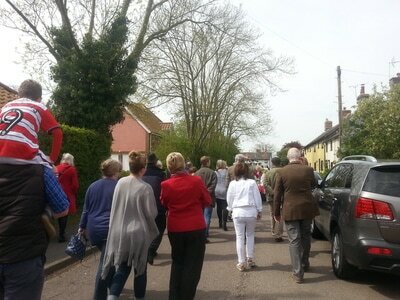 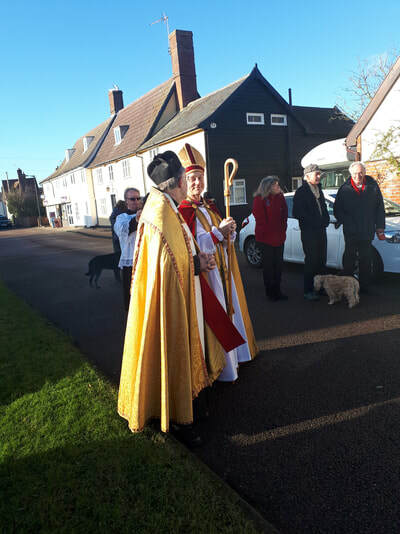 After Mass followed a procession of the plough around the village, a prayer of blessing at the village sign and further dancing by ESMM both there and at The King's Head, where Paul, the landlord, hospitably offered welcome refreshment. 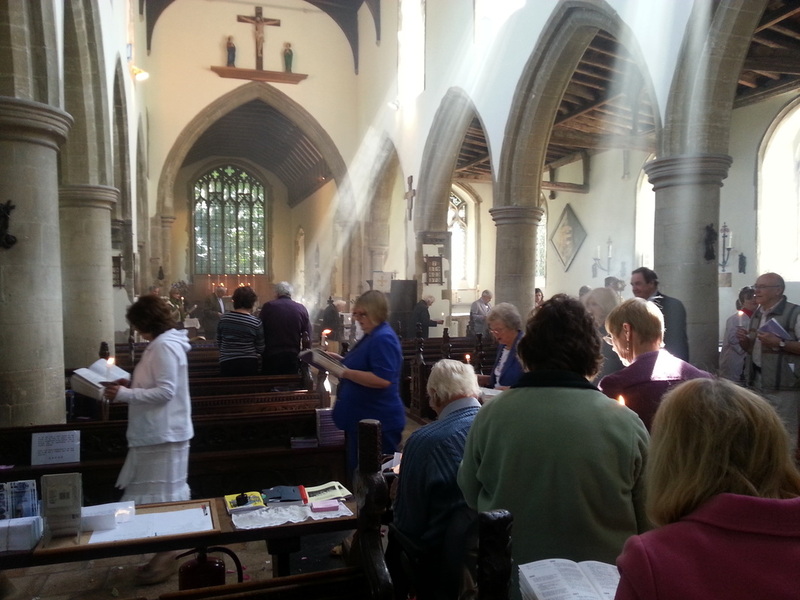 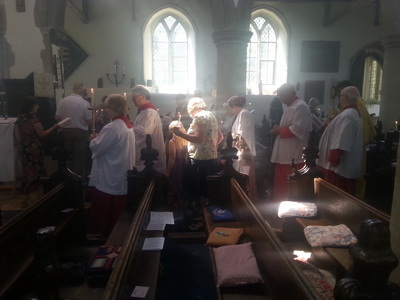 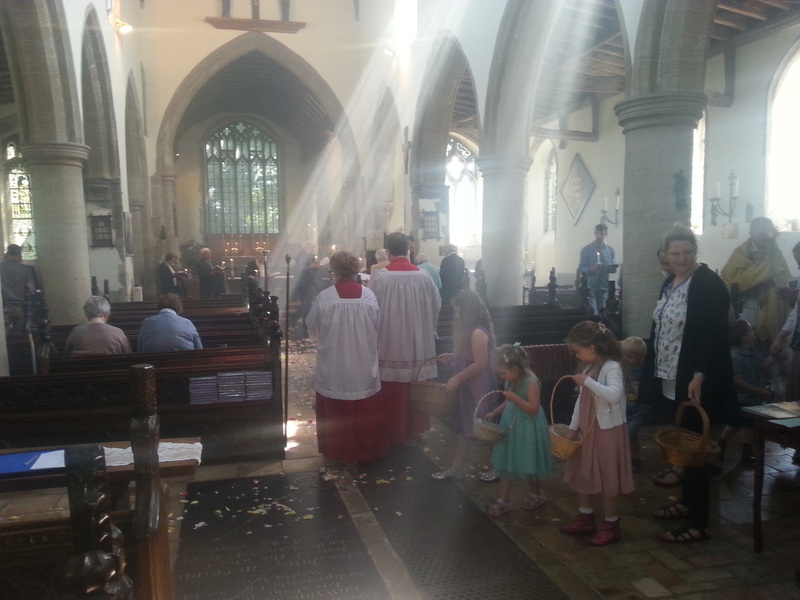 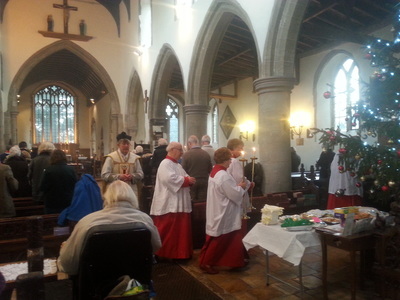 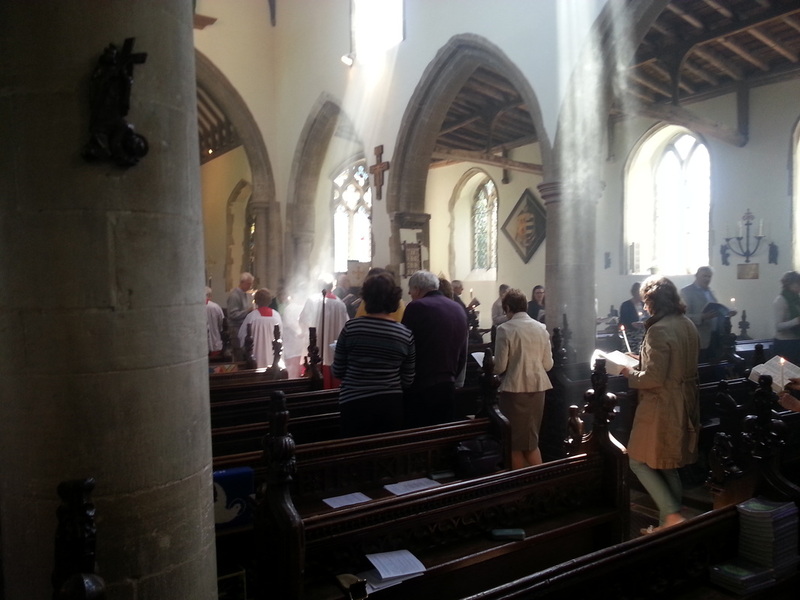 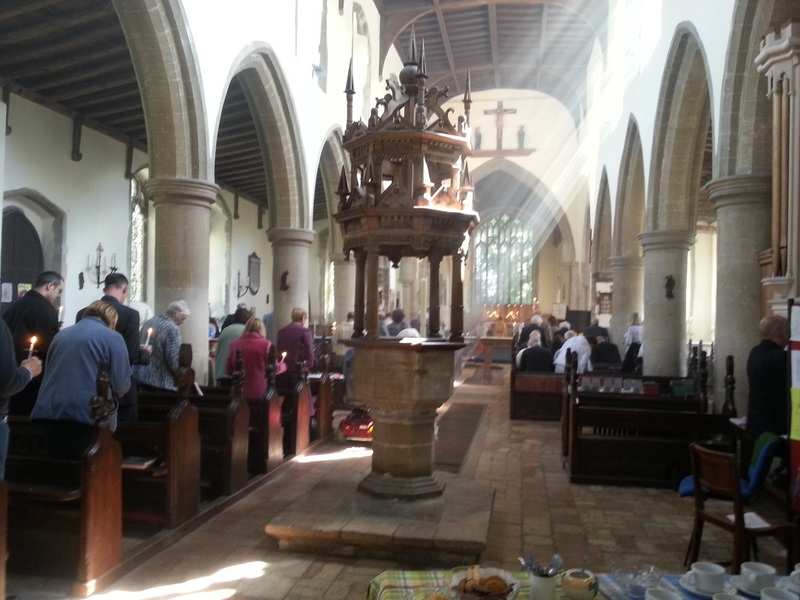 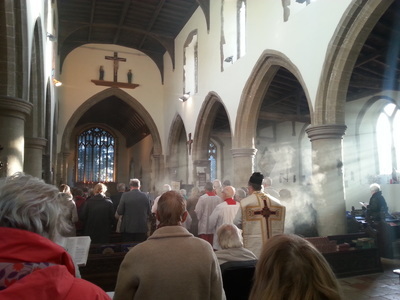 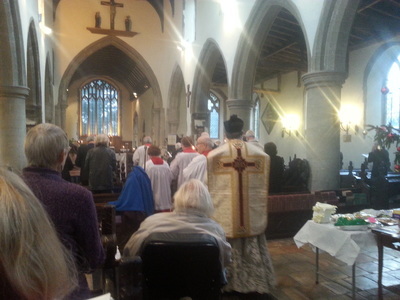 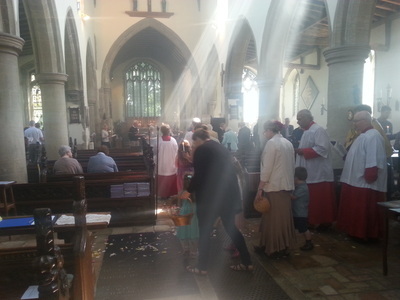 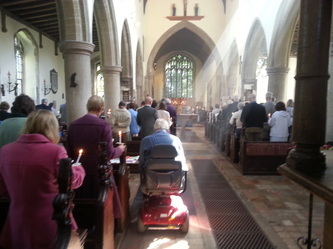 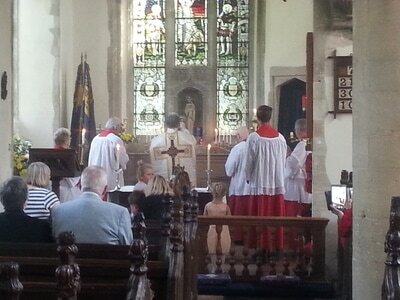 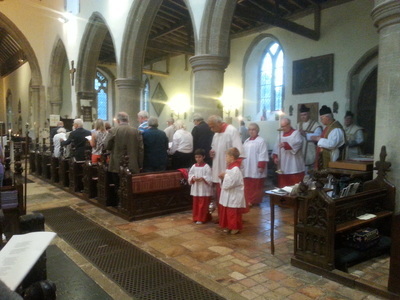 ​The celebration concluded with a shared buffet lunch in church. 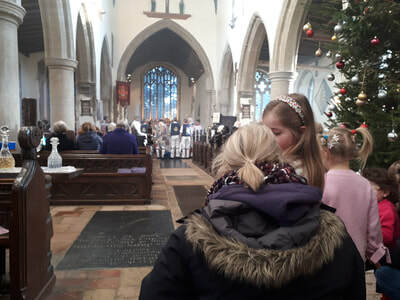 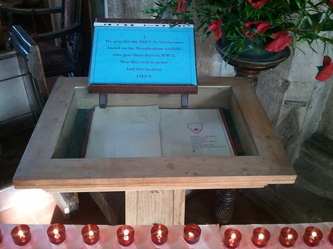 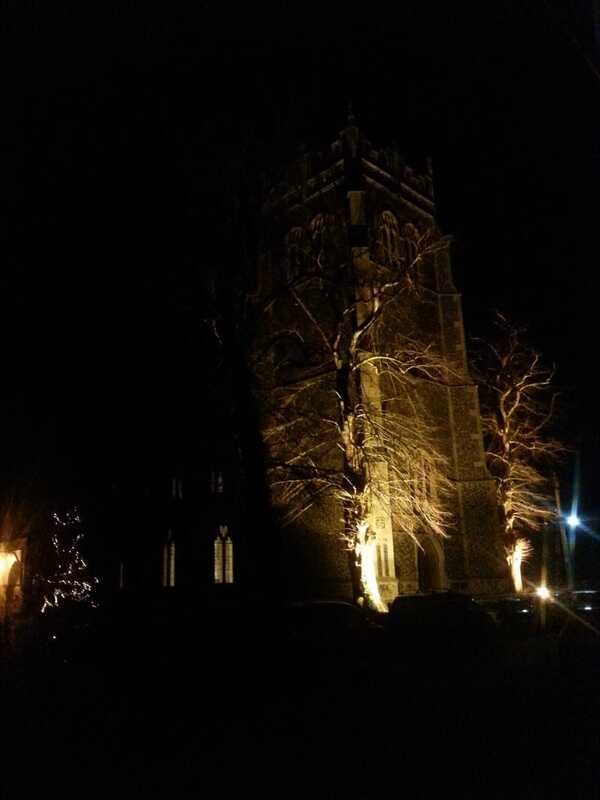 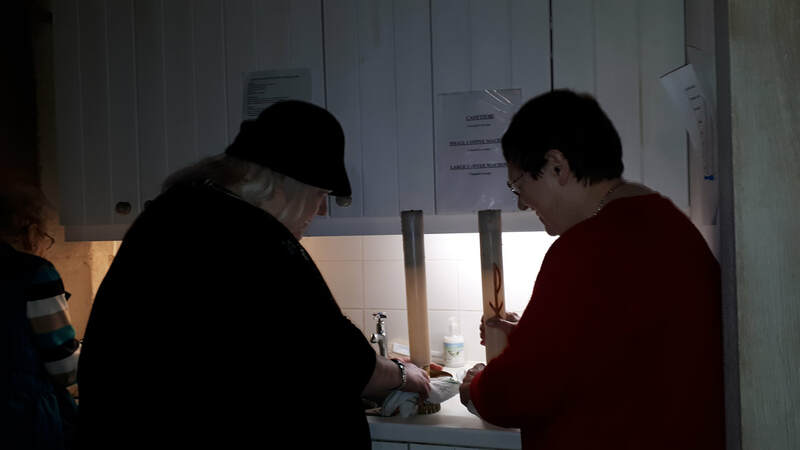 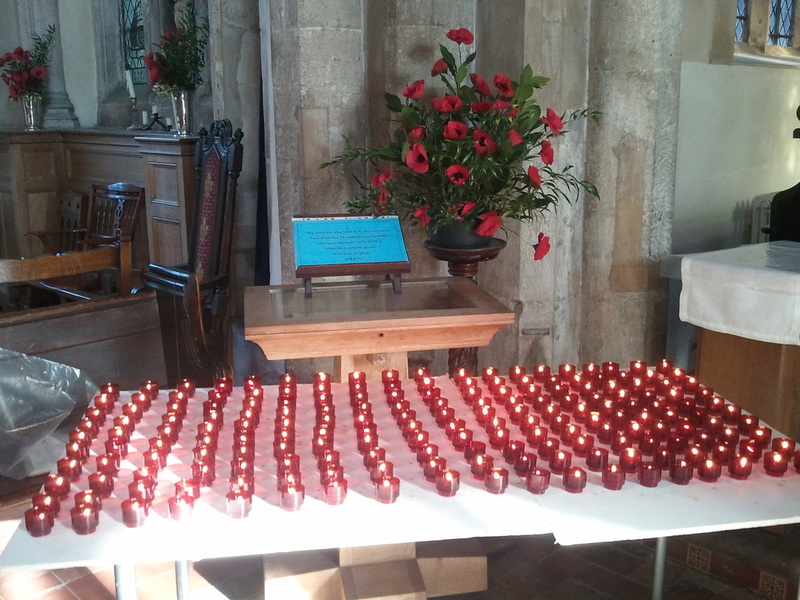 On Saturday 25th November there was a Service of Light for parents or relatives of children who have died, ​whether through illness, accident, trauma, cot death, stillbirth miscarriage or any other way, - however long ago. ​The service finished quietly, to allow space for people either to leave silently or remain for a while in the peace of the church, but an opportunity was provided afterwards for any who wanted to receive the laying on of hands & anointing for healing or to a sympathetic listener. 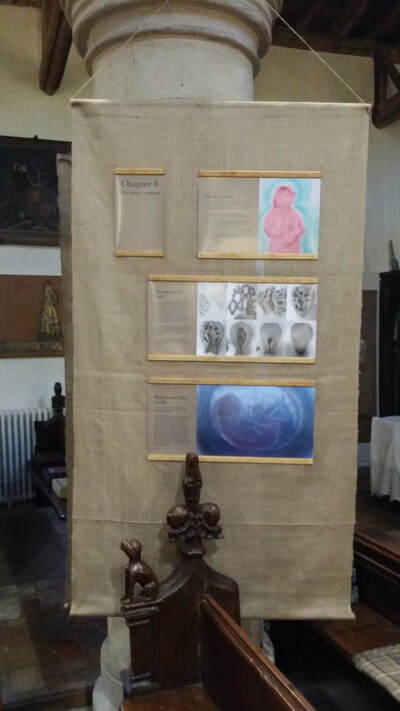 The exhibition, staged from 21st November - 1st December 2017 portrayed an eight year long journey of coming to terms with a child loss caused by a miscarriage. 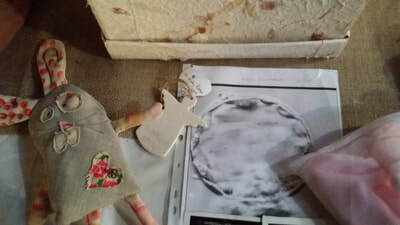 We are grateful for Marie for sharing this pictorial diary of her journey. 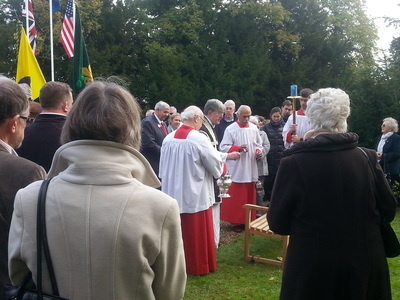 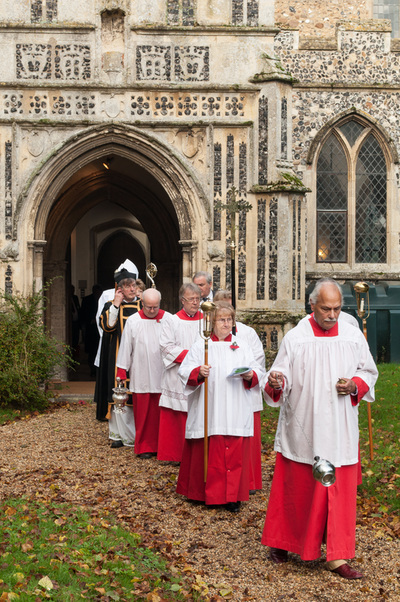 On Sunday 12th November there was a Sung Mass of Requiem for all who laid down their lives in war. 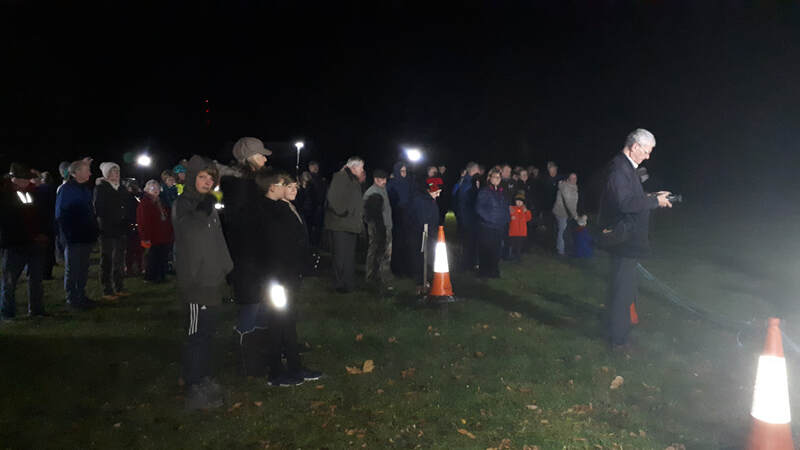 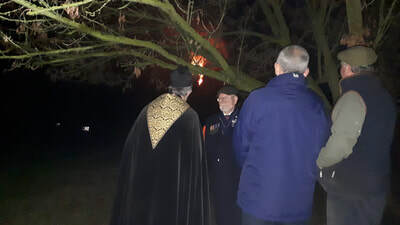 It was attended by the Mendlesham Explorers, Scouts and Cubs and representatives from the Parish Council, Community Council and the USAF. 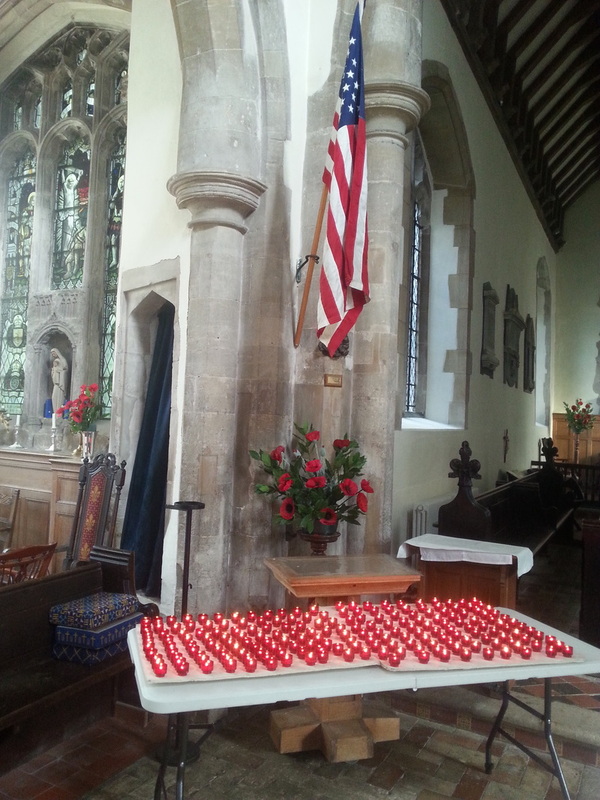 Candles were lit for each of the 24 from the parish who were killed in WW1, 9 in WW2 and 1 in the Korean War and also for the 288 USAAF servicemen stationed at Mendlesham who gave their lives. 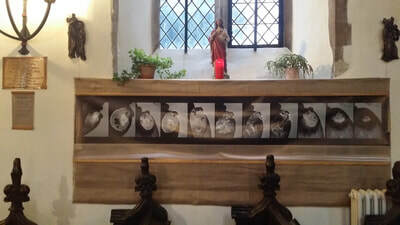 (Recent research has revealed more names than previously known.) Wreaths were laid and 2 minutes silence kept. 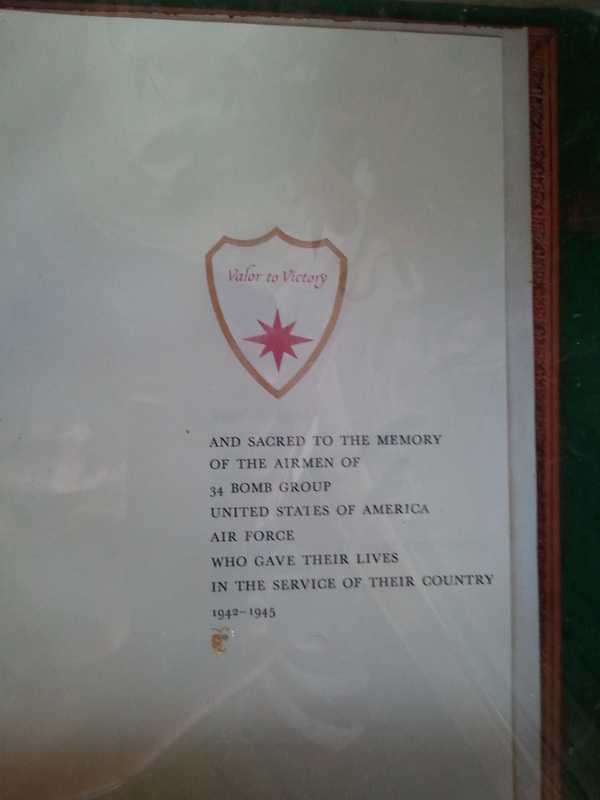 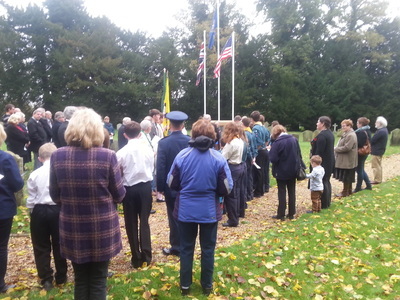 This was followed immediately by a short act of Remembrance at the US memorial in the churchyard. We welcomed Captain Erica Middleton of the USAF stationed at Lakenheath who laid a wreath, together with representatives from Mendlesham and Wetheringsett parish councils. 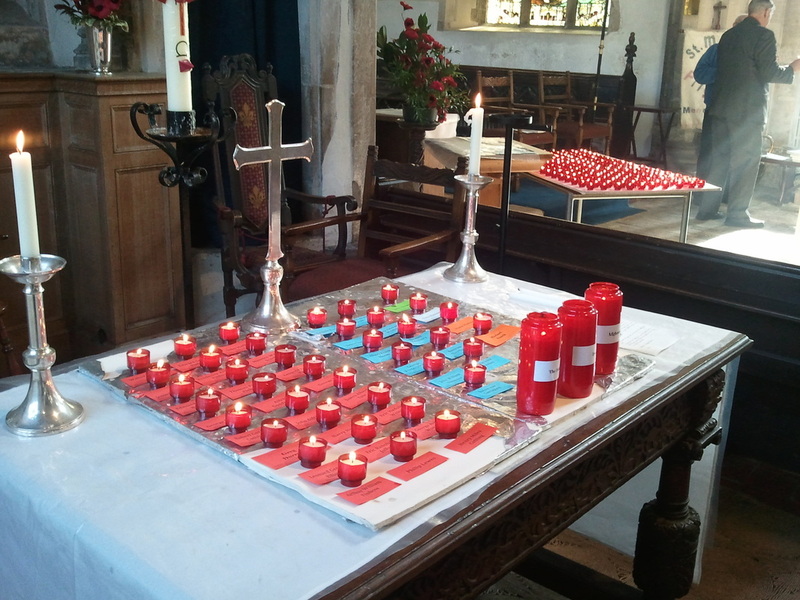 On Friday 10th November there was a Remembrance Service in St Mary's for Mendlesham School, when the same number of candles were lit and pupils read the lessons. 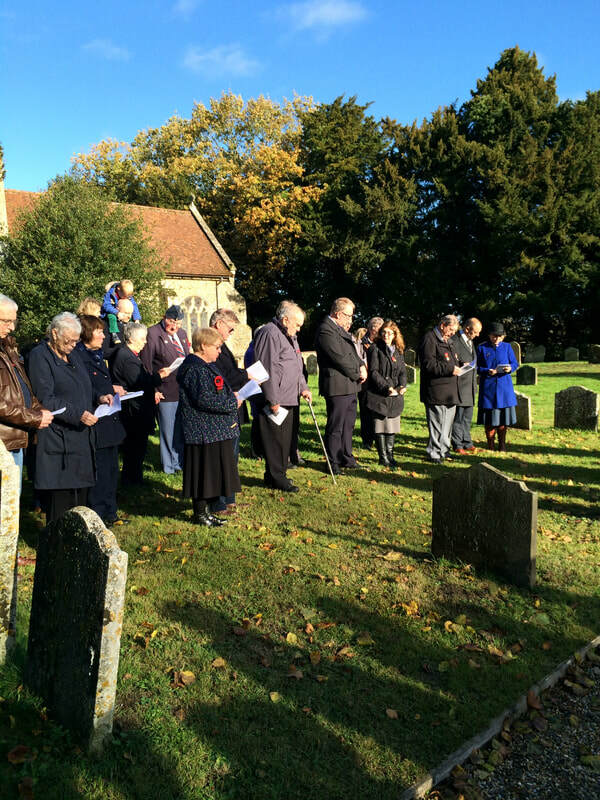 2 minutes' silence was also observed. During the 9.30 Parish Mass, Fr Philip crowned the statue of Our Lady, patron saint of our church and then crowned Poppy as May Queen to represent her and Amy and Lily as attendants. We then processed around the village. 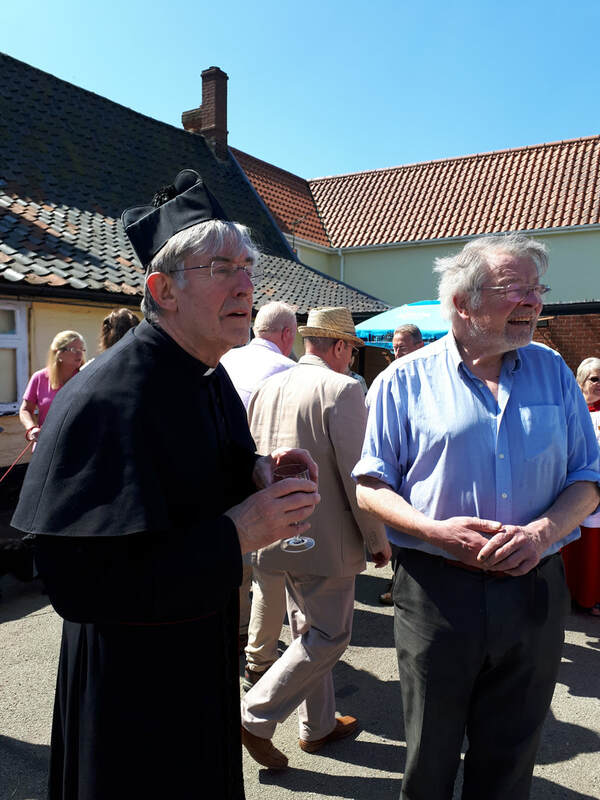 Fr Philip said a prayer and blessing for the village at the sign in Old Market Street and the procession finished at The King's Head, where Paul kindly provided drinks for all. A shared buffet lunch in church concluded the celebration. 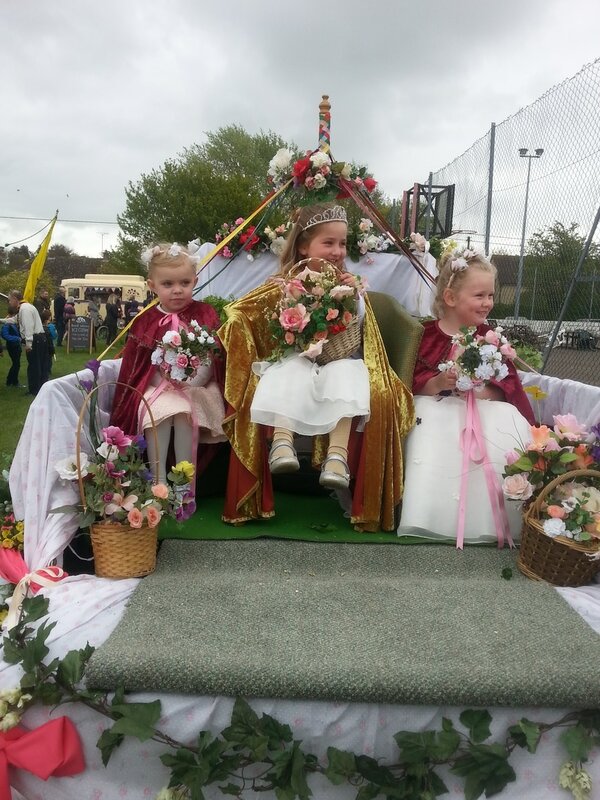 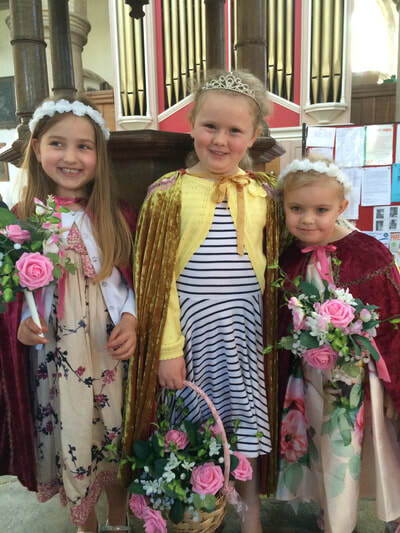 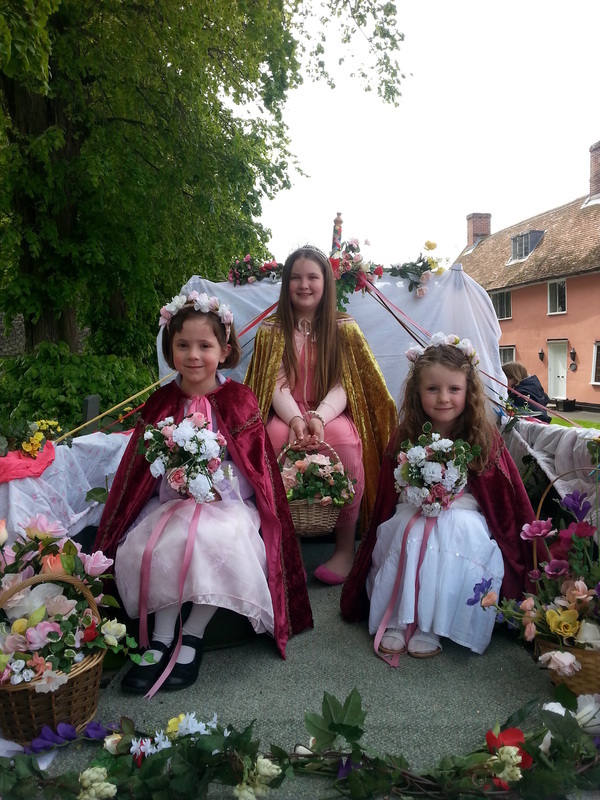 On Monday 1st May, our May Queen and her attendants took part in the village Street Fayre. 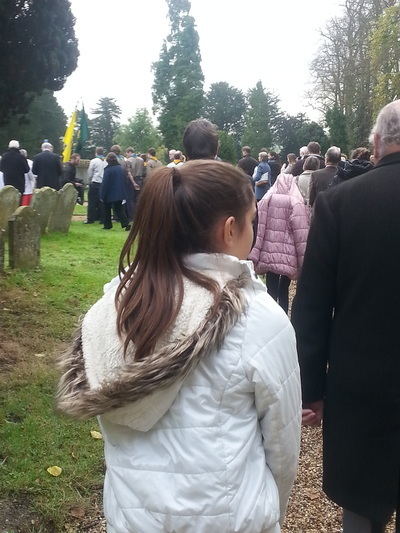 ​On Friday 11th November pupils and staff of Mendlesham School, together with parents and grandparents attended St Mary's for a Service of Remembrance. 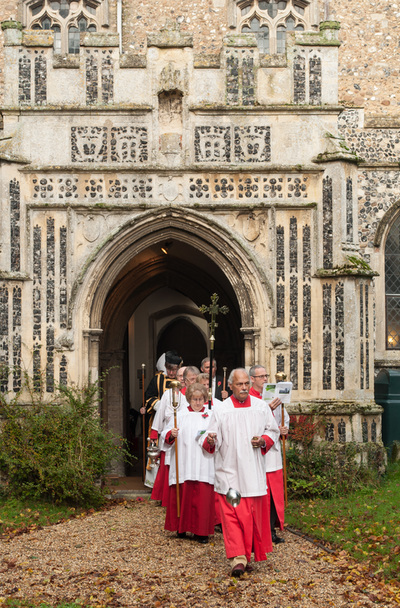 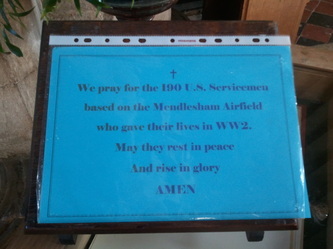 On Sunday 13th November there was a Sung Mass of Requiem attended by a large number of parishioners as well as 1st Mendlesham Scouts and included lighting of candles for all the Fallen; all those whose names are recorded on the Parish War Memorial and the 190 US airmen based at Mendlesham Airfield, laying of wreaths at the parish memorial and 2 minutes' silence, followed by laying of a wreath by the US memorial in the Churchyard. 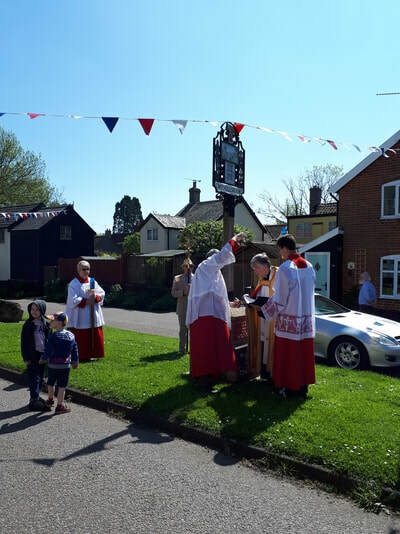 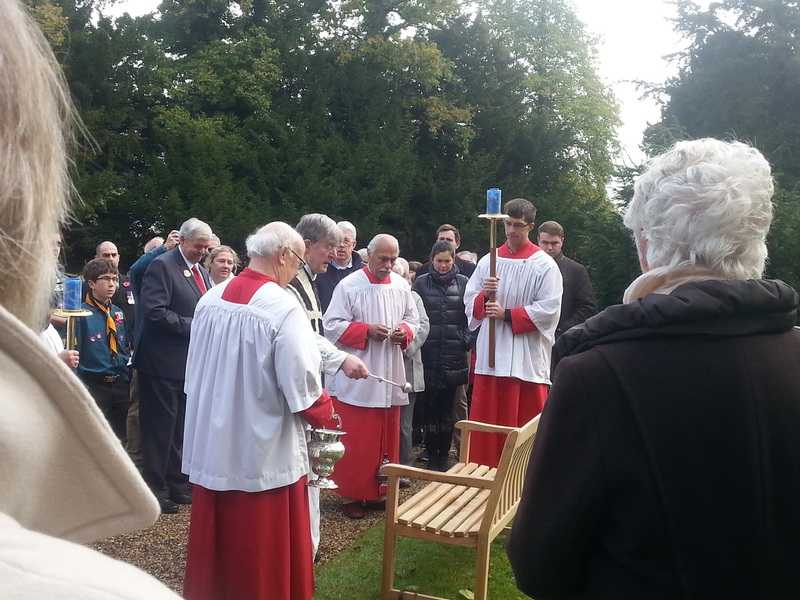 ​Afterwards Fr Philip blessed a churchyard seat presented by Mendlesham Community Council to commemorate HM Queen Elizabeth's 90th birthday. 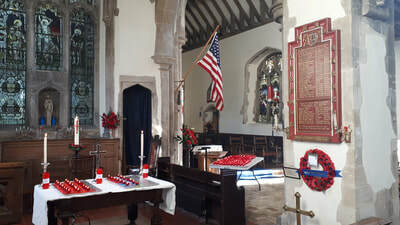 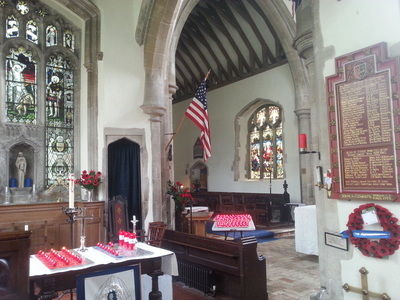 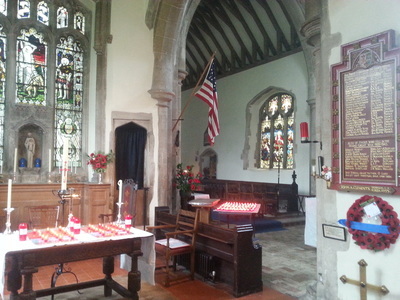 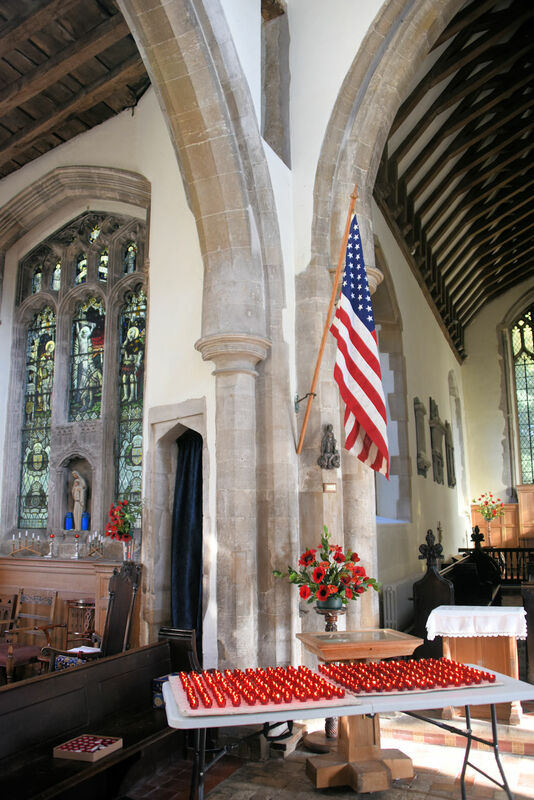 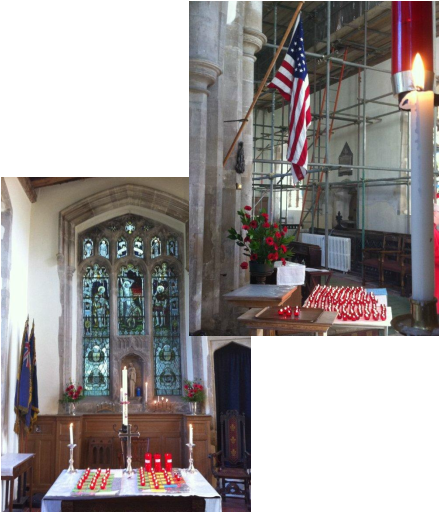 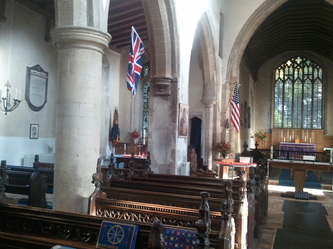 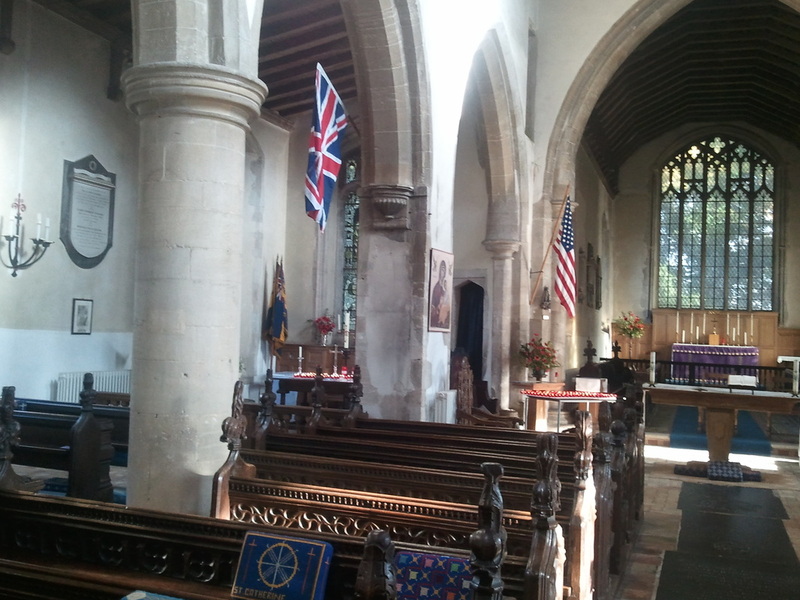 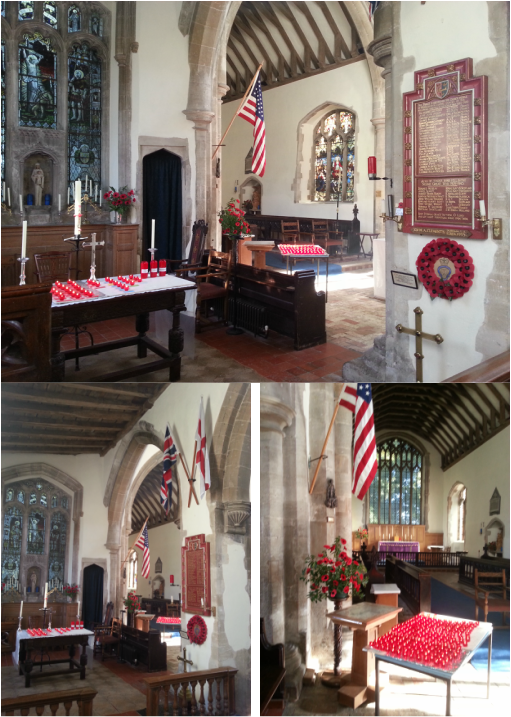 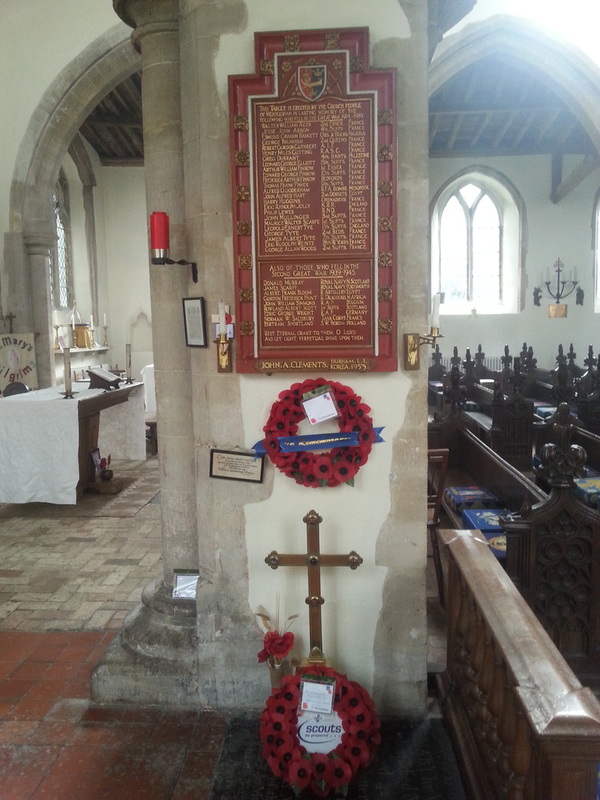 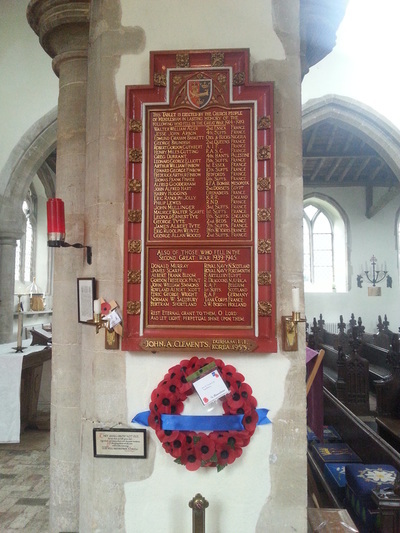 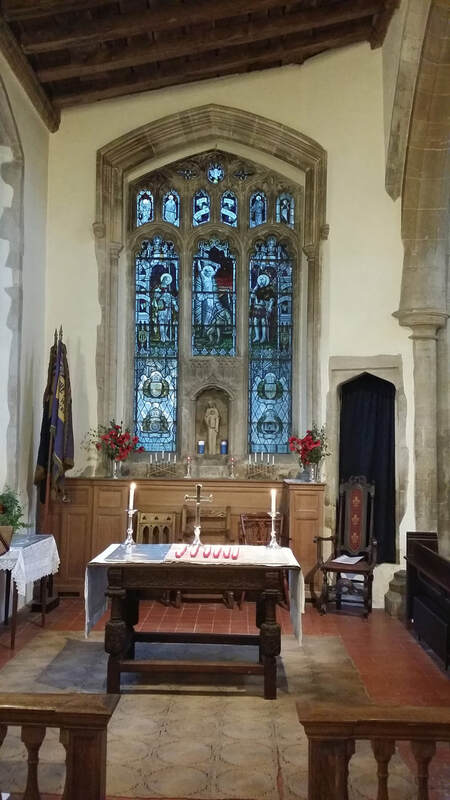 At 9.30 there was a Solemn Requiem Mass for the Fallen in War, laying of a wreath on behalf of Mendlesham Parish Council by the Parish memorial in church, 2 minutes' silence and lighting of candles for those from Mendlesham who gave their lives in WW1, WW2 & the Korean War + the 190 from the USAAF 34th Bombardment Group stationed at Mendlesham Airfield who gave their lives in WW2. 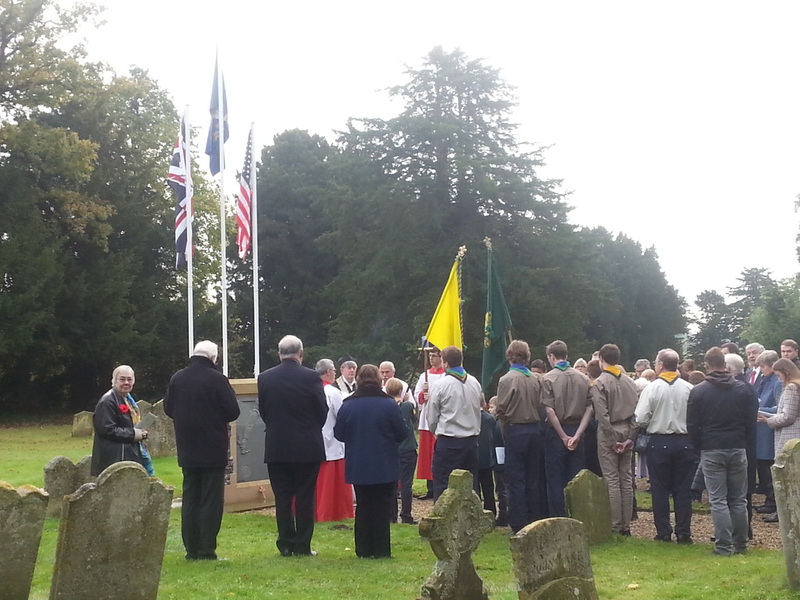 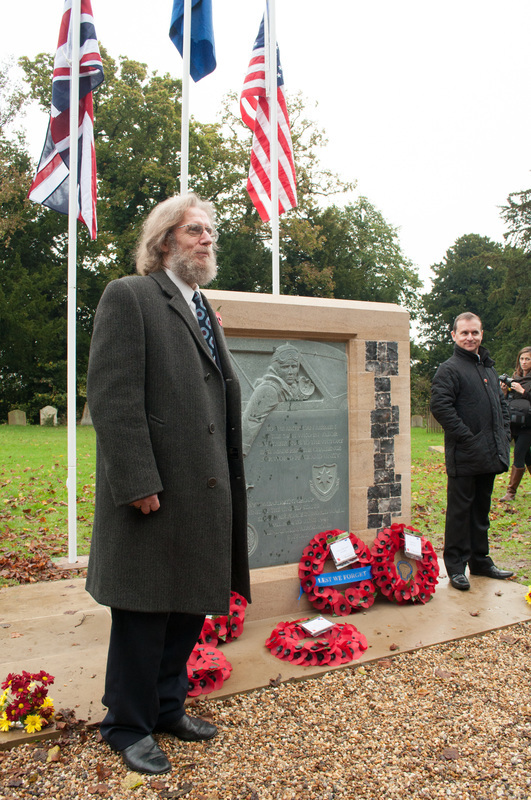 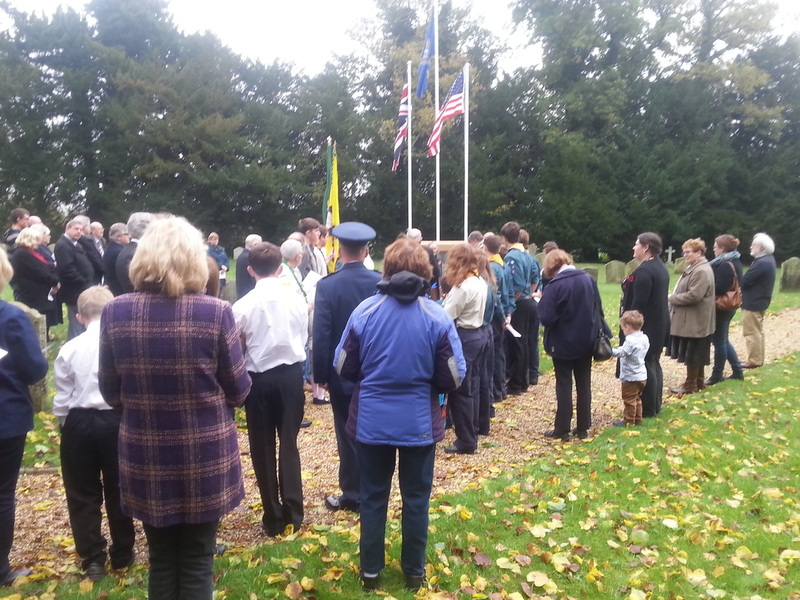 This was followed by a short act of remembrance and laying of wreaths on behalf of Mendlesham and Wetheringsett Parish Councils and the USAAF (Represented by Lt Col Grant Bucks of 48 FW, RAF Lakenheath) by the US memorial in the churchyard. 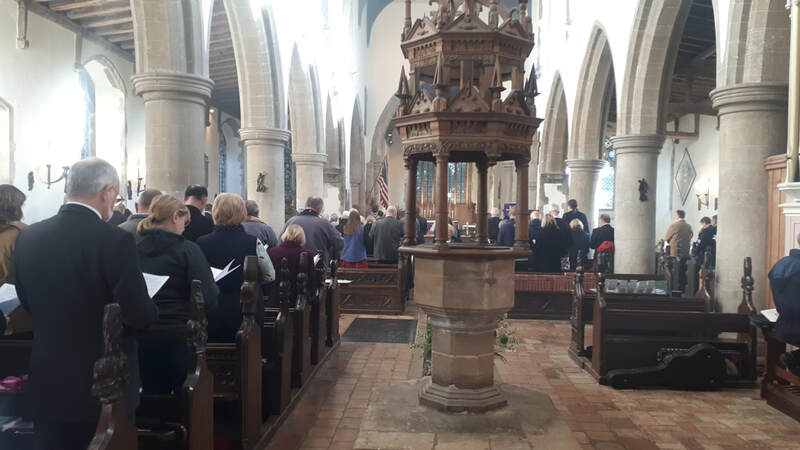 At 10.40 Mendlesham Community School held a Remembrance Service in St Mary's church including 2 minutes' silence and lighting of candles as in the Sunday Requiem. A short act of remembrance followed at the US memorial in the churchyard. 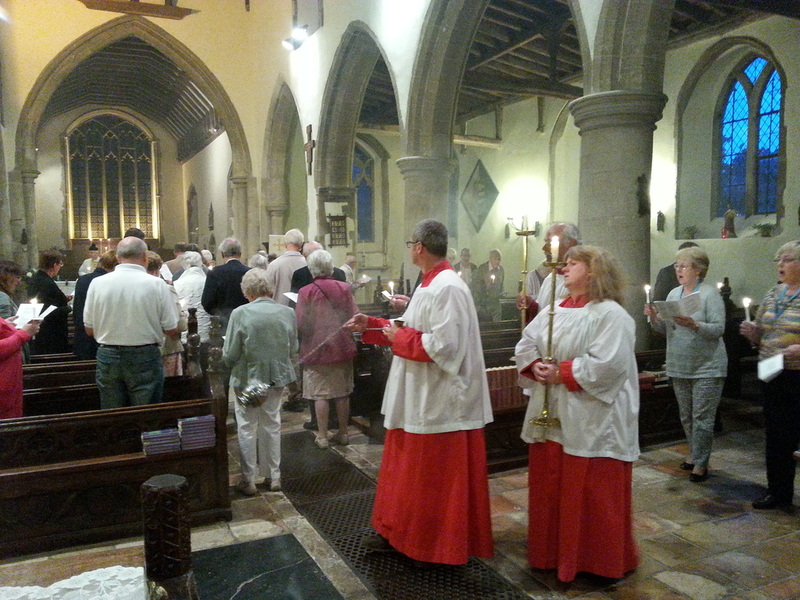 We celebrated a wonderful Patronal Festival weekend from 14th - 16th August with festival worship, procession & Benediction, blessing of our own locally-brewed Real Ale, a spectacular firework display to music and a Sunday afternoon concert in the churchyard: 'Sounds of the Sixties' by local group The Buzz, with homemade teas, beer, wine and soft drinks. 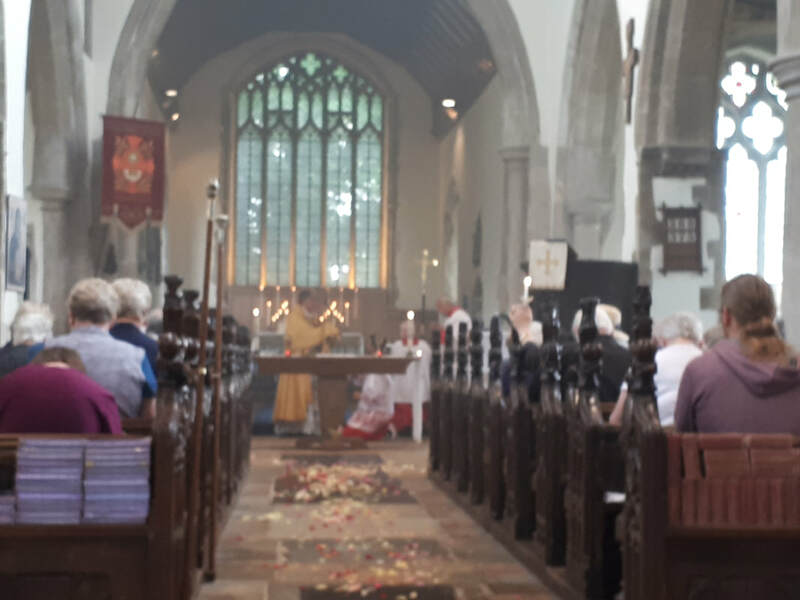 Our Corpus Christi procession took place on Sunday 7th. 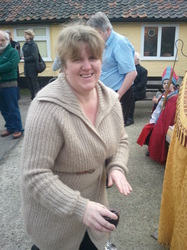 June at the end of the Parish Mass. 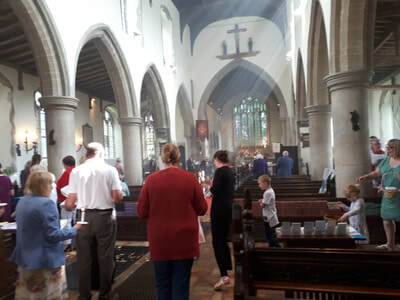 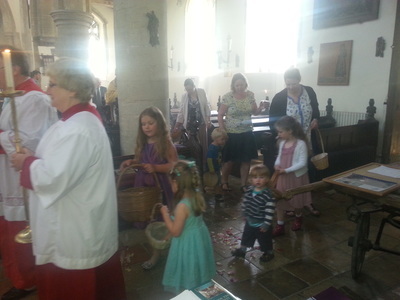 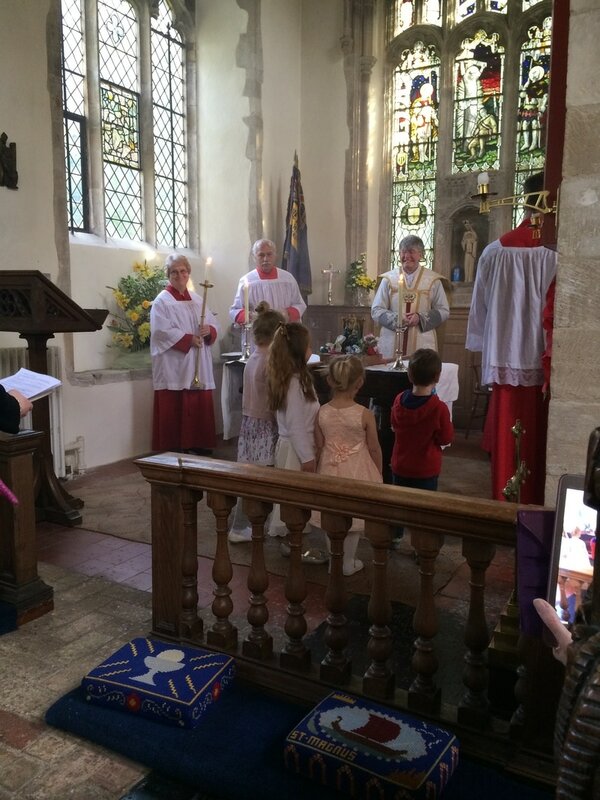 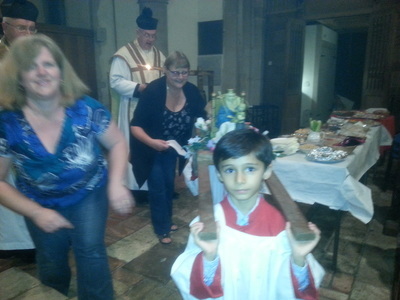 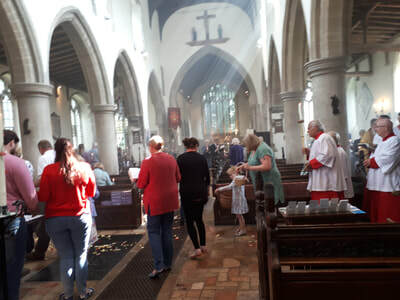 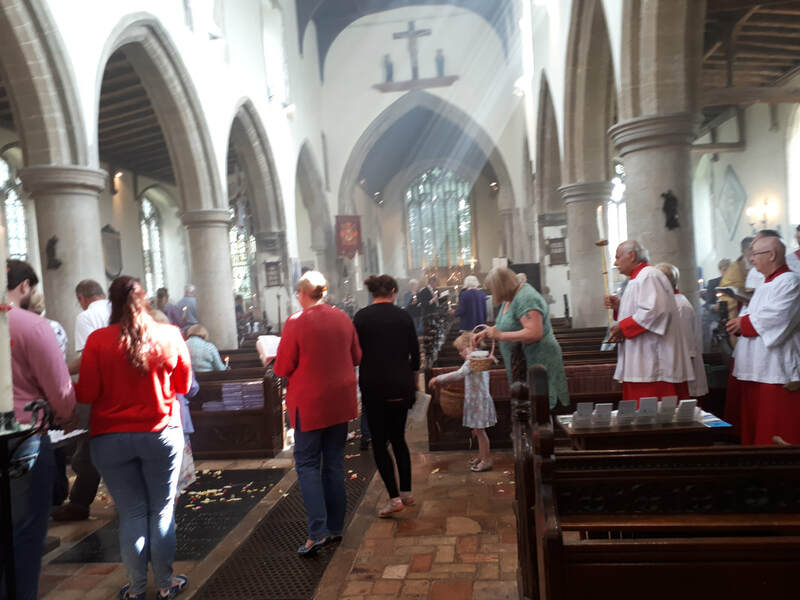 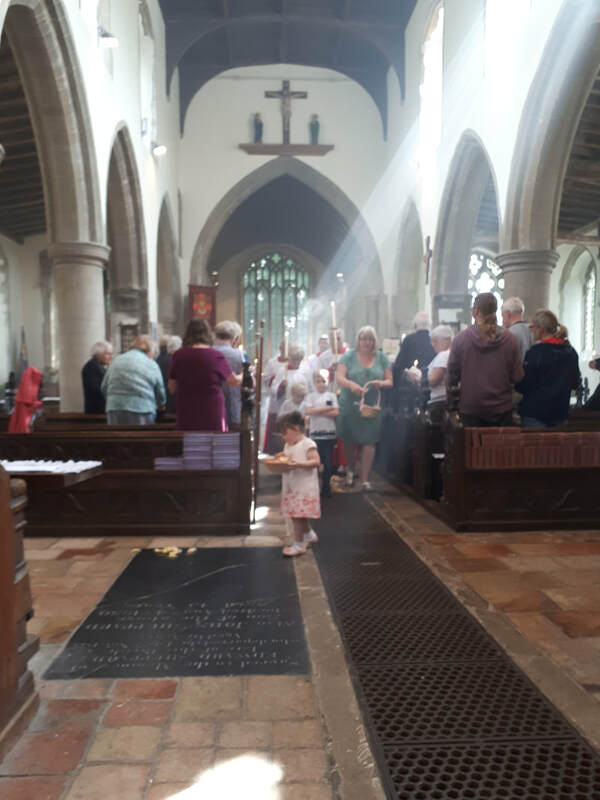 The children scattered flower petals to make a carpet of honour for the Blessed Sacrament and the congregation followed with lighted candles as a sign of honour to Our Lord present in a real, mystical way in the consecrated bread of Holy Communion. It was symbolic of our mission to carry Christ to and find him in all we meet in our day-to-day lives. 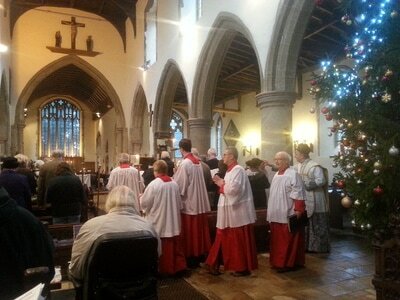 The procession concluded with Benediction - Our Lord's own blessing. 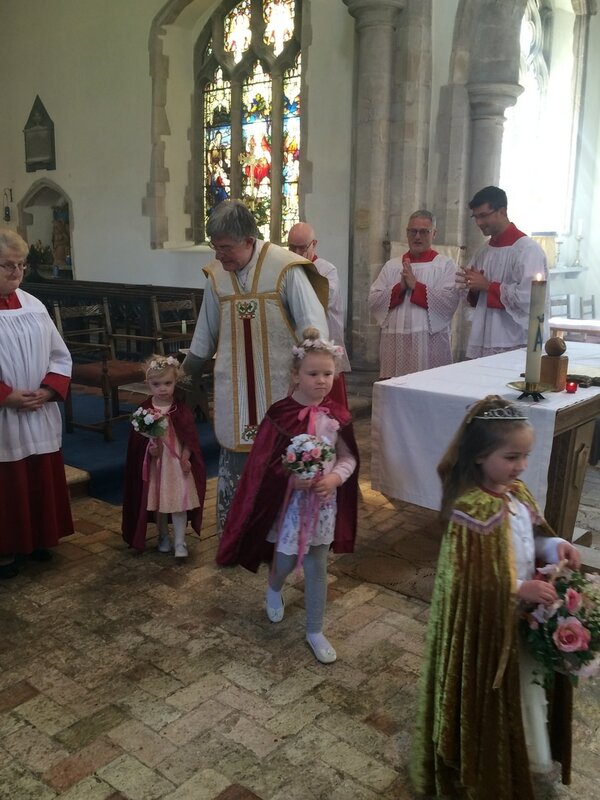 On Sunday 3rd May during the Parish Mass, Fr Philip crowned the statue of Our Lady and then crowned Bella as May Queen, representing Our Lady and Elena and Poppy as her attendants. After Mass, because of the rain we had only a short procession, finishing at The King's Head, where Paul kindly provided welcome refreshments. 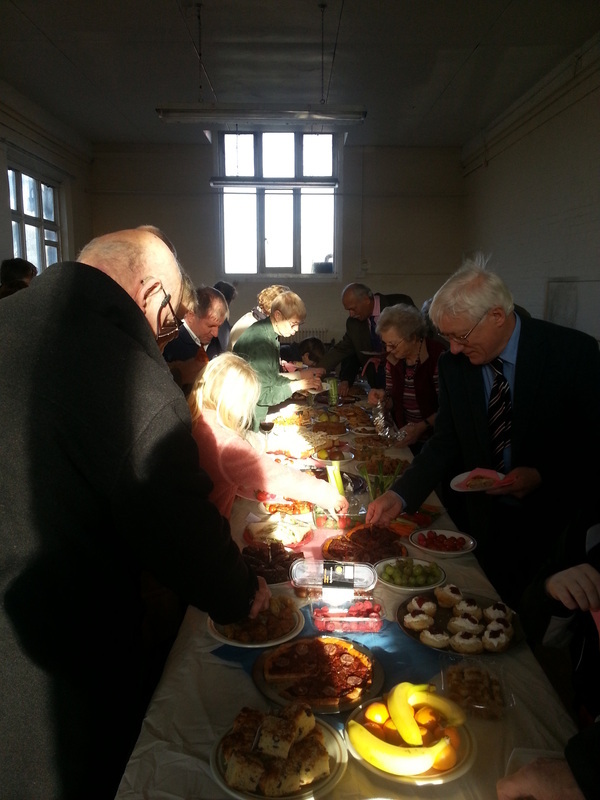 After that we went to St Joseph's Centre for a shared lunch. On Monday 4th May Bella, Elena and Poppy were able to ride on the decorated float when they took part in the village Street Fayre. On Remembrance Sunday, after the Parish Requiem Mass for all fallen in War, the memorial to the 190 US servicemen based at Mendlesham Airfield who had fallen in WW2 was dedicated by the Bishop of Richborough. 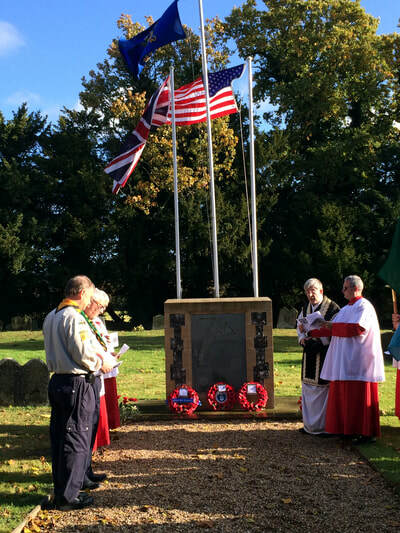 The day was the culmination of much work by the parish council in conjunction with Fr Philip and members of many village organisations and 2 veterans in a party of about 30 who had travelled from the US were amongst those who laid wreaths. 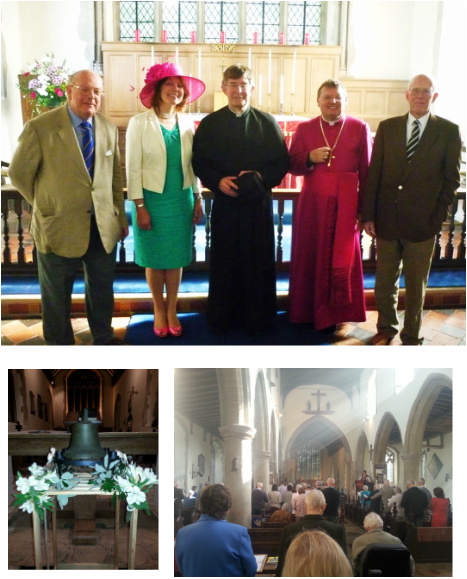 Photos below: After Parish Mass on 21st September: The Bishop of Richborough, Fr Philip & Anne with Hugh Cutting and Eric Bauly, who were churchwardens when Fr Philip was instituted in 1974. 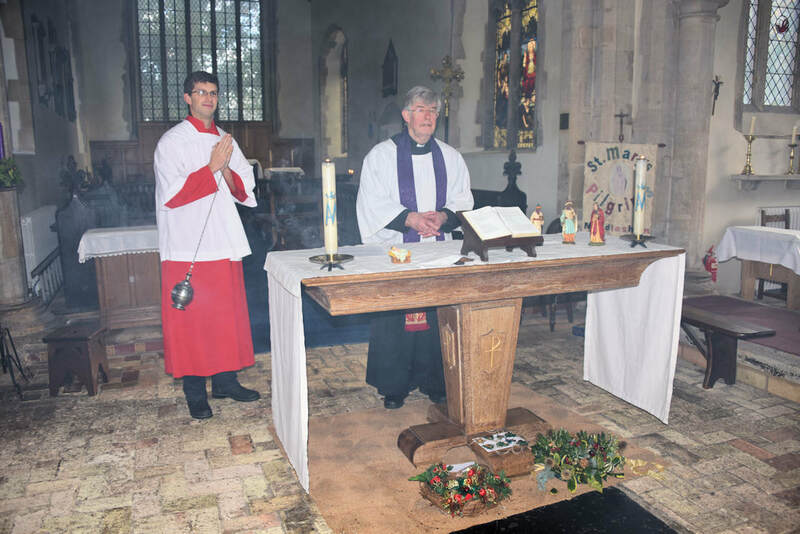 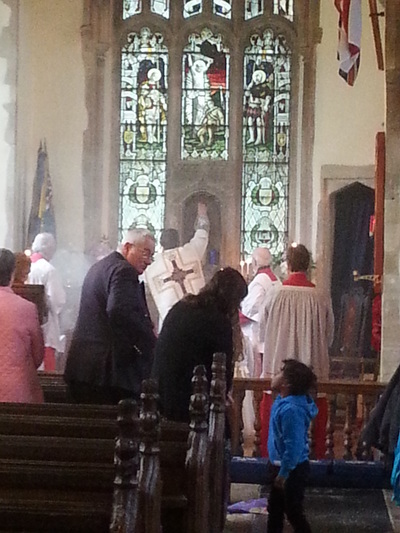 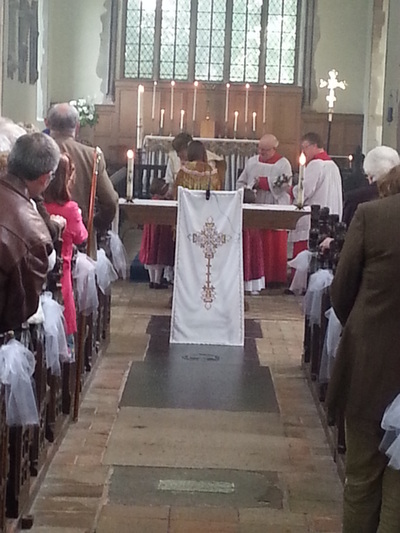 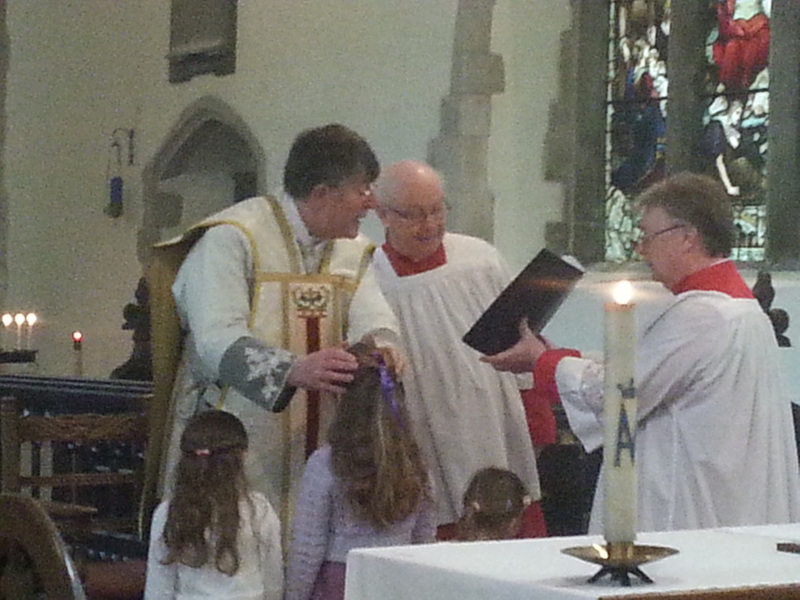 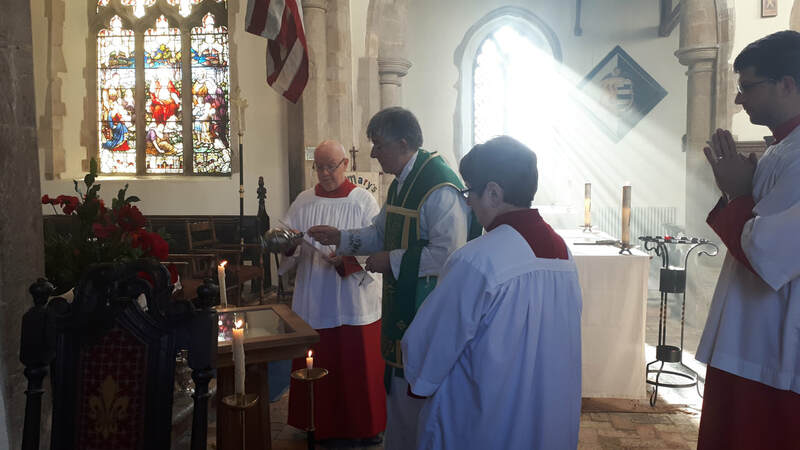 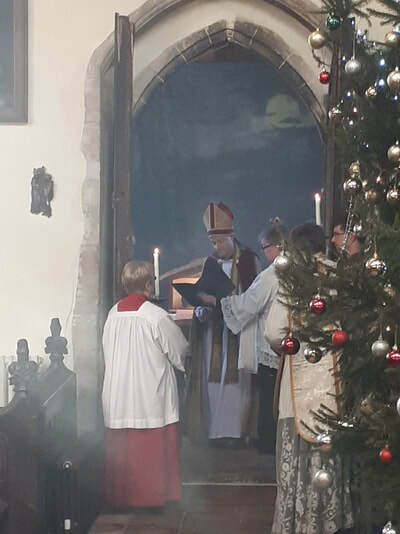 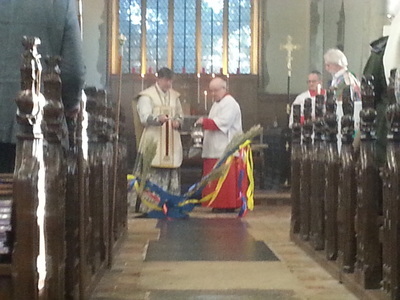 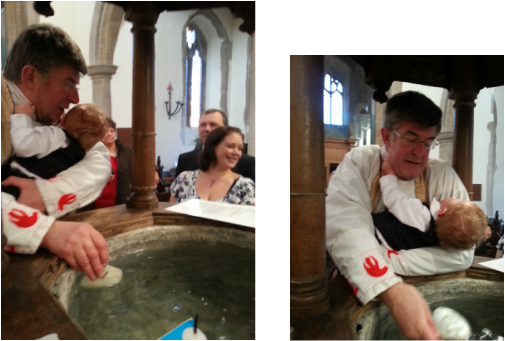 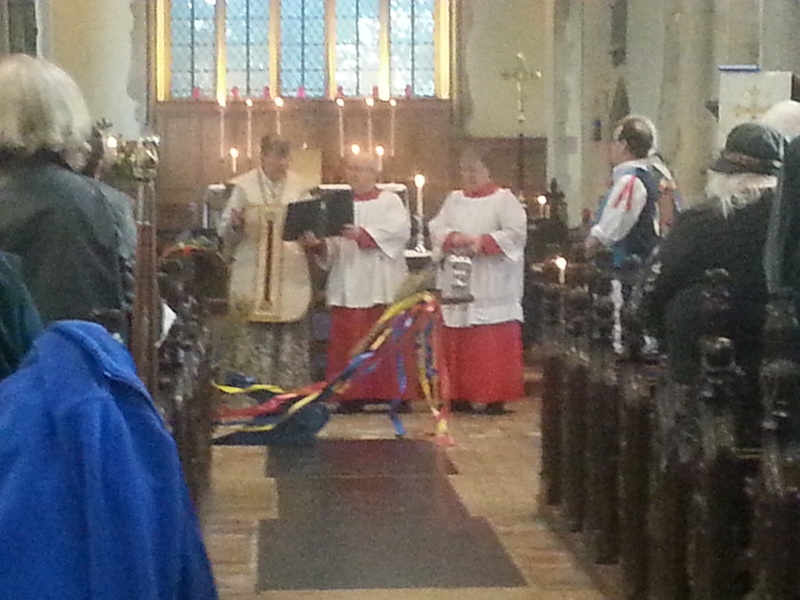 A Sanctus Bell was also consecrated - kindly donated and to be placed in the Sanctus Bell cote. 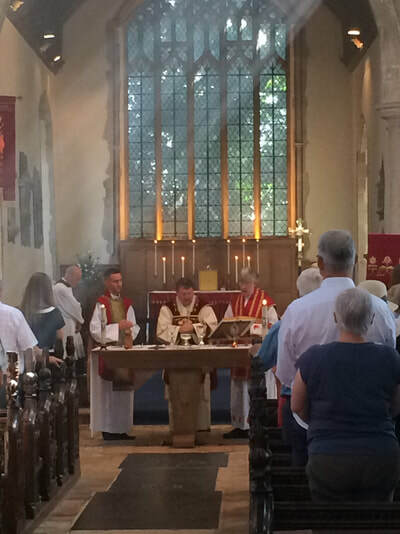 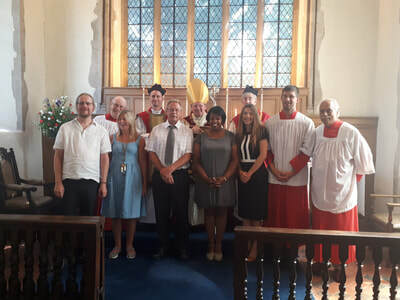 On 9th September The Bishop of Richborough confirmed Chris Elstone at St Mary's, together with four candidates from the Upper Alde Benefice. 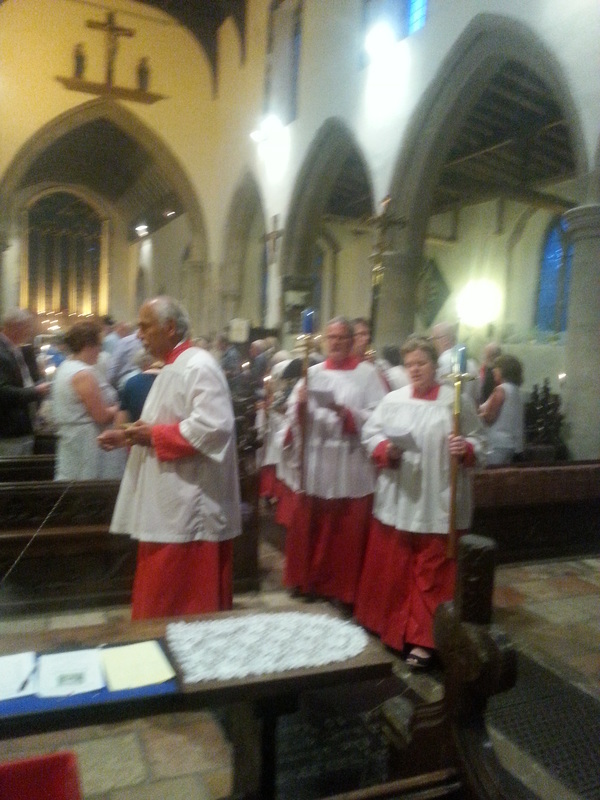 We celebrated a wonderful Patronal Festival weekend from 15th - 17th August with festival worship, procession & Benediction, blessing of our own locally-brewed Real Ale, a spectacular firework display to music, a Saturday evening concert with the Kingfisher String Quartet and a Sunday afternoon concert in the churchyard: 'Sounds of the Sixties' by local group The Buzz, with homemade teas, beer, wine and soft drinks. 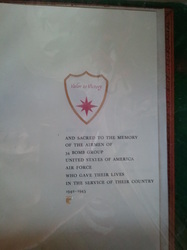 (see photos below). 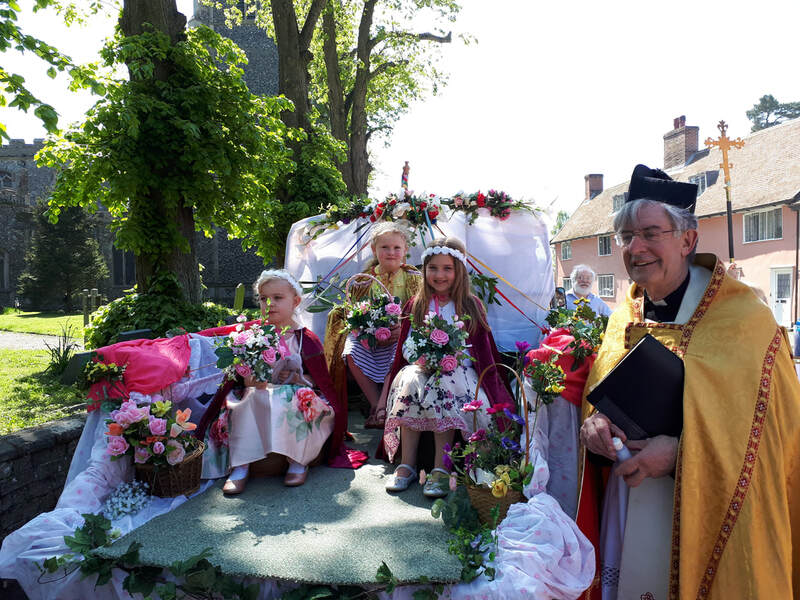 On Sunday 4th May during the Parish Mass, Fr Philip crowned the statue of Our Lady and then crowned Jess as May Queen and Katelynn and Elena as her attendants. 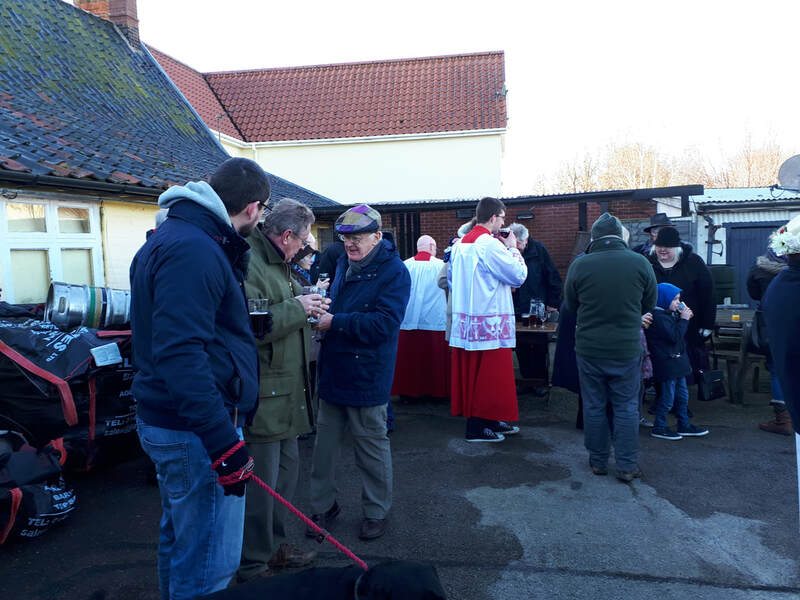 After Mass we processed around the village, where Fr Philip said a prayer at the village sign, then to the King's Head, where Paul kindly provided welcome refreshments. 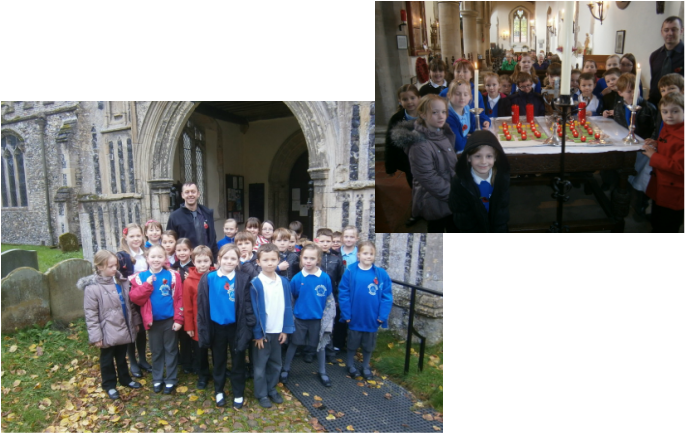 After that we went to St Joseph's Centre for a shared lunch. 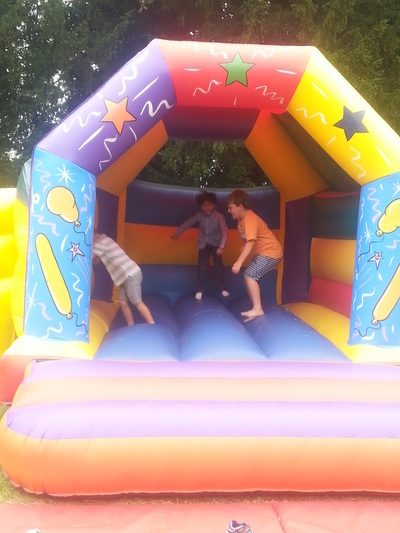 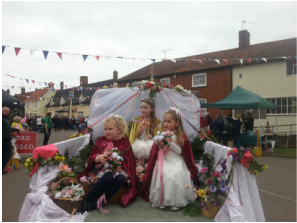 The following day, Jess, Katelynn and Elena took part in the village Street Fayre. 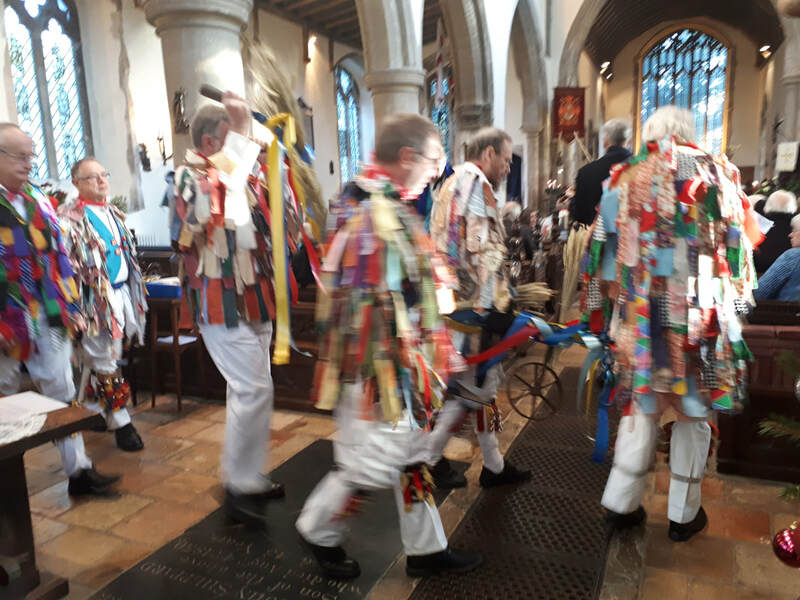 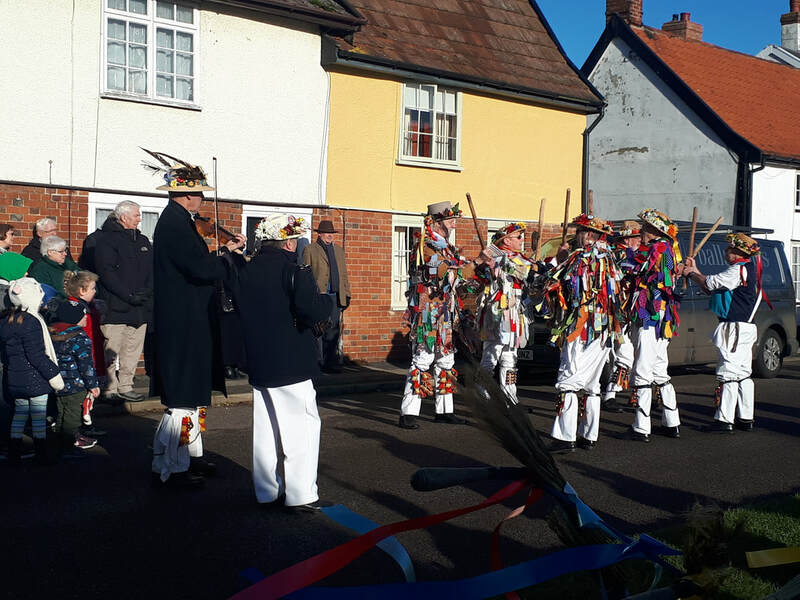 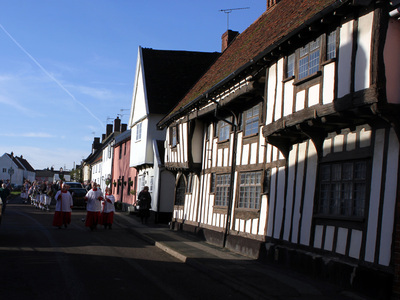 The plough was brought into church by East Suffolk Morris Men, who danced during the Parish Mass after the blessing of the plough, which symbolises all work on the land. 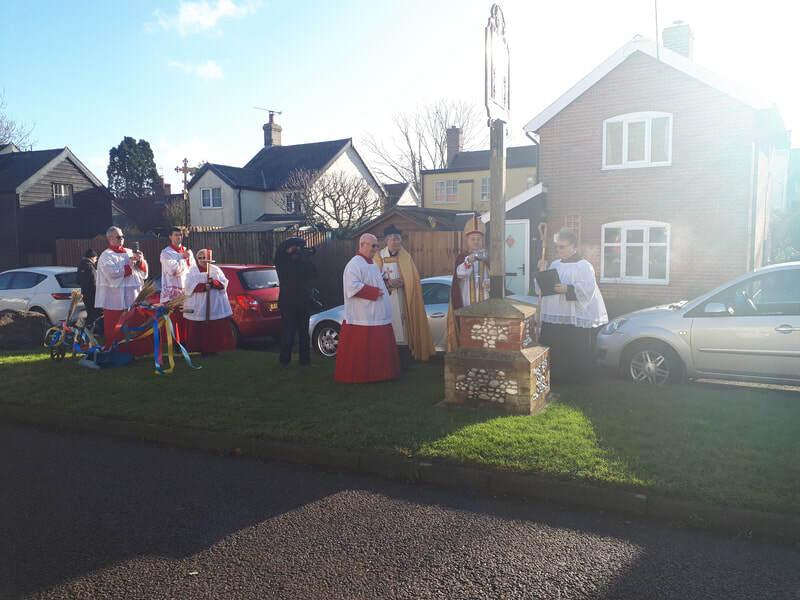 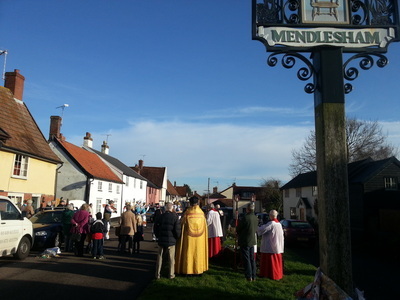 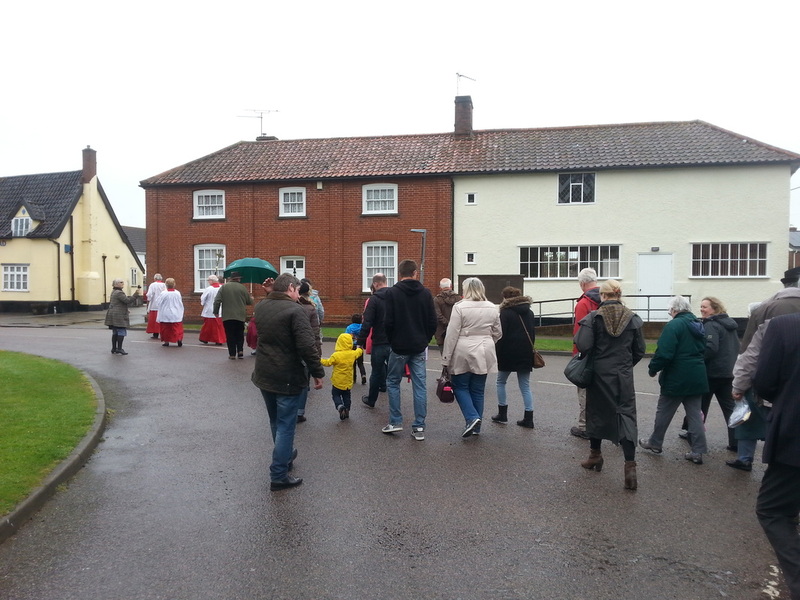 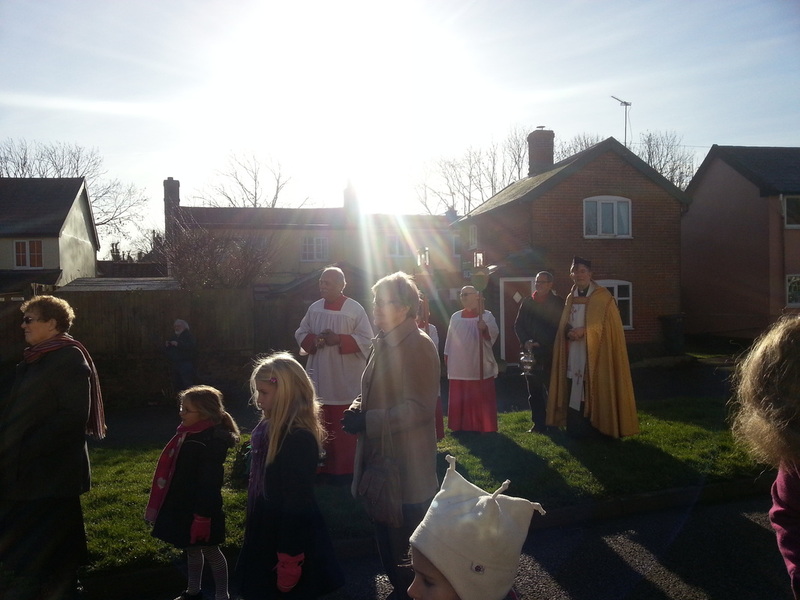 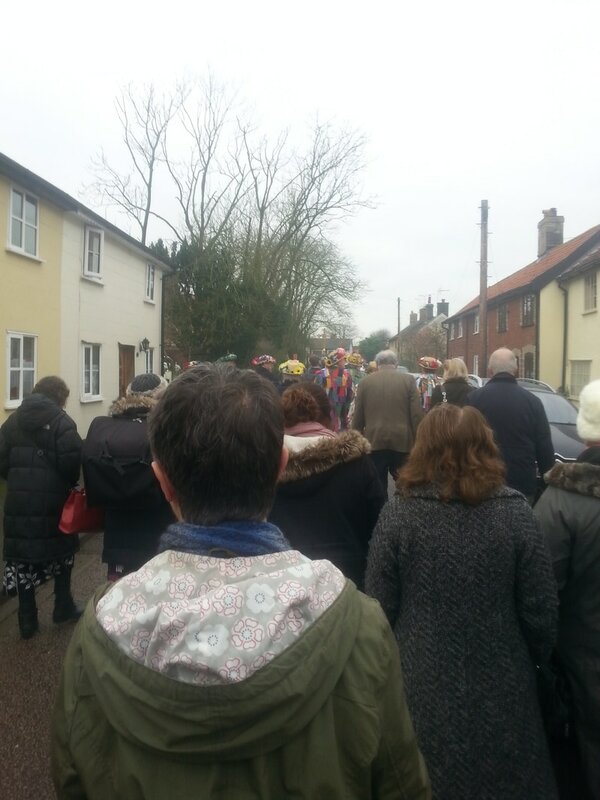 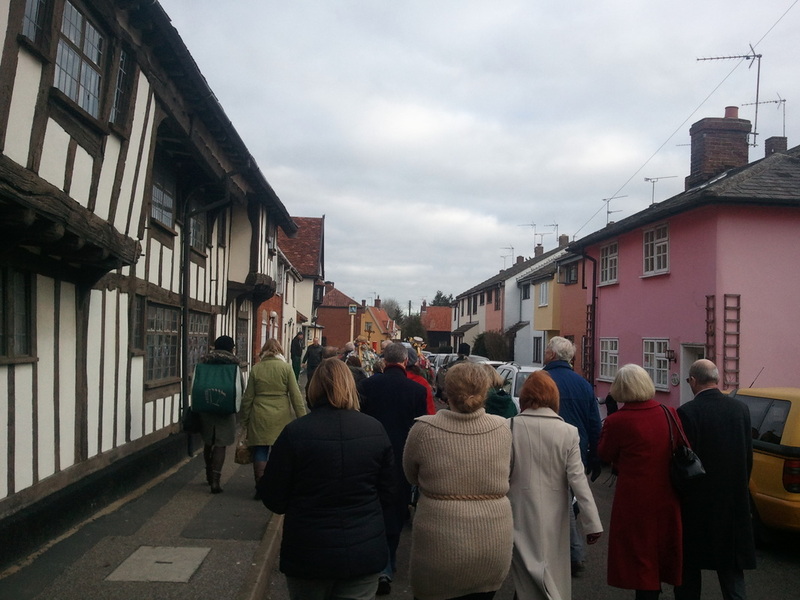 Mass was followed by a procession around the village, when a prayer was said at the village sign for God's blessing on the parish during the year. We finished at the yard of the King's Head, where Paul, the landlord, kindly provided a welcome drink, then went to St Joseph's Centre for a shared buffet lunch. 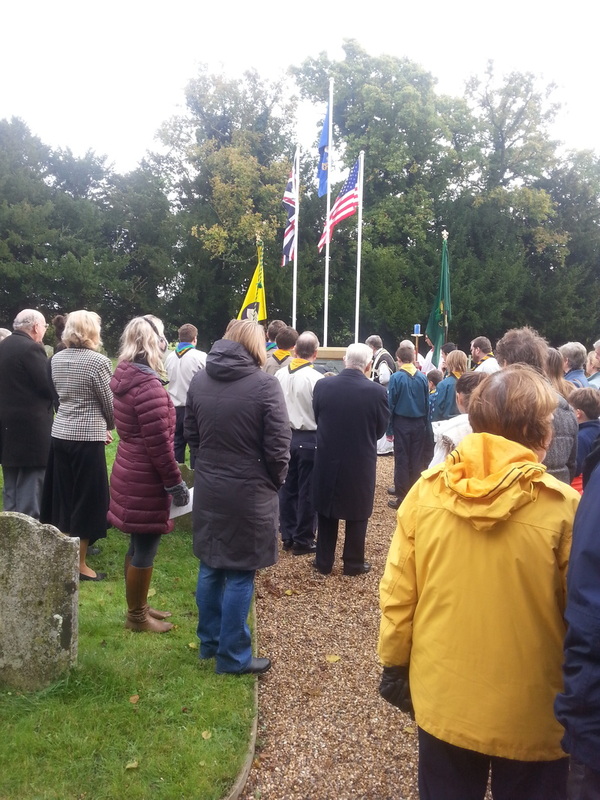 Remembrance Sunday -10th November 2013. 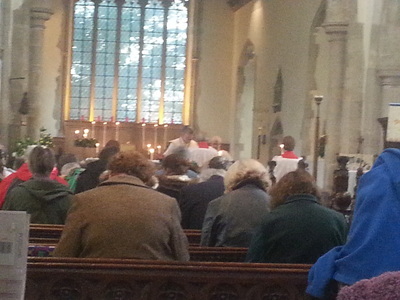 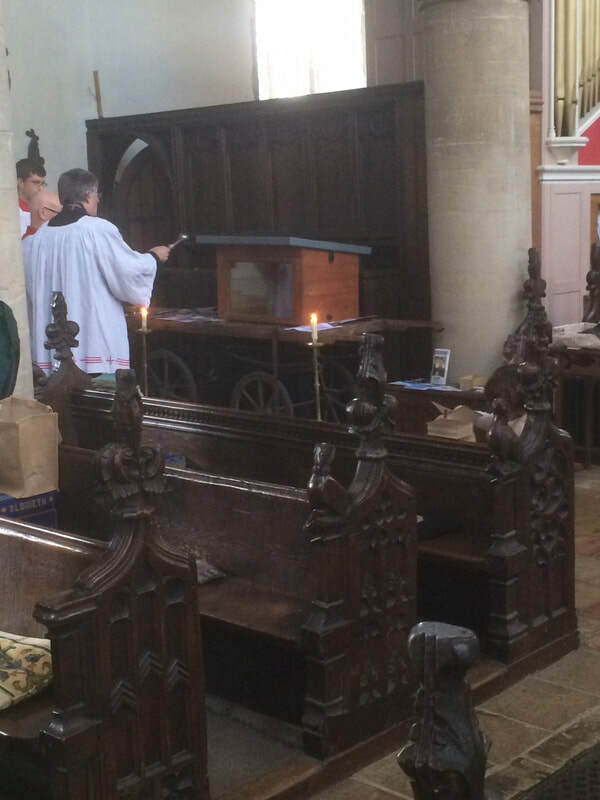 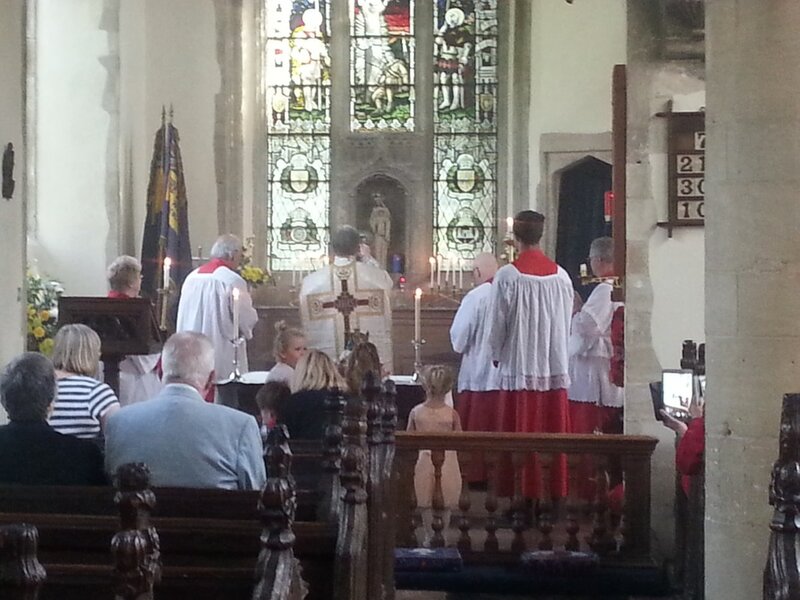 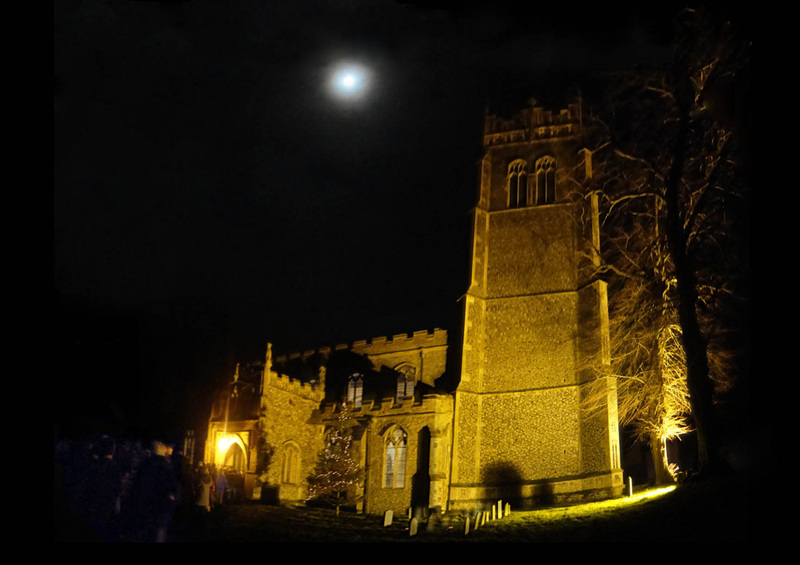 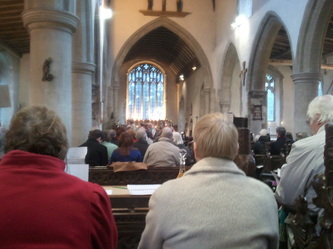 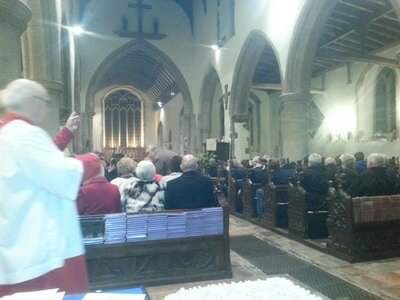 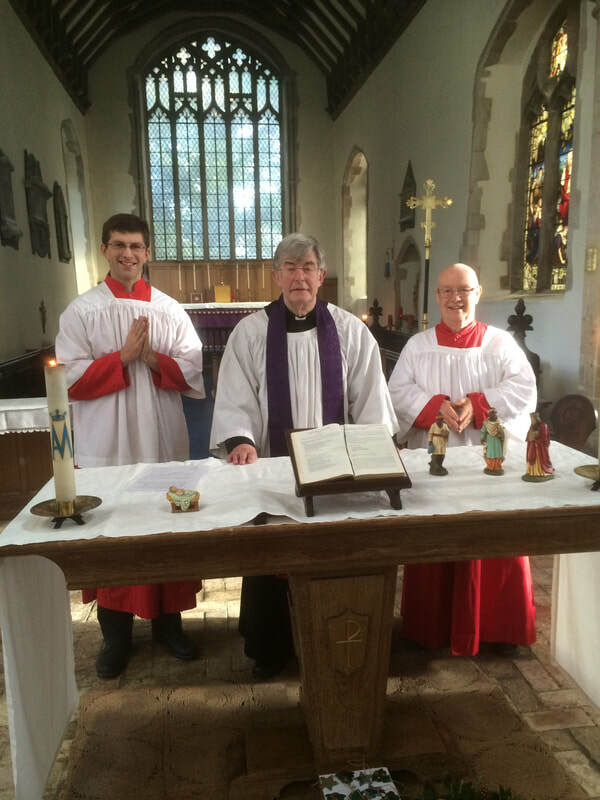 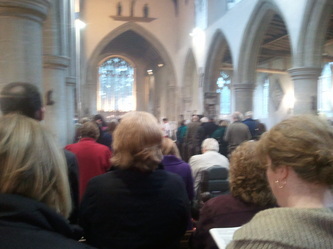 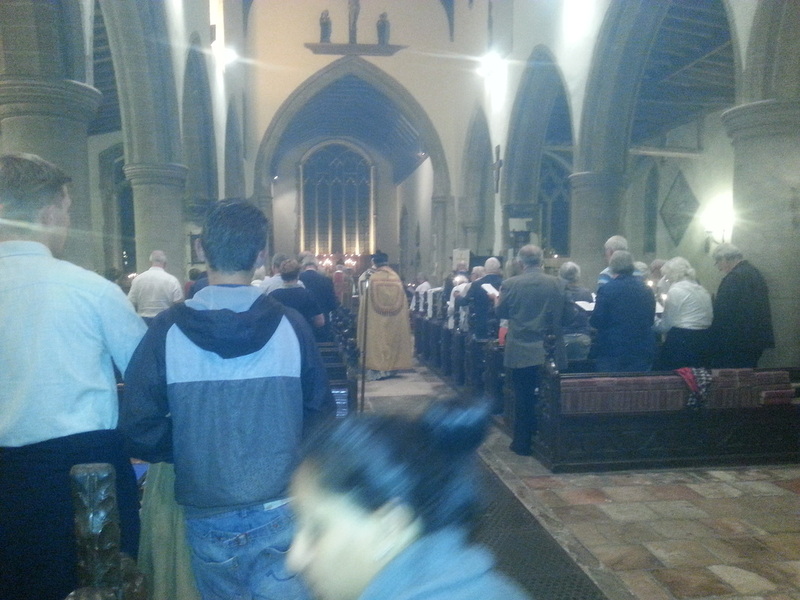 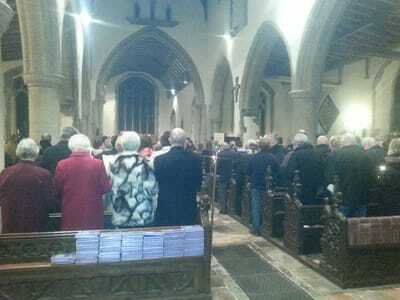 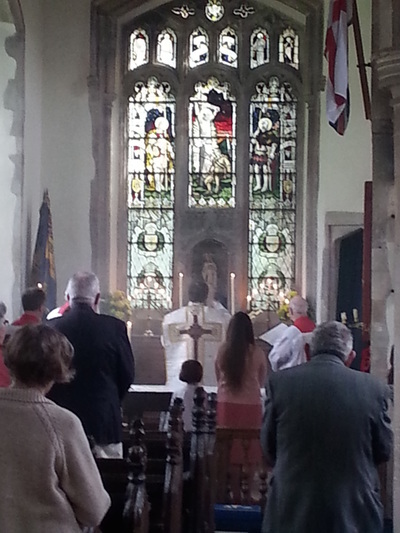 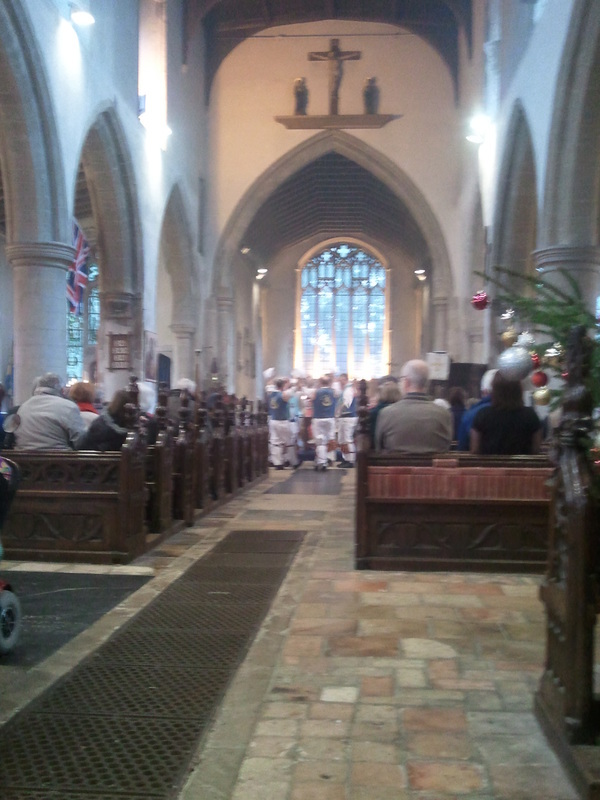 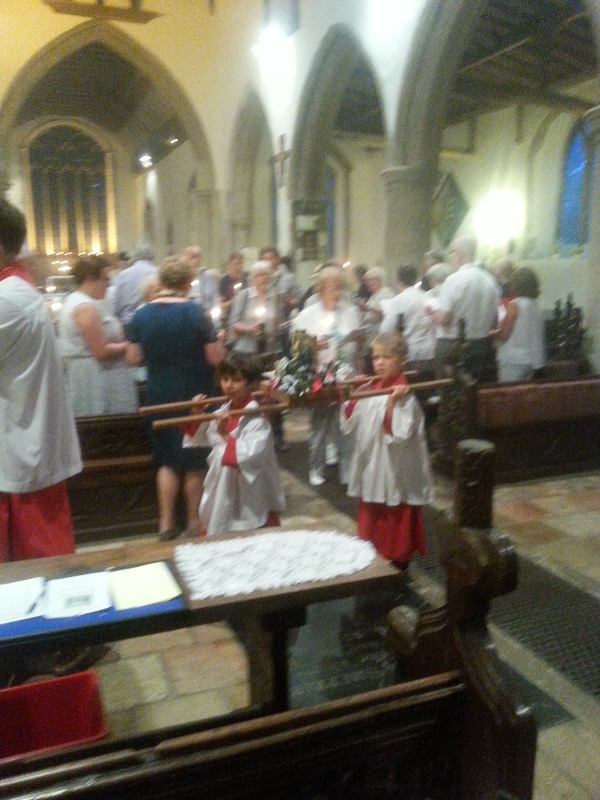 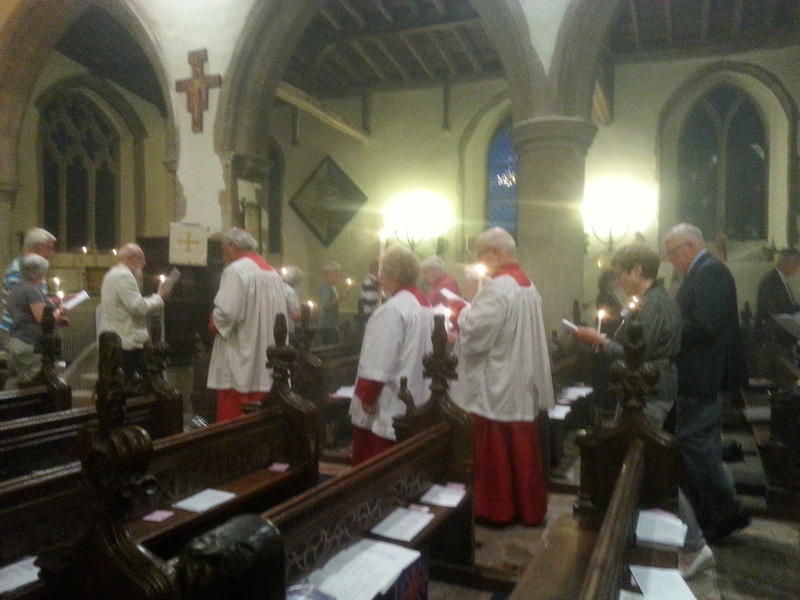 The Parish Mass was a Requiem, attended also by Mendlesham Scouts. 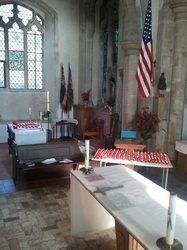 A wreath was laid at the parish war memorial and a candle lit for each of those from Mendlesham who died in the two Great Wars and the Korean War, for the 190 US Airmen based at the Mendlesham Airfield who lost their lives in WW2 as well as a large candle for all who died in the conflicts in The Falklands, Iraq and Afghanistan. 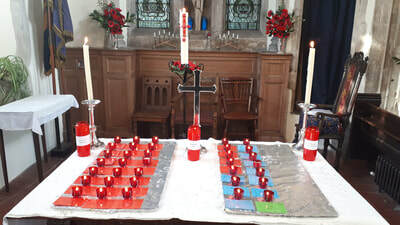 Mendlesham Community School took part in a Remembrance Service on 11th November when another set of similar candles was lit. May Fiesta 2013 - in honour of Mary, Mother of God, and celebrated in Mendlesham's unique way - a wonderful celebration which was both prayerful and fun. As we have done for many years, the statue of Our Lady was crowned, then Fr Philip crowned the May Queen, representing Our Lady, along with her attendants. 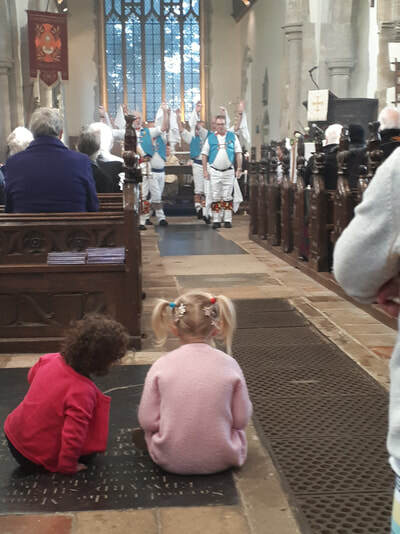 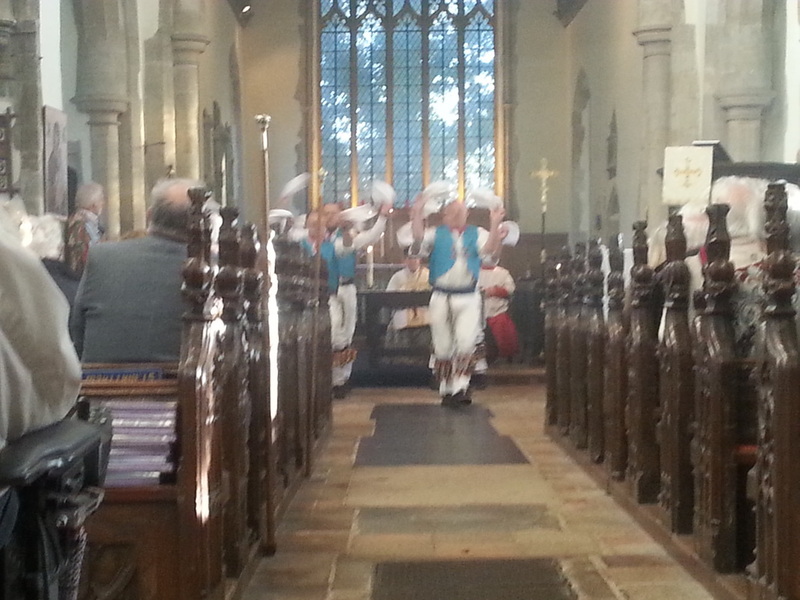 There was then Morris dancing in church by the Danegeld dancers. 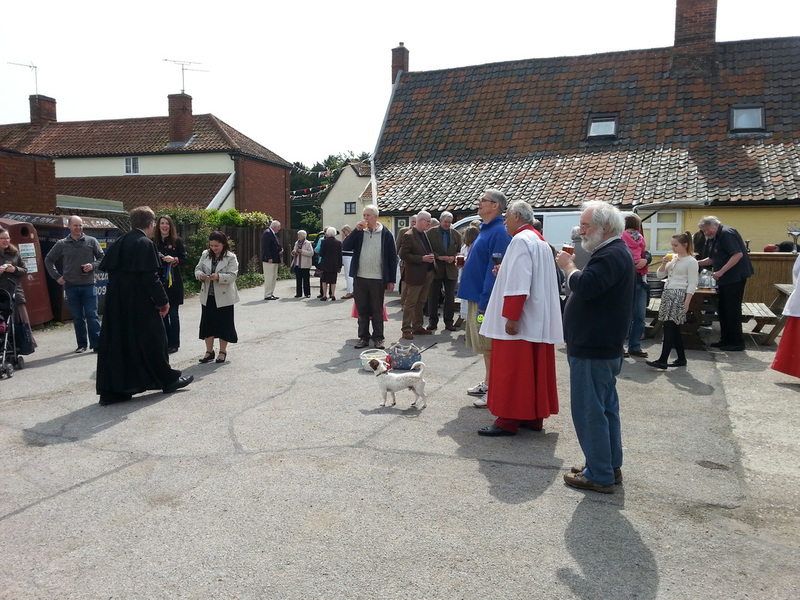 After Mass a procession took place around the village, with more dancing and a prayer asking God's blessing on the life of the village. 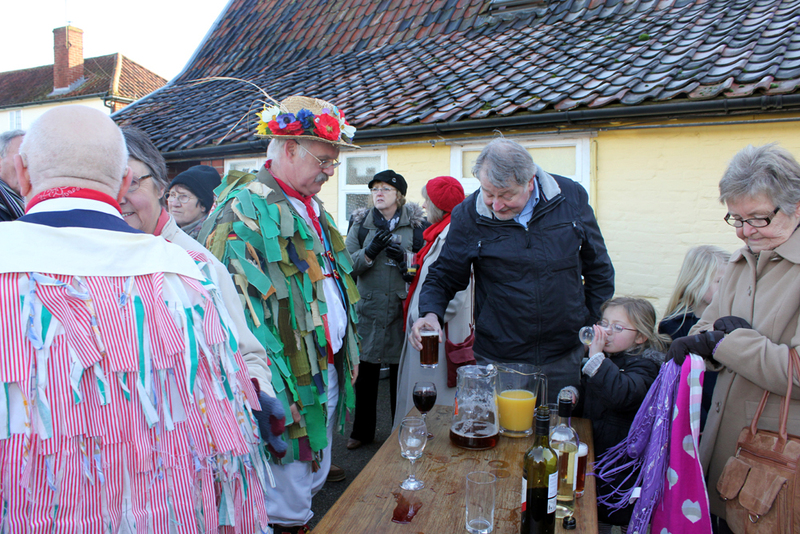 Paul, landlord of the King's Head, welcomed us at the end and generously provided drinks. 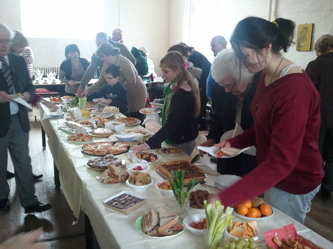 Afterwards we shared a buffet lunch in St Joseph's centre. 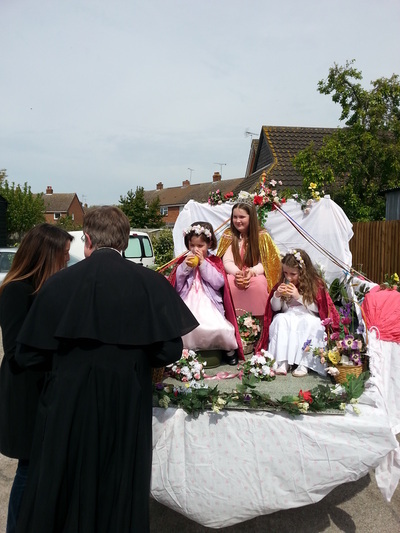 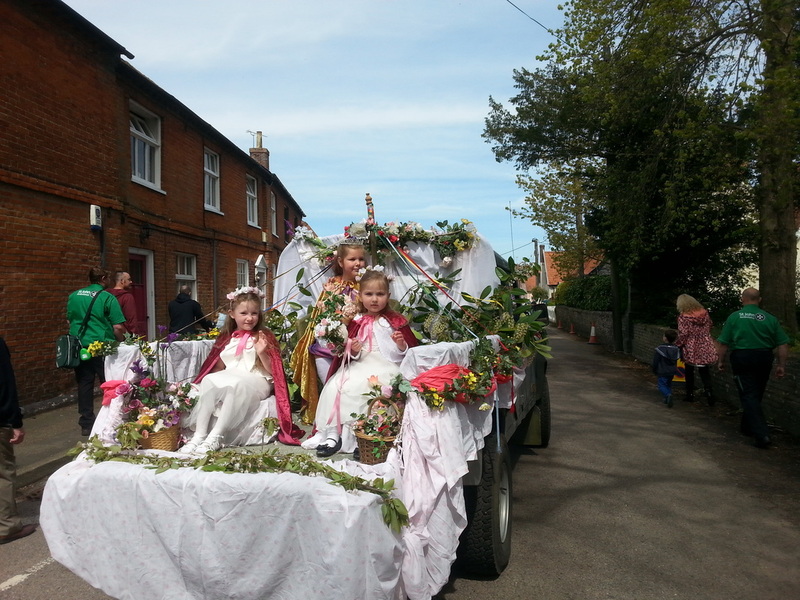 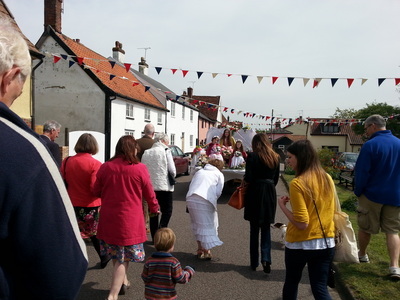 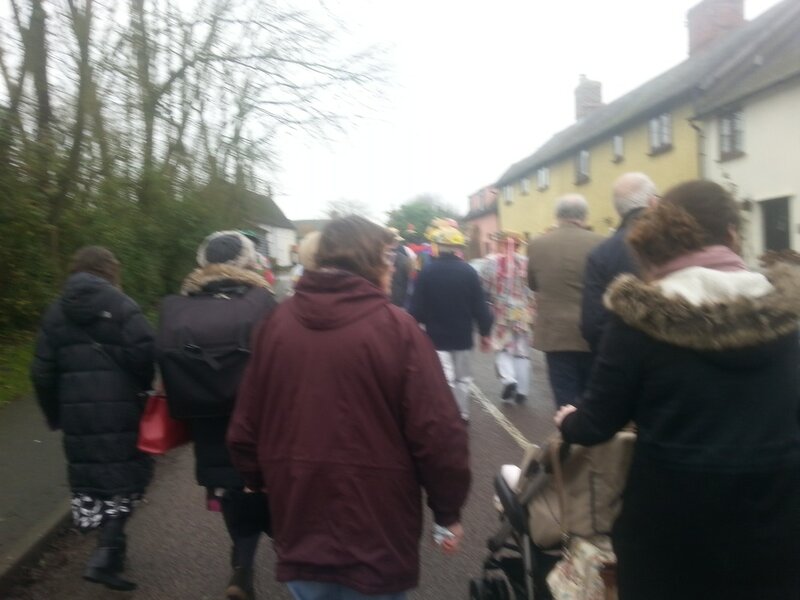 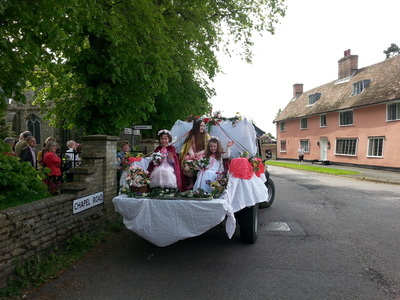 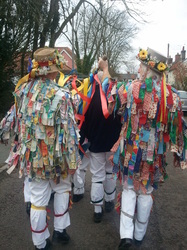 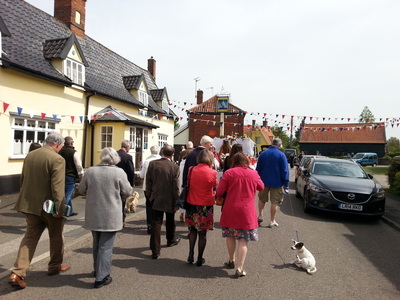 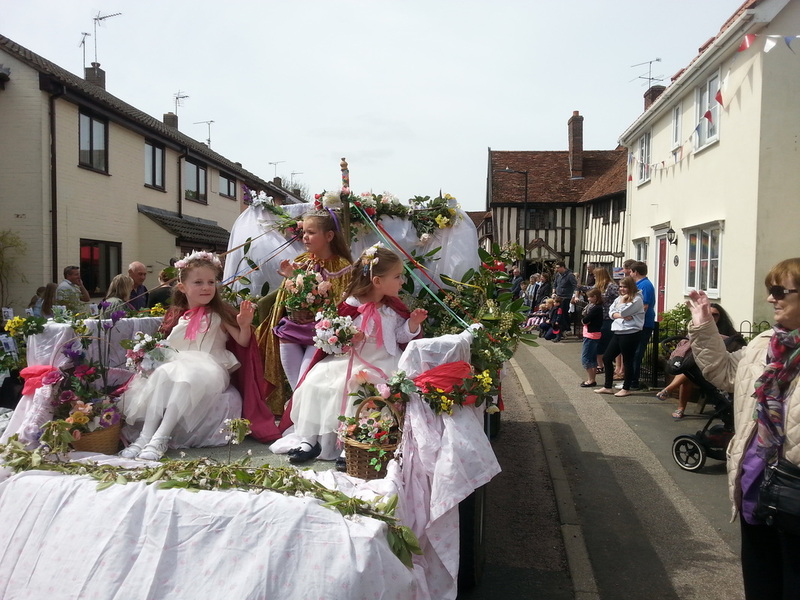 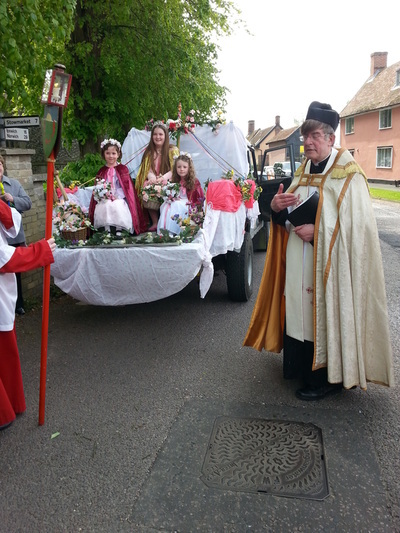 The next day the May Queen and her attendants took part in the village Street Fayre procession. 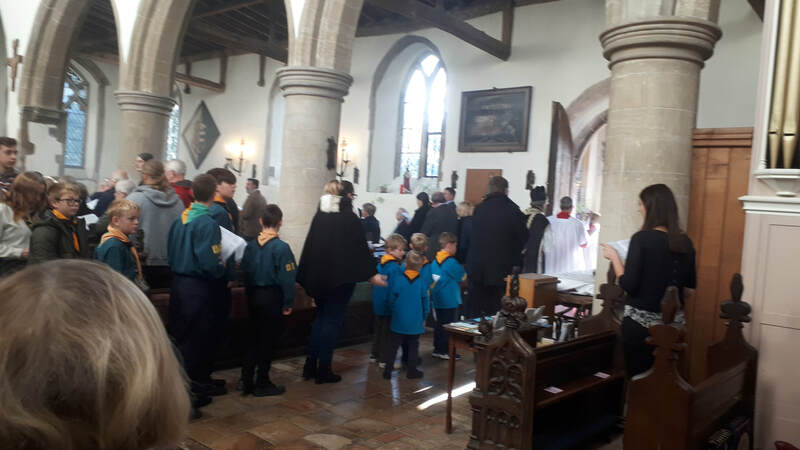 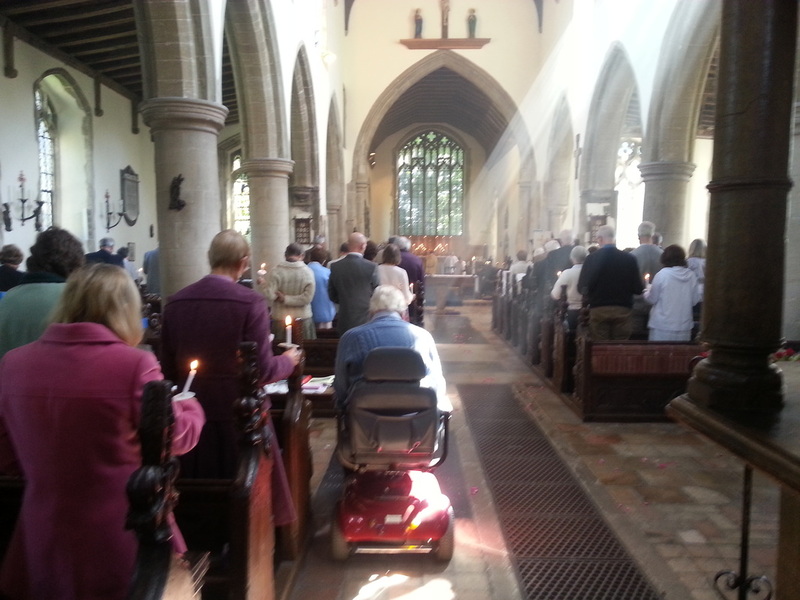 At the 9.30 am Sung Mass of Requiem, attended by Mendlesham Scouts and Brownies, candles were lit for all those from Mendlesham who gave their lives in WW1, WW2 and the Korean War and those 190 of the USAF and 7 from the Royal Canadian Air Force who flew from Mendlesham and did not return. 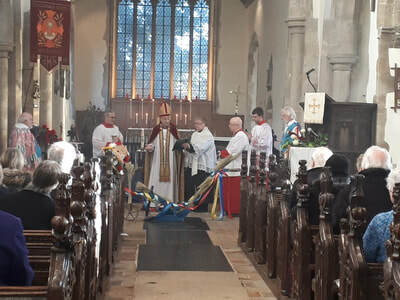 Large candles were lit for all who died in the Falklands, Iraq & Afghanistan A wreath was laid by the parish war memorial & 2 minutes silence observed. On Friday 9th November there was a Remembrance service attended by Mendlesham school, in which pupils led the prayers and memorial candles were also lit. 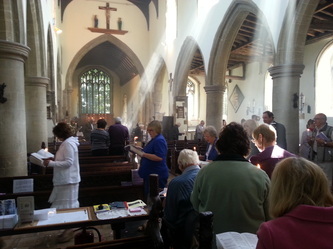 From February to the end of May 2012 the church has undergone an extensive renovation. 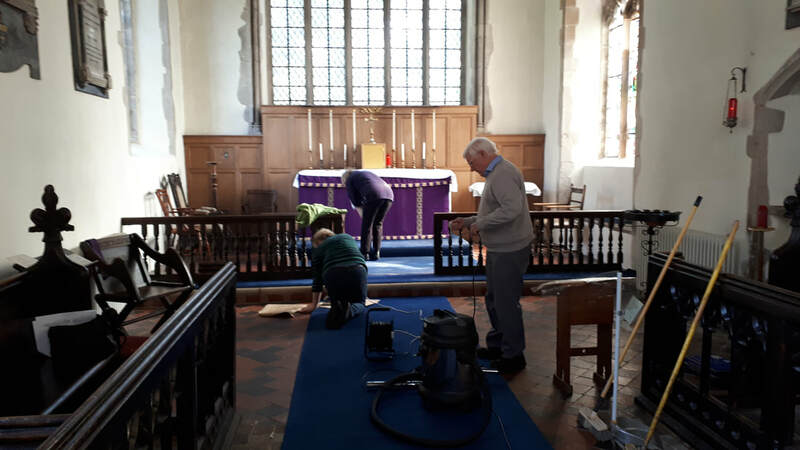 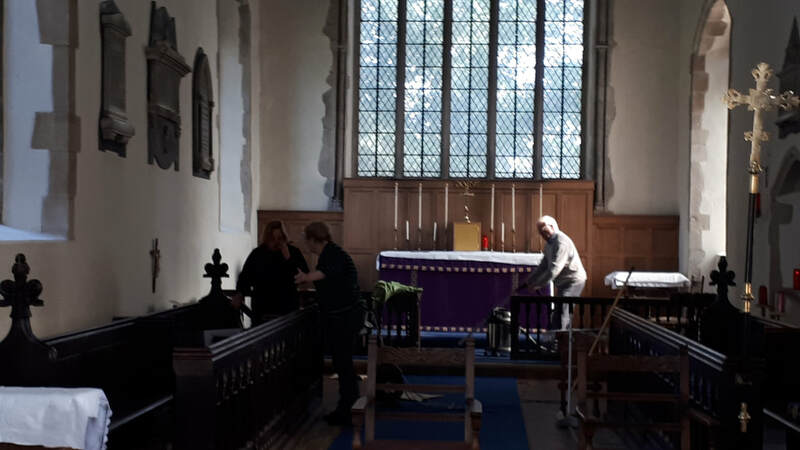 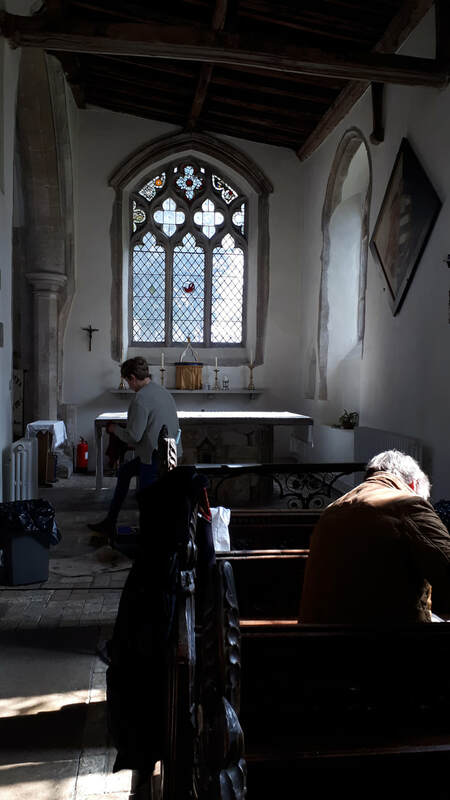 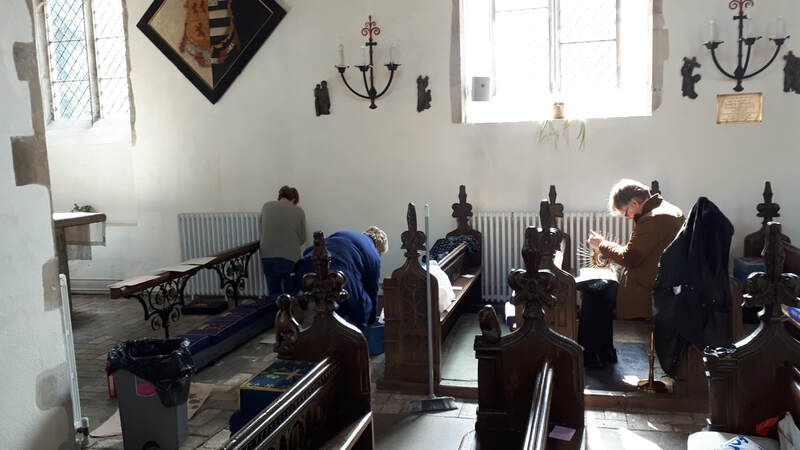 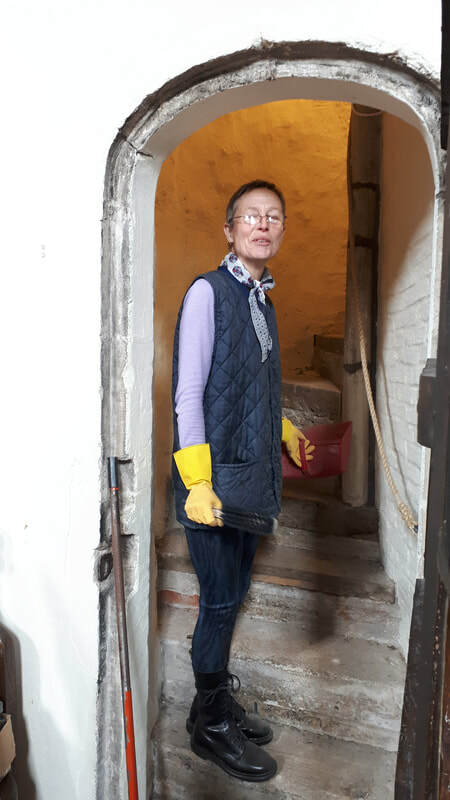 The work still has to be completed, particularly in the chancel, where there is damp in the roof, but some areas of plaster have to dry and we also have to wait until the end of the breeding season for the resident bat population. Bishop Norman was licensed as an assistant Bishop of the diocese of St Edmundsbury and Ipswich by + Nigel, the diocesan Bishop, in Bury St Edmunds Cathedral at Choral Evensong on Friday 27th January 2012 at 5.30 pm. 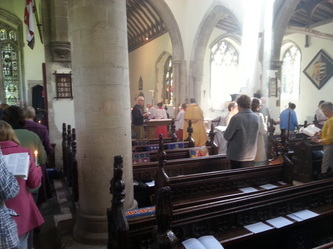 About 20 of our congregation were able to attend. 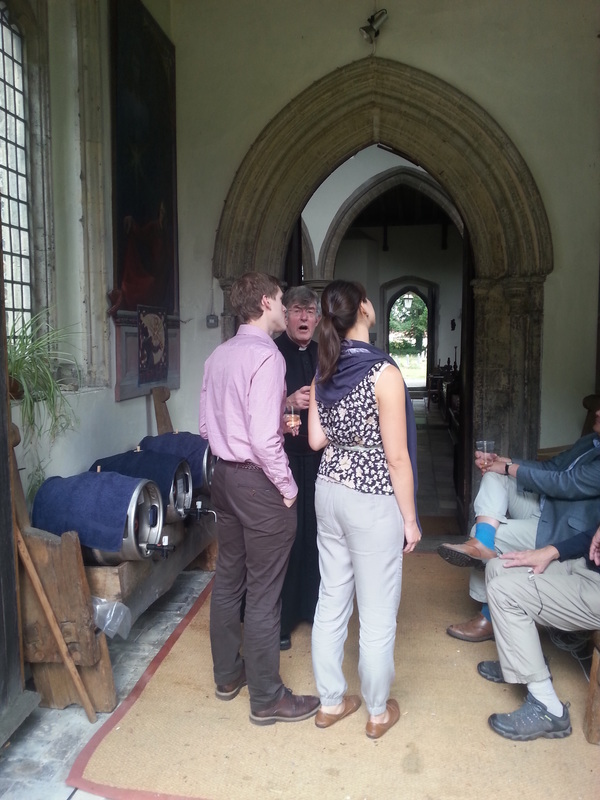 After Evensong, we enjoyed the hospitality offered by the cathedral. This year Plough Sunday fell on the Feast of the Epiphany. Plough Sunday is an ancient English custom when we ask God's blessing on the land. 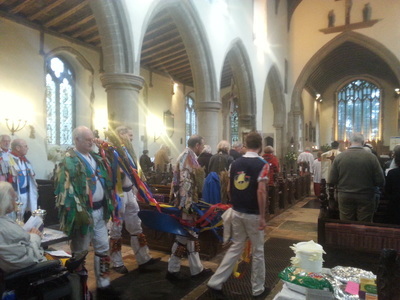 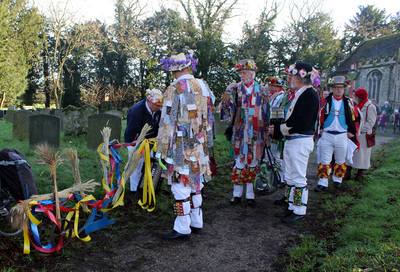 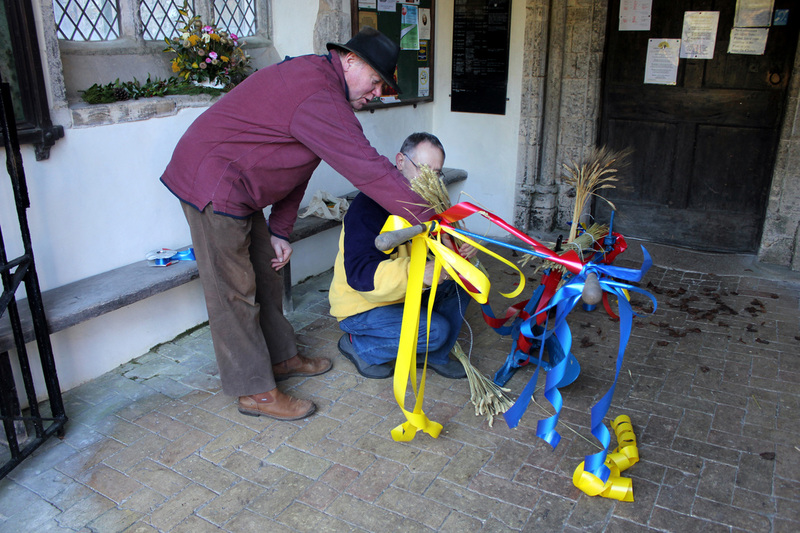 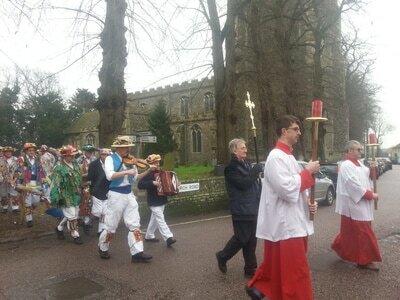 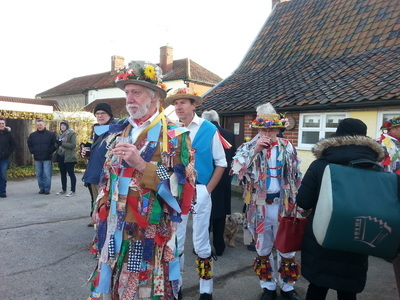 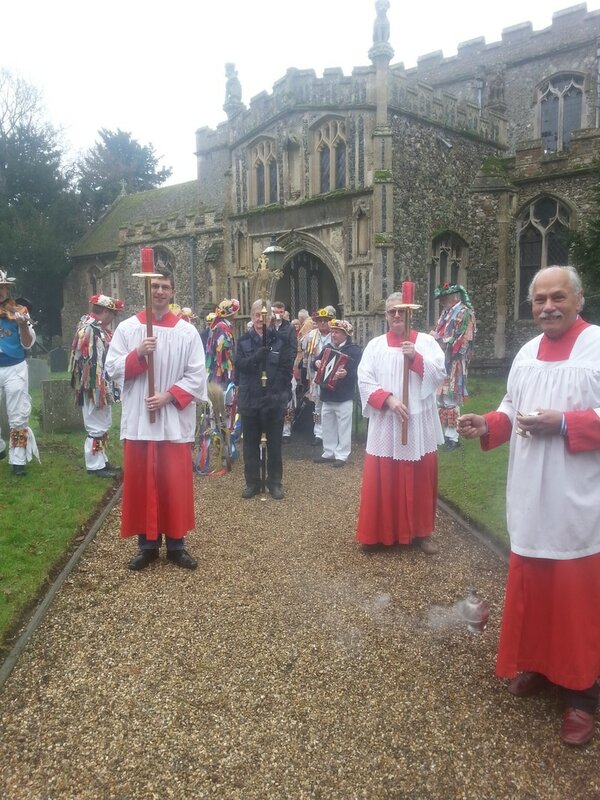 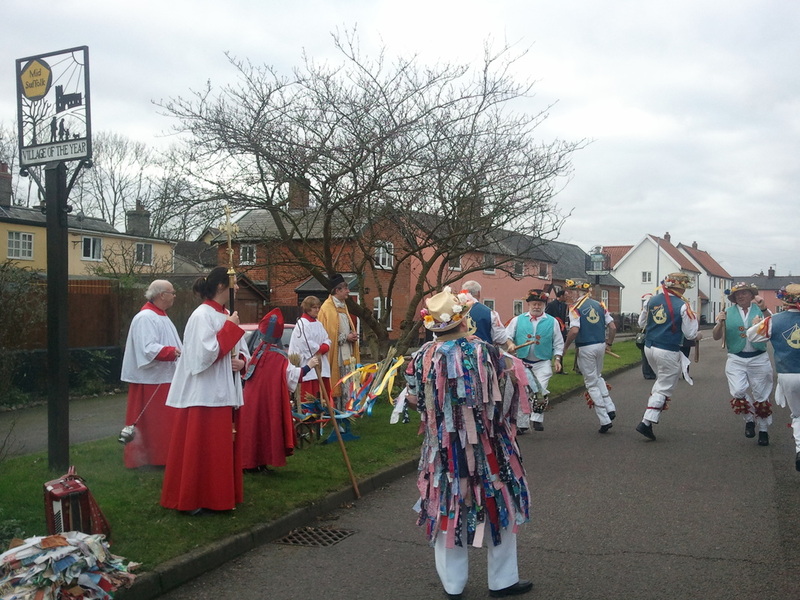 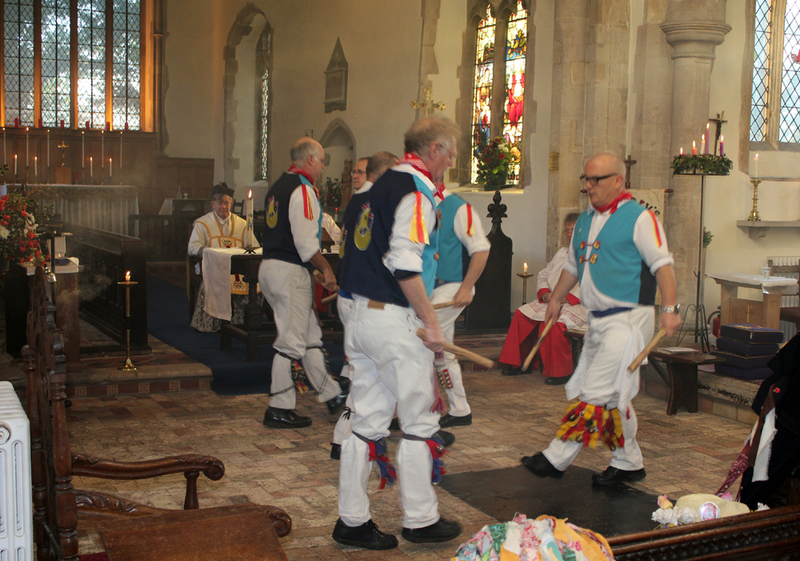 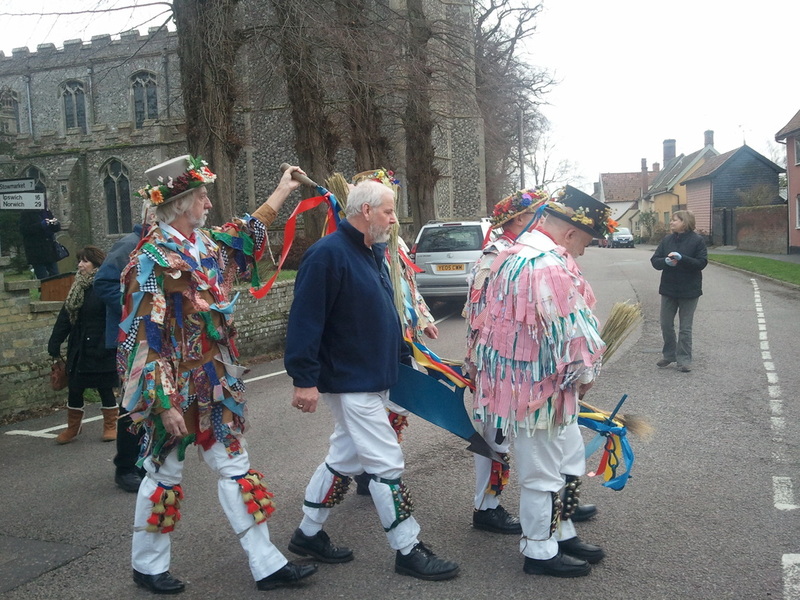 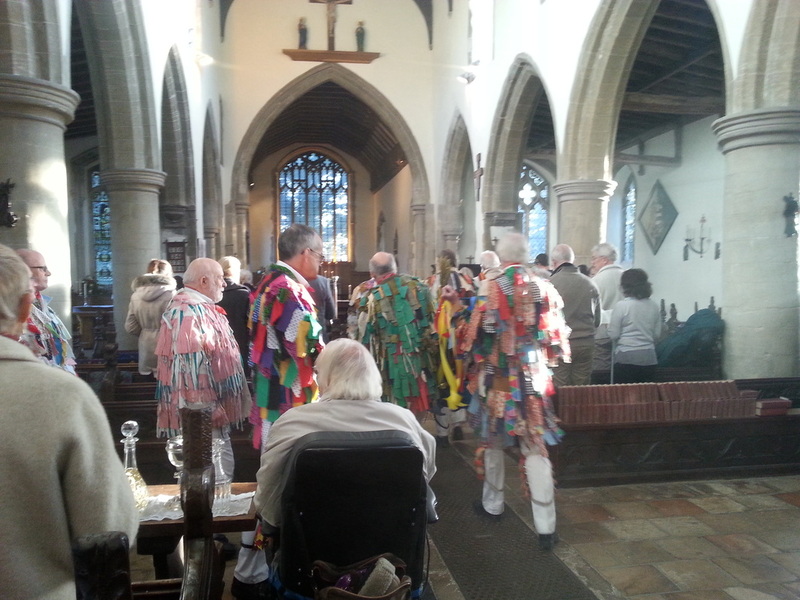 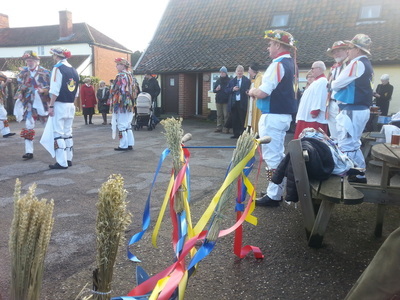 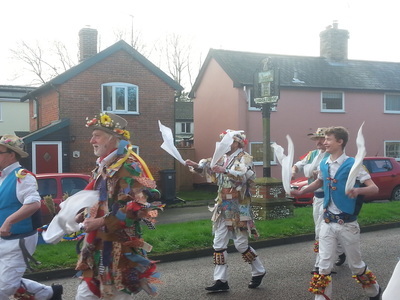 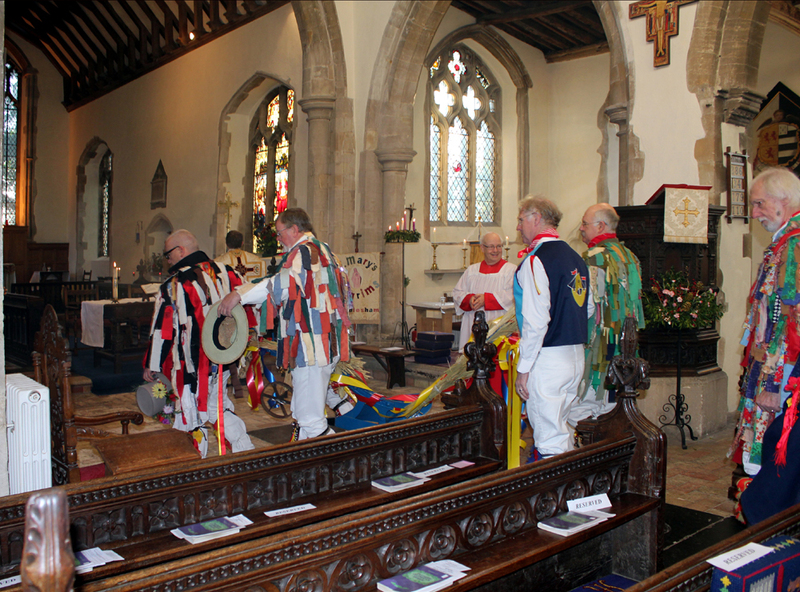 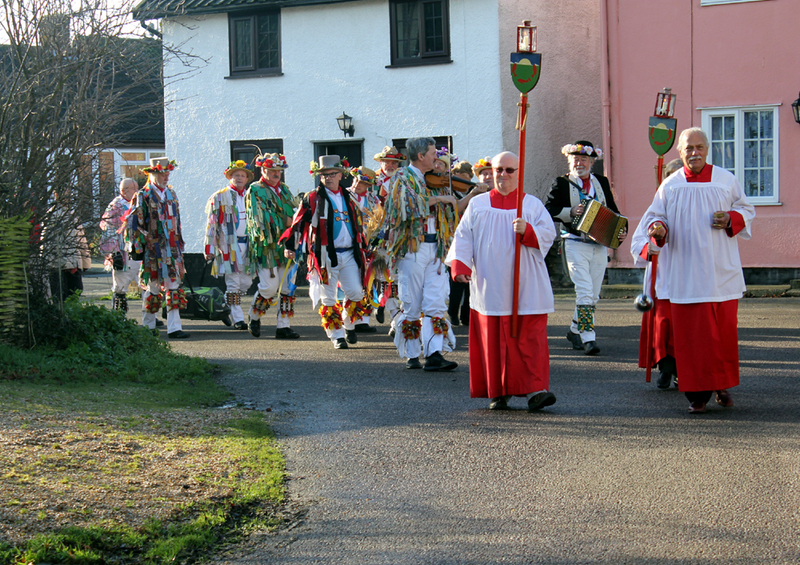 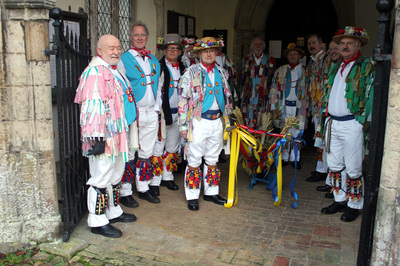 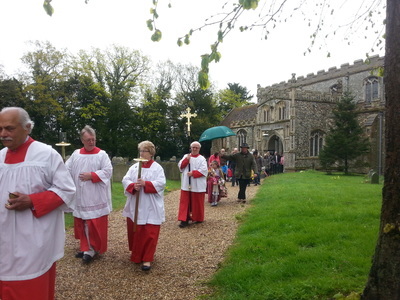 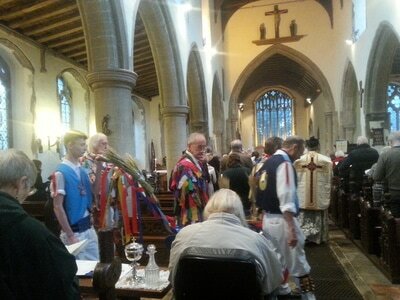 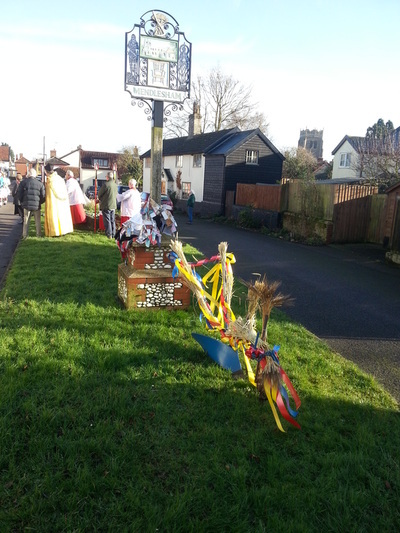 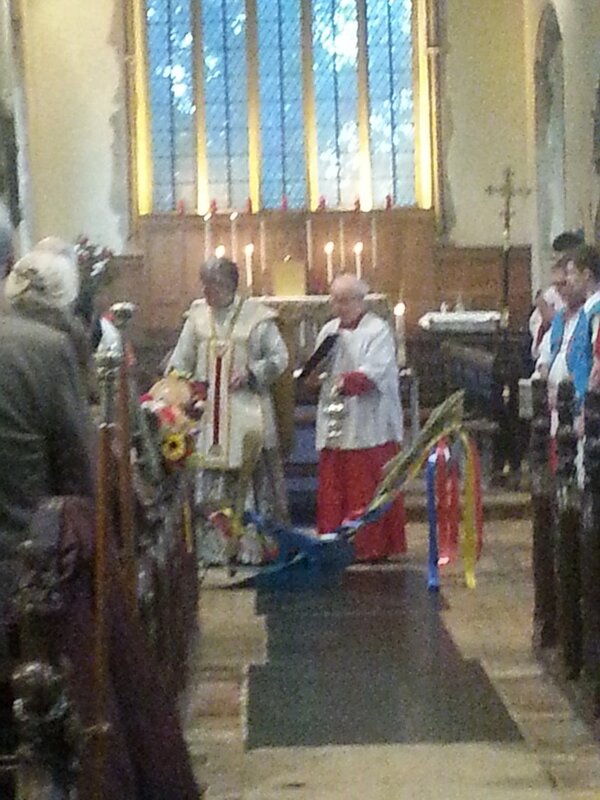 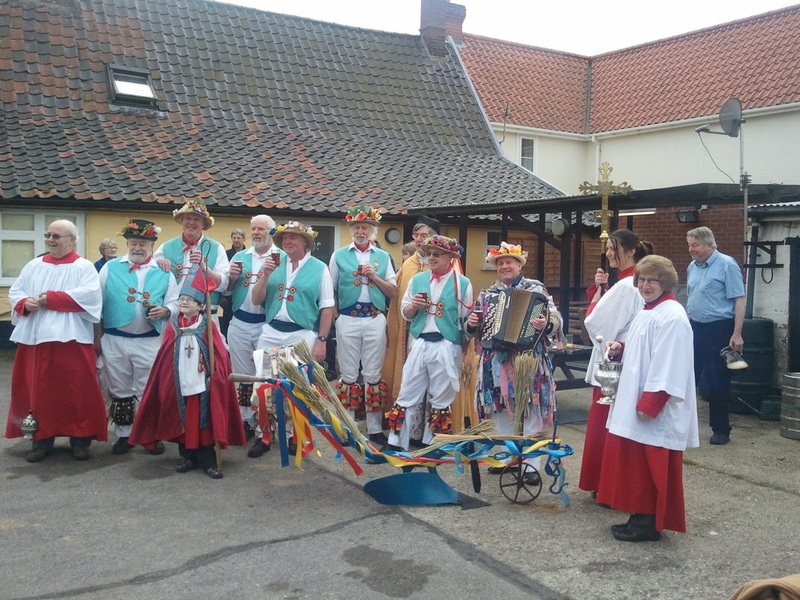 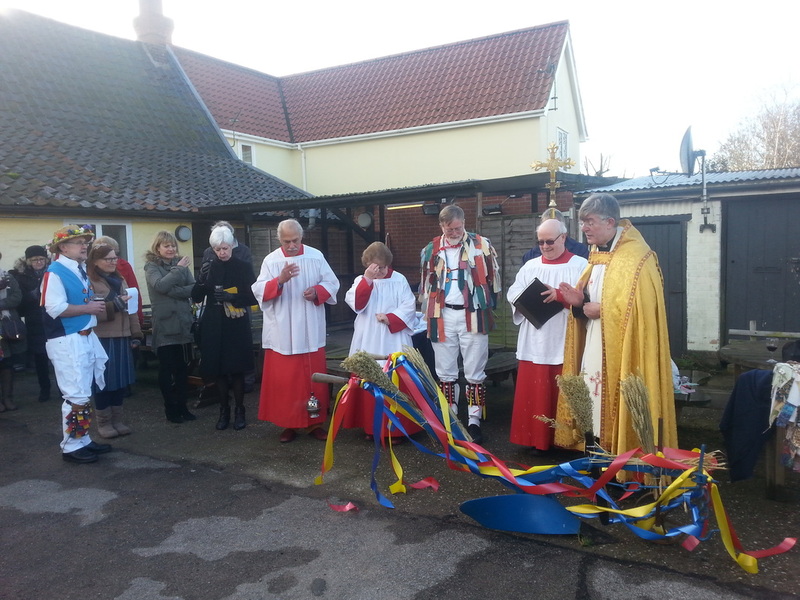 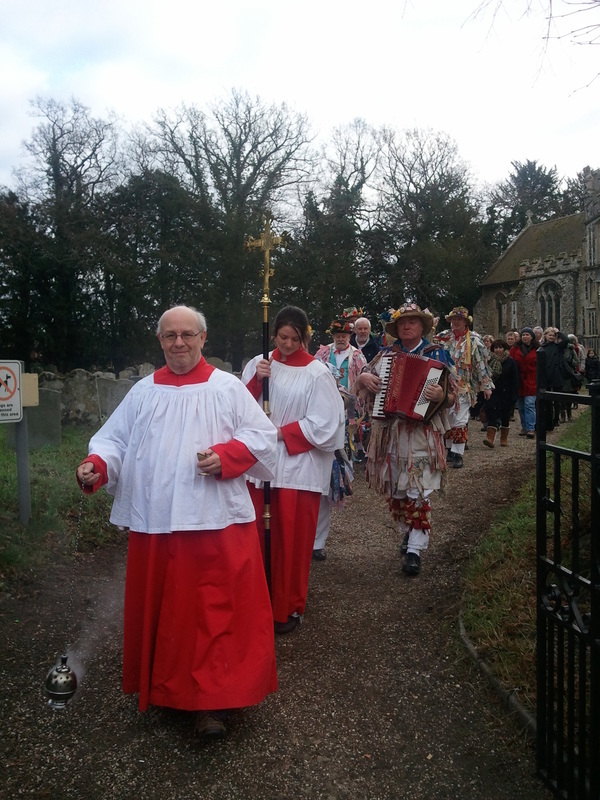 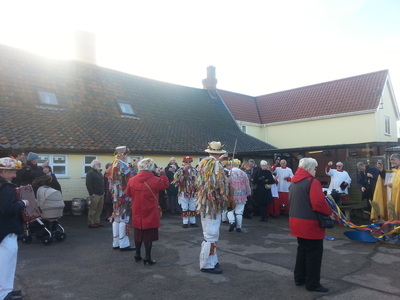 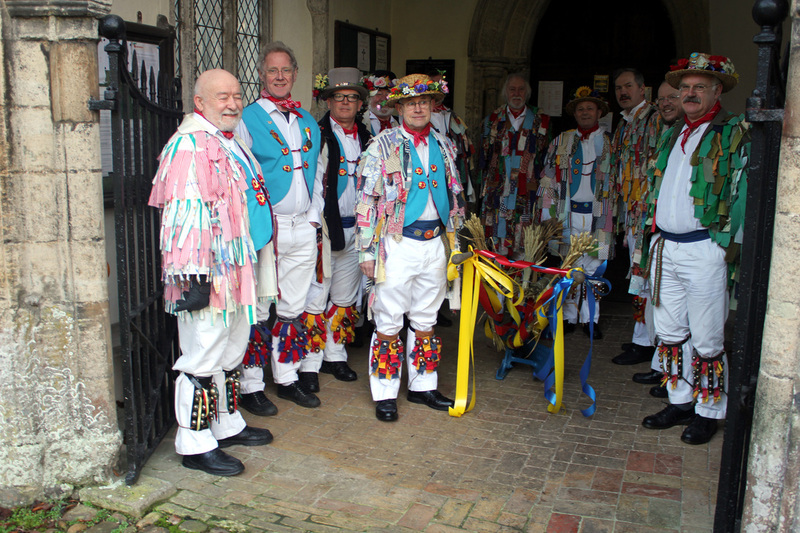 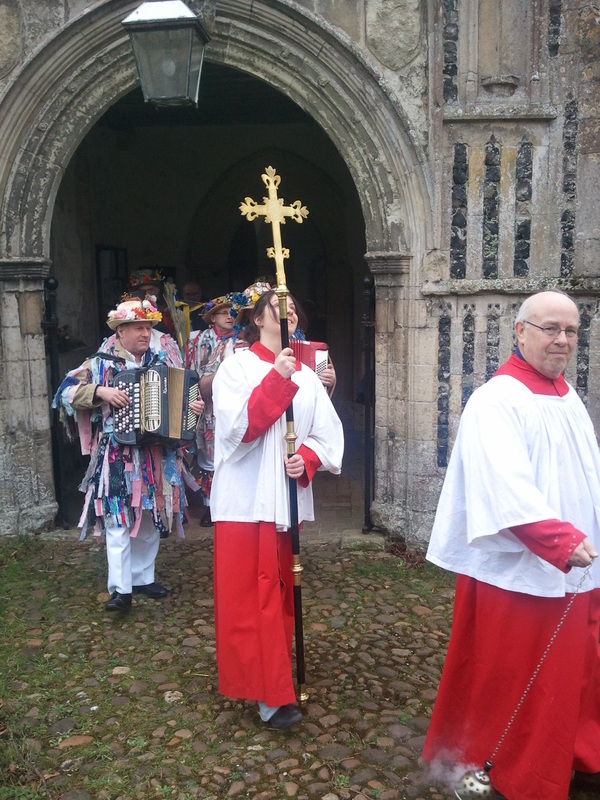 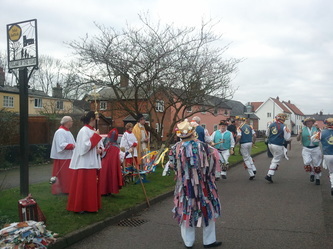 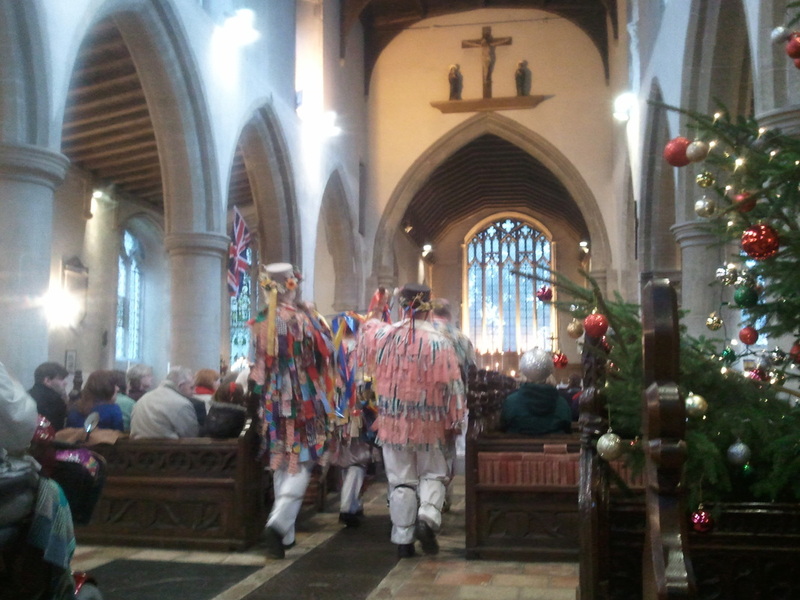 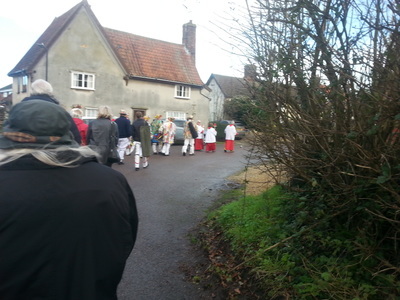 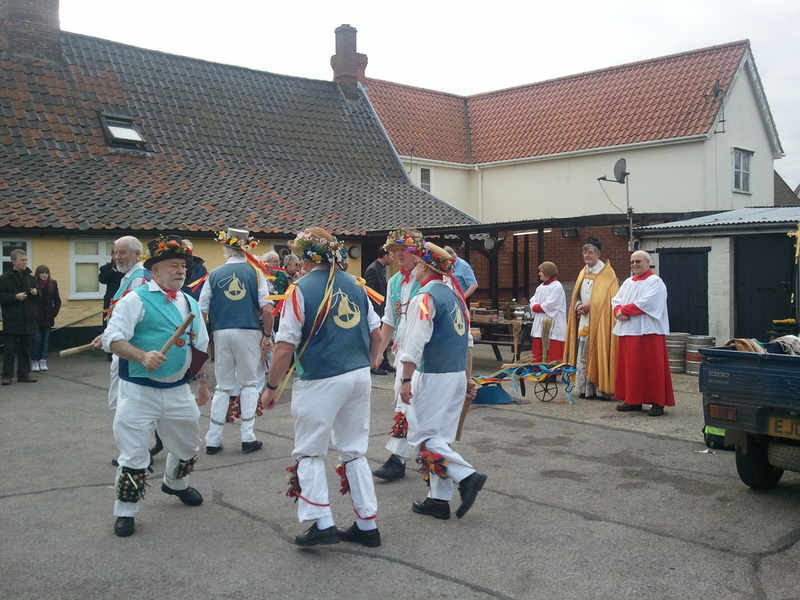 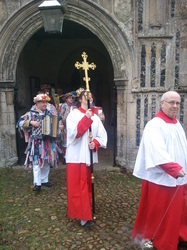 The decorated plough was blessed at Parish Mass, accompanied by Morris Dancing by the East Suffolk Morris Men. 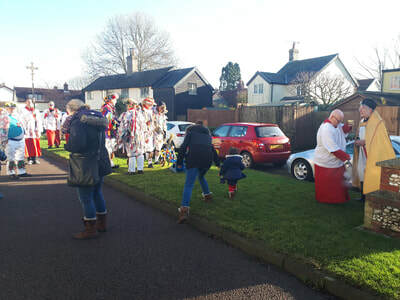 After Mass the Plough was taken in procession around the village, where Fr Philip prayed for God's blessing on the people of the village and there was more Morris dancing. 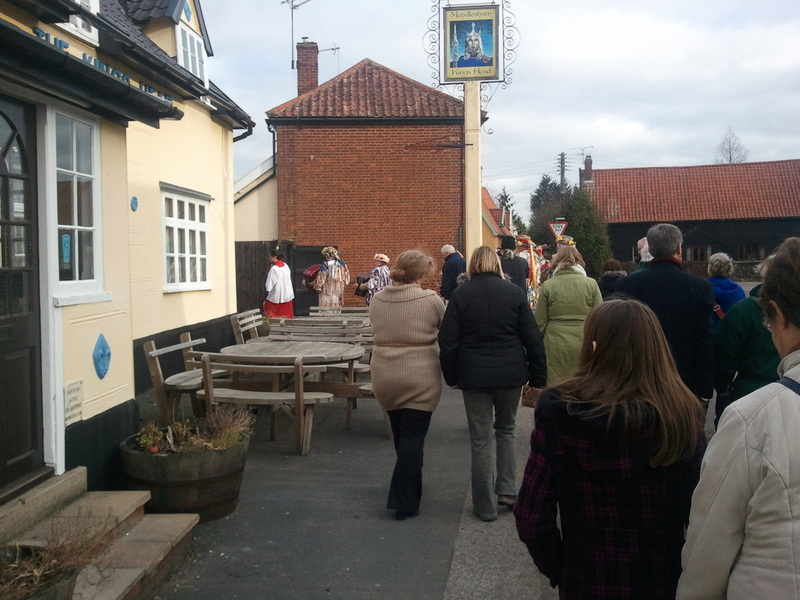 Paul, landlord of the King's Head, welcomed us and provided hospitality at the end of the procession. 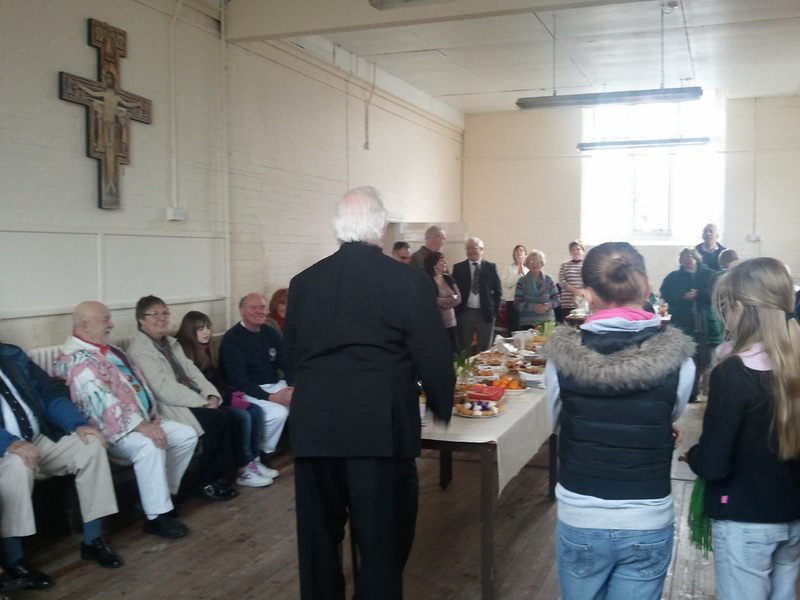 We returned to St Joseph's centre for a shared lunch. 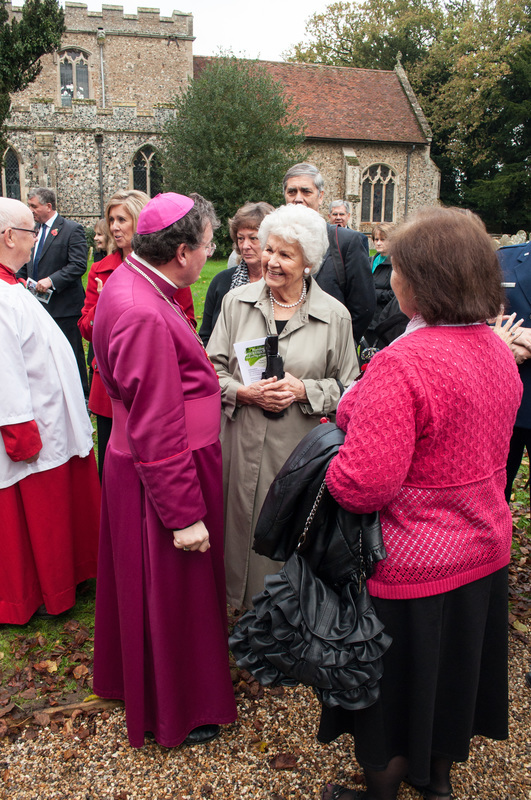 We welcomed Bishop Norman to preside and preach at our parish Mass on Advent IV (18th December). 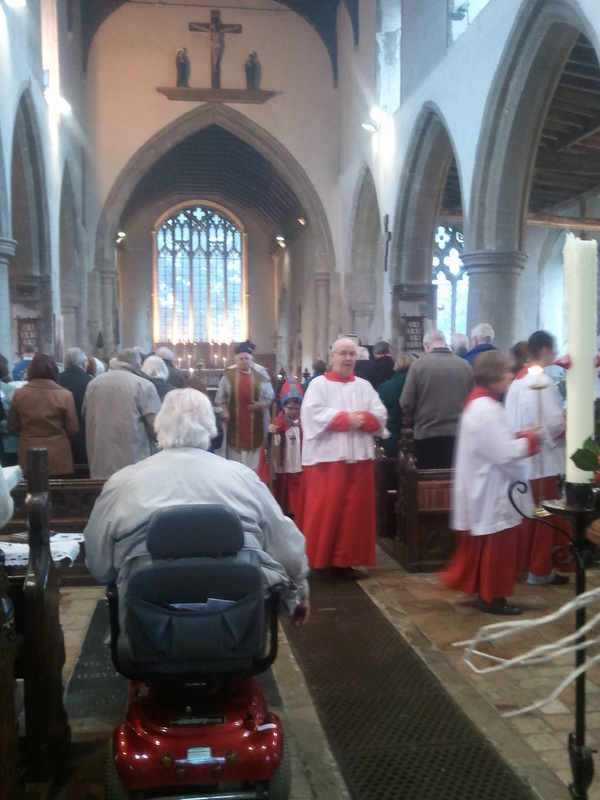 Also present was our boy bishop, Owen. 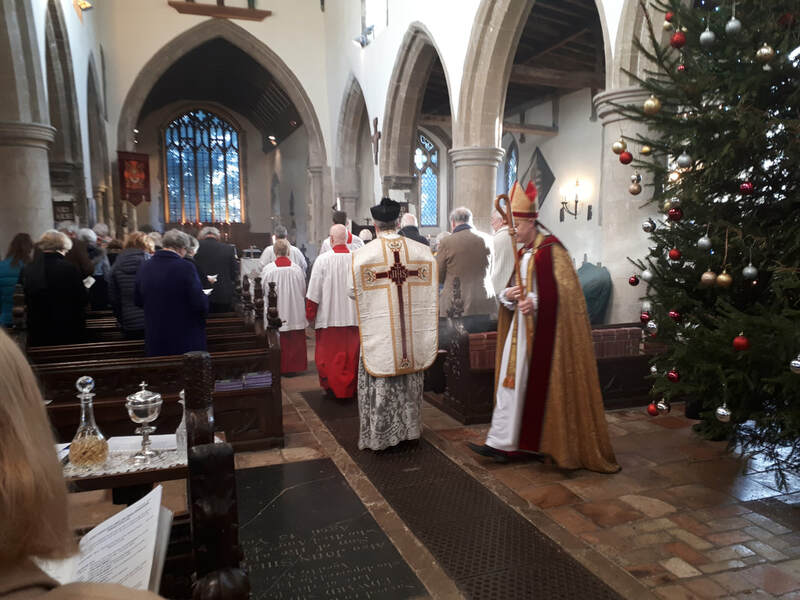 For many years St Mary's has revived the mediaeval custom of enthroning a boy bishop whose 'reign' lasts from Advent II to the feast of the Baptism of Our Lord, after Epiphany. Our boy bishop by the Advent wreath, with the four Advent candles alight. 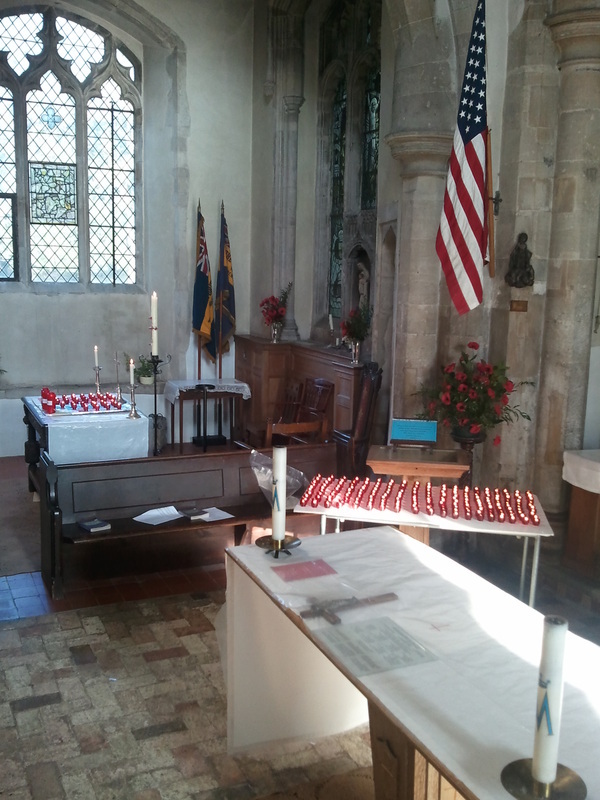 On Friday 11th November 2011 at an Armistice Day Service attended by Mendlesham Community School and again on Sunday 13th November: Remembrance Sunday at the 9.30am Parish Mass of Requiem,candles were lit in memory of each Mendlesham man who gave his life in World War 1, World War 2 and the Korean War, large candles were lit for all who died in the Falklands, Iraq and Afghanistan and 190 candles lit for the 190 American Servicemen based at Mendlesham who gave their lives in WW2. May they rest in the peace of Christ and rise in glory. 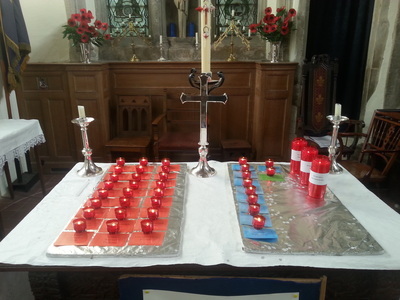 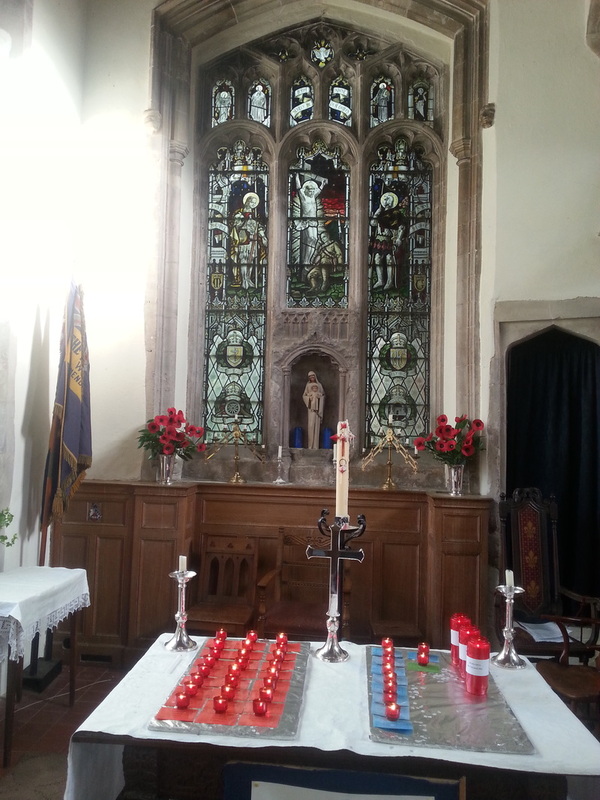 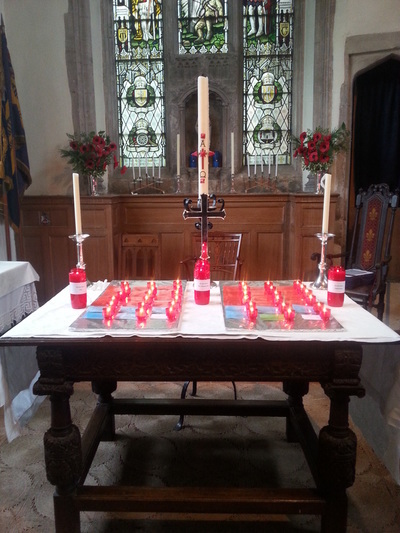 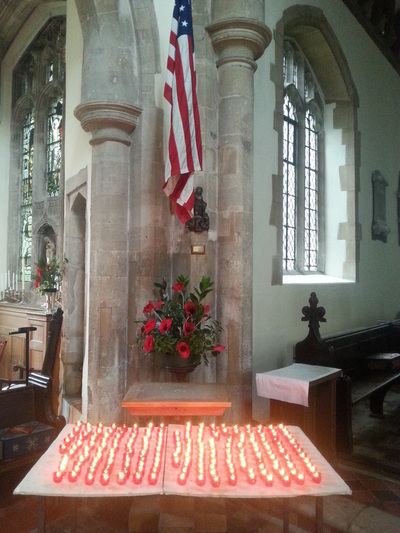 Photos of the candles lit as a prayer for all who gave their lives in the two World Wars and recent conflicts. 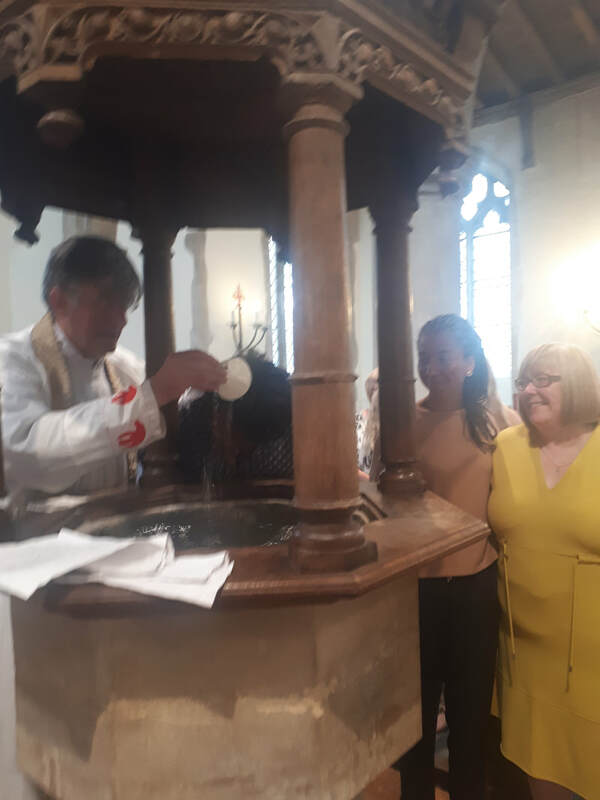 Jenny and Emma, two of our servers, presented a new cross to St Mary's which they brought back from Ethiopia, where they have recently spent several weeks working alongside the de la Salle brothers in a new school near Addis Ababa. 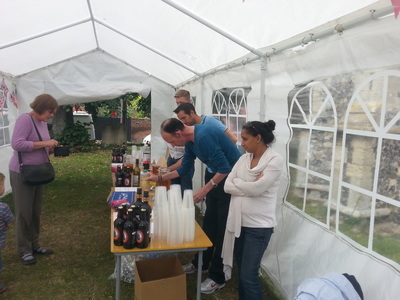 They went there after climbing Mount Kilimanjaro to raise money for a children's charity. 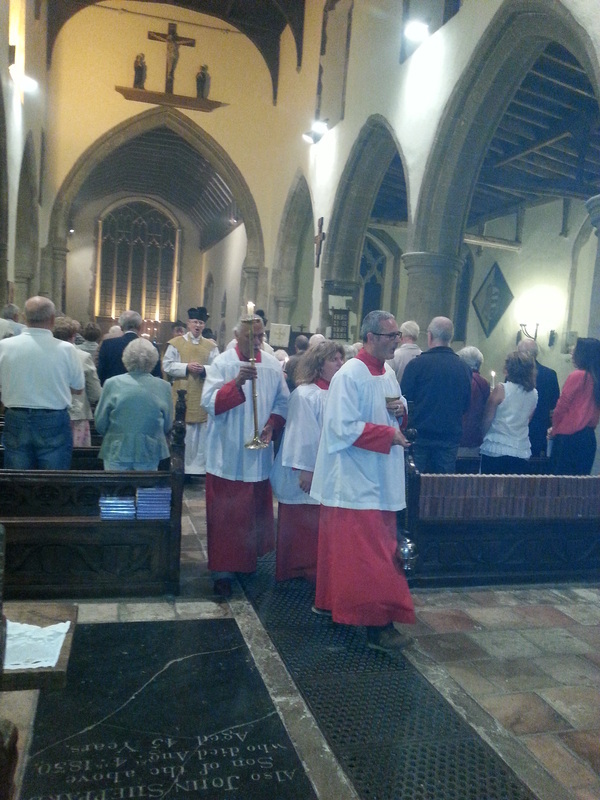 The cross was blessed at Parish Mass by Fr Philip on 4th September 2011. 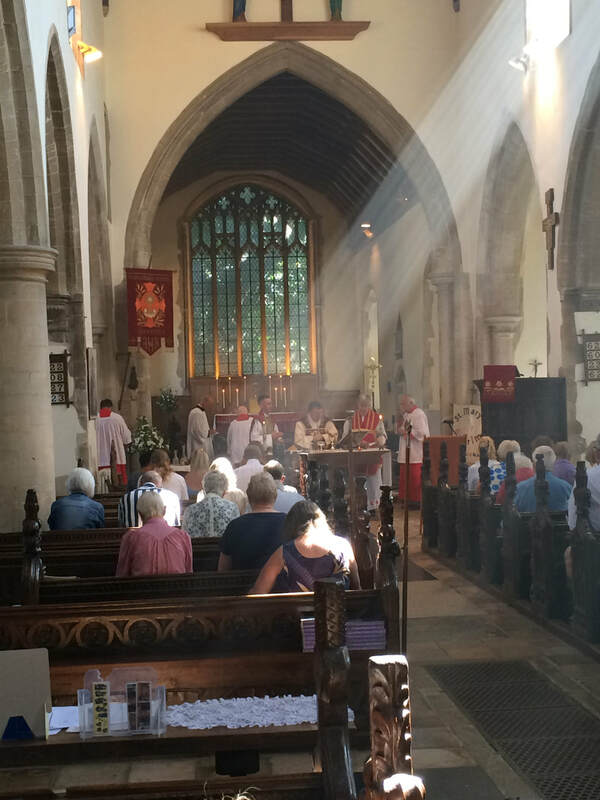 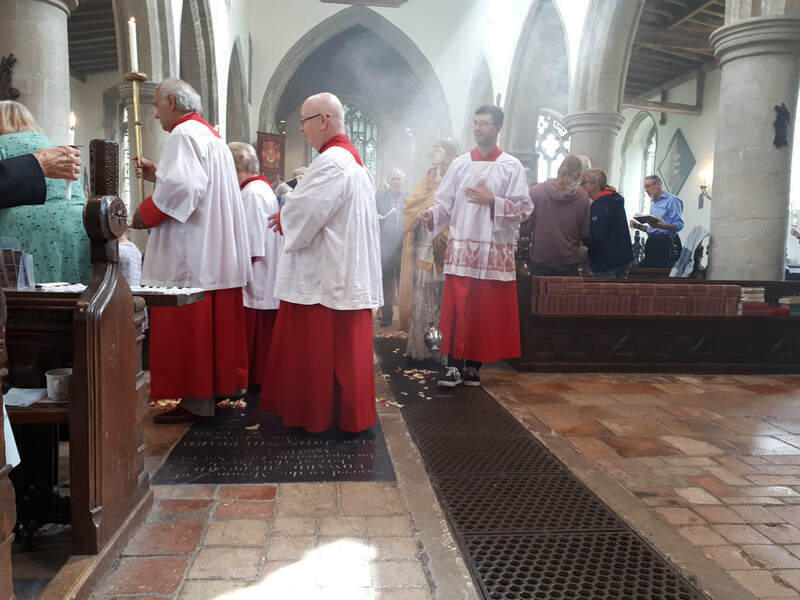 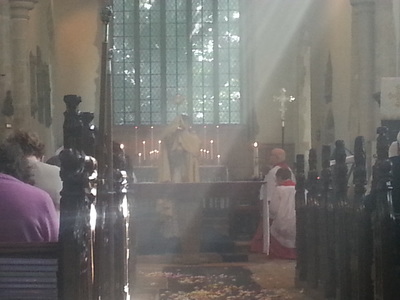 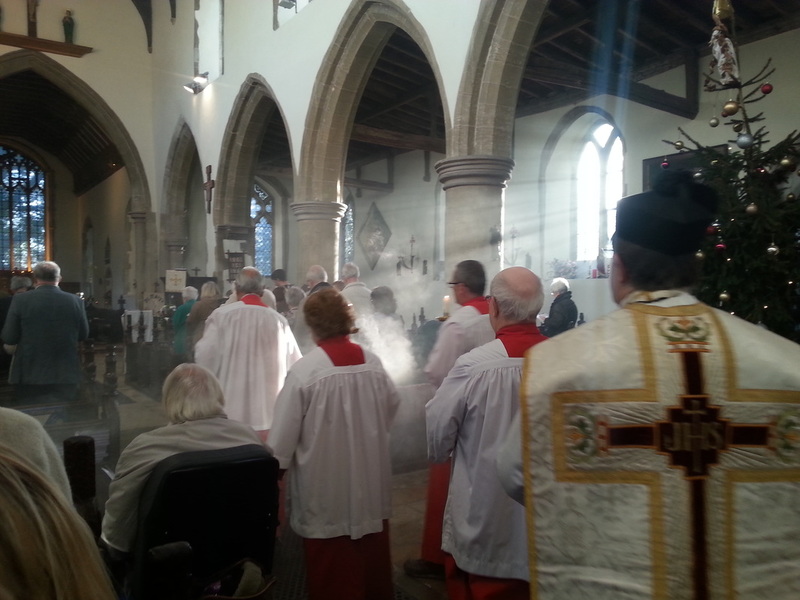 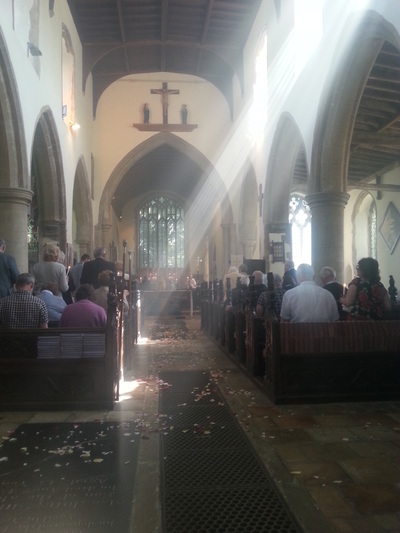 This was the weekend of our Patronal Festival, - the Assumption of Our Lady into Heaven -when the sacred was mixed with the secular in the spirit of our mediaeval forebears. 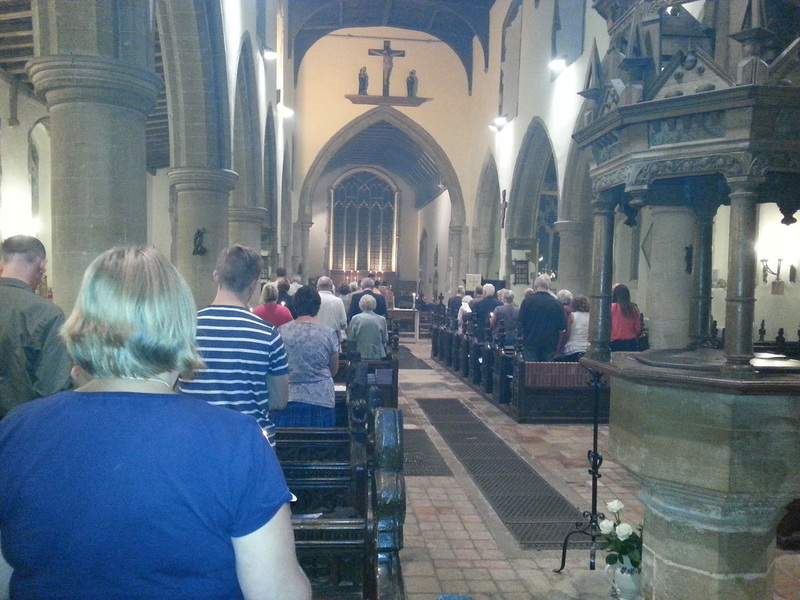 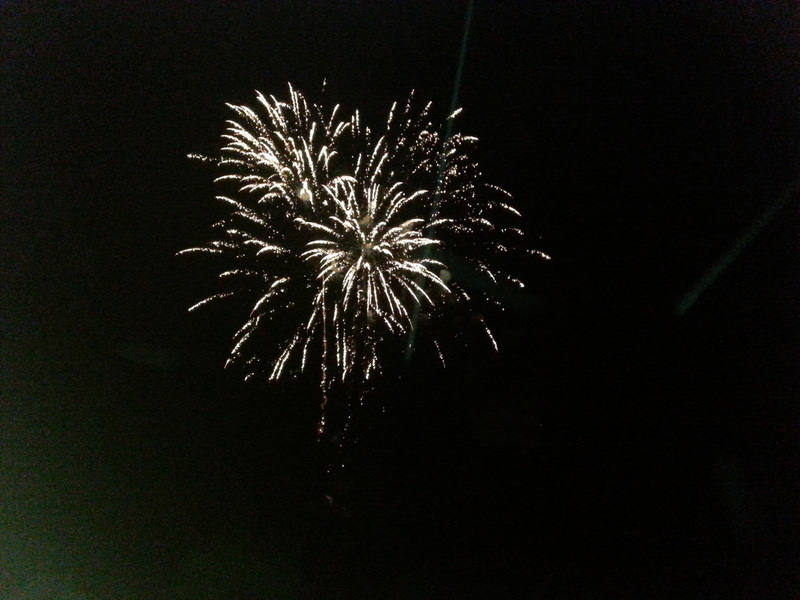 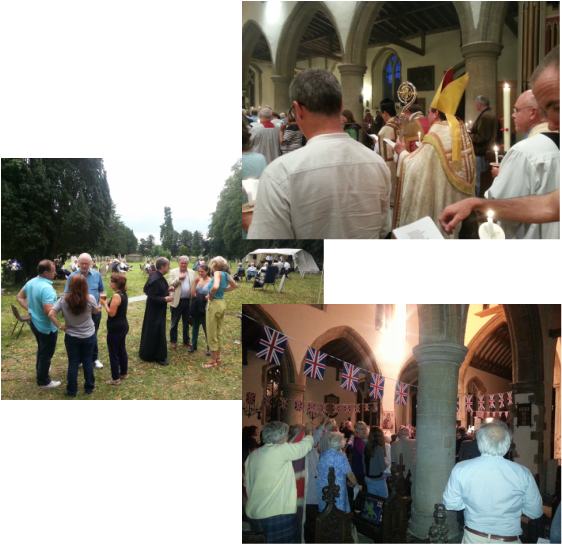 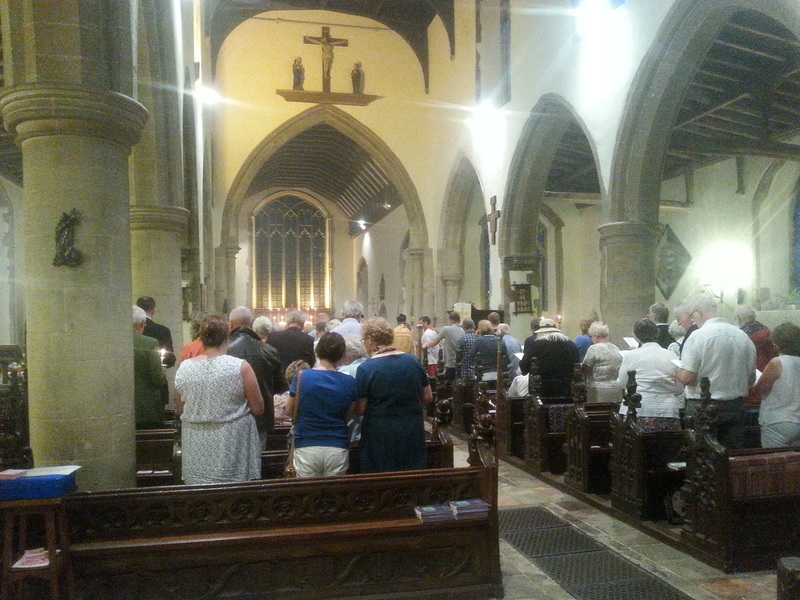 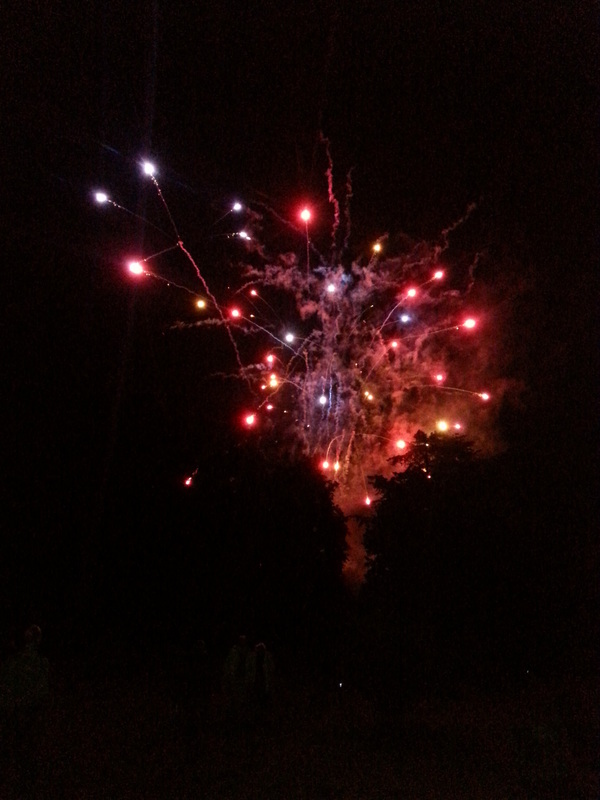 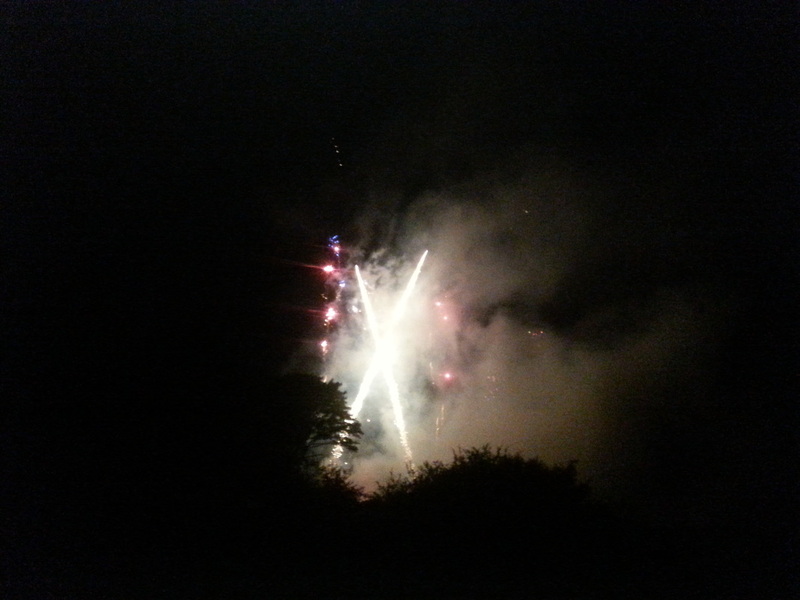 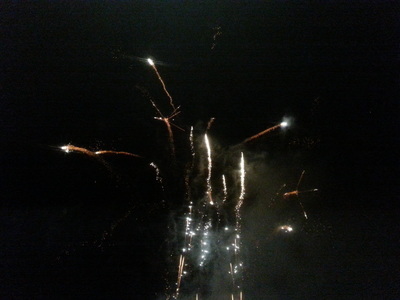 On Friday 12th Aug we had a Concelebrated Festival Mass, Procession, Benediction then a magnificent Firework display. 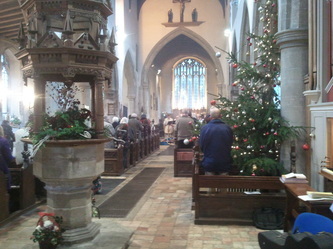 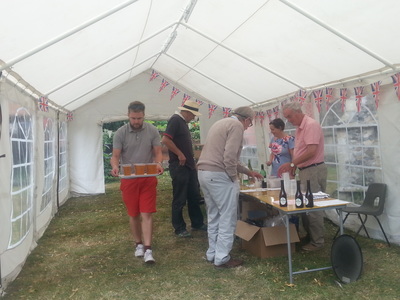 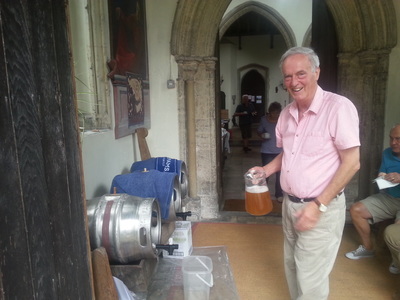 'Mendlesham's Best' Assumption Edition 2011 Real Ale was blessed & enjoyed by many. 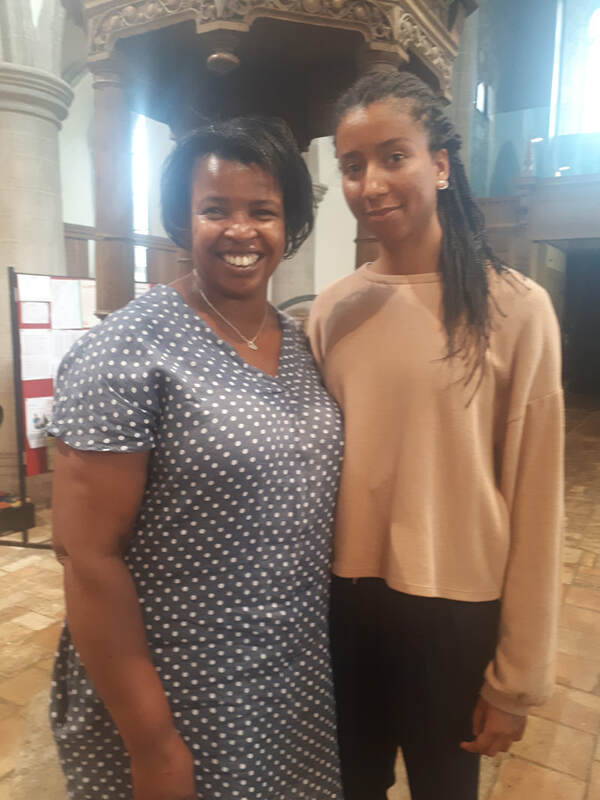 On Saturday 13th August we had a glorious concert in the church with soprano Laura Wright, whose new CD had topped the classical charts for the second week running at the time. 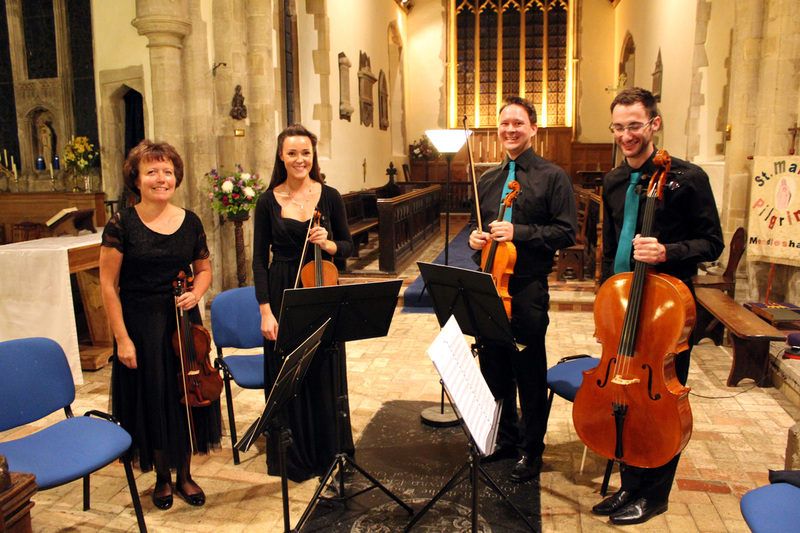 She was accompanied by Alisdair Kitchen and local group the Edmund Octet. 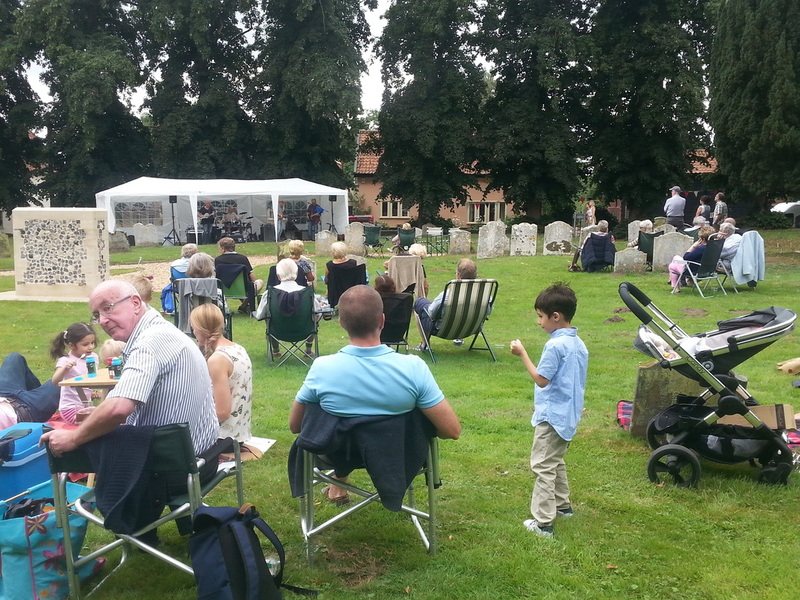 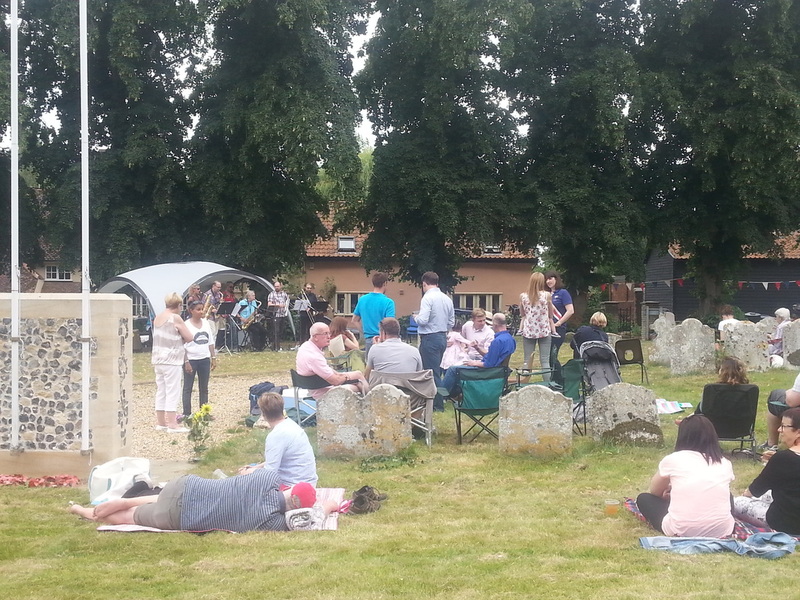 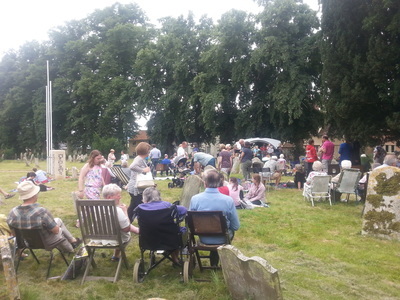 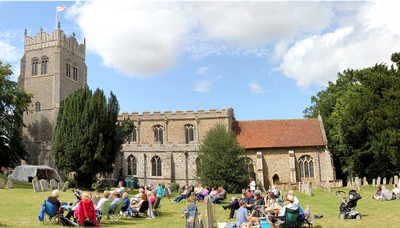 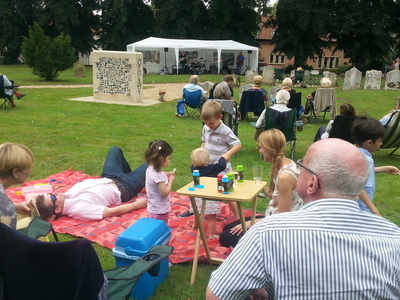 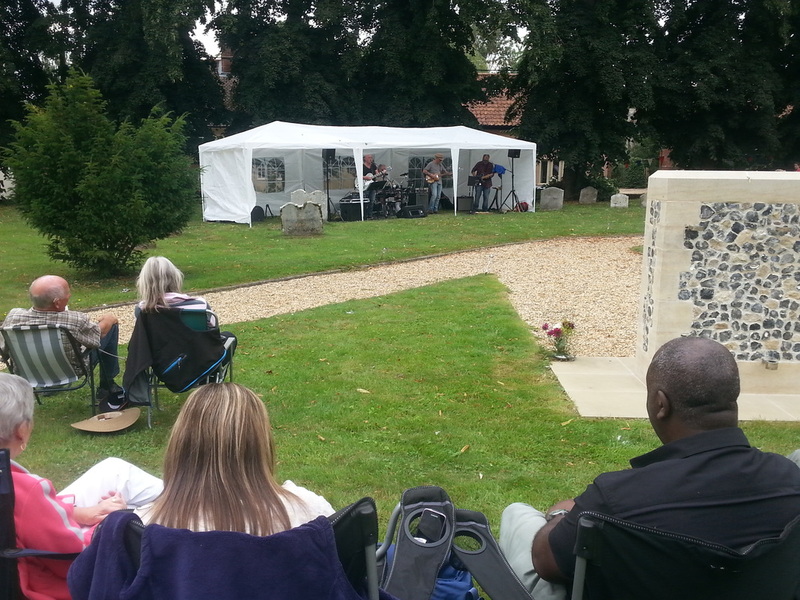 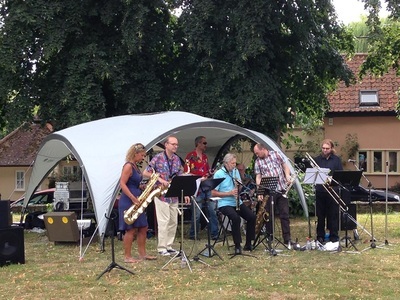 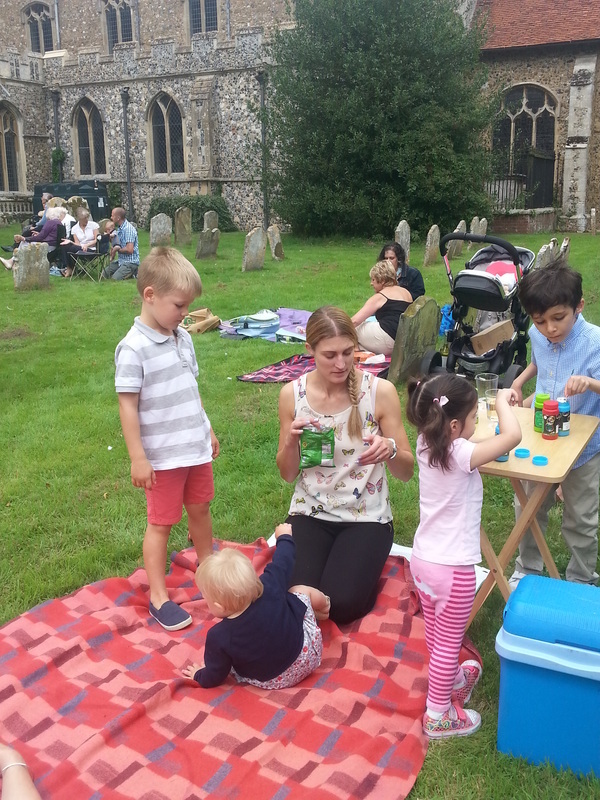 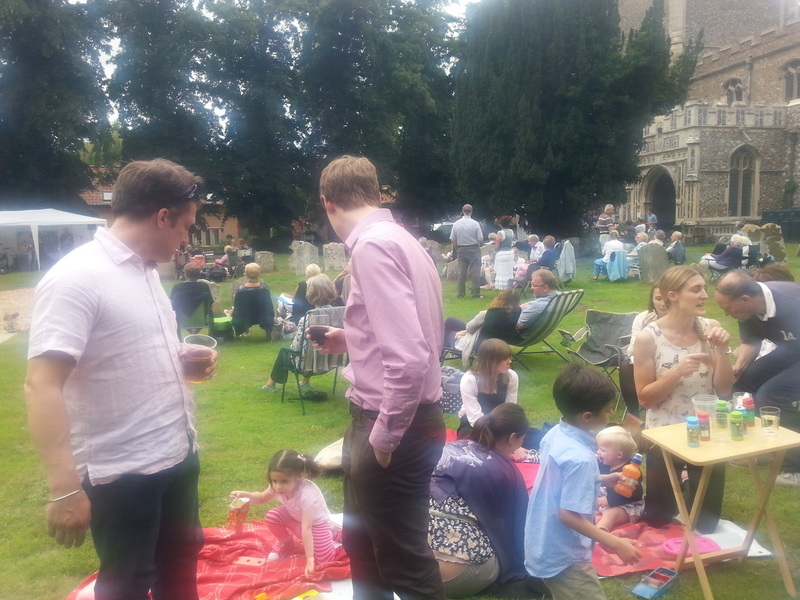 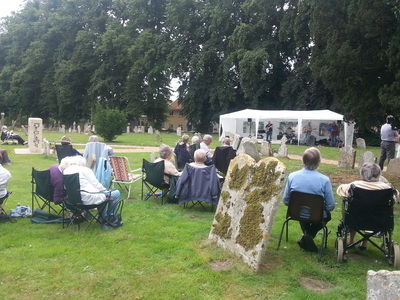 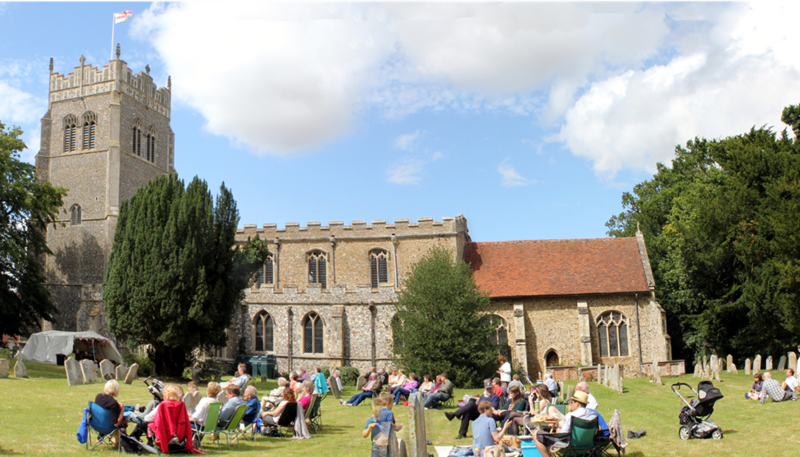 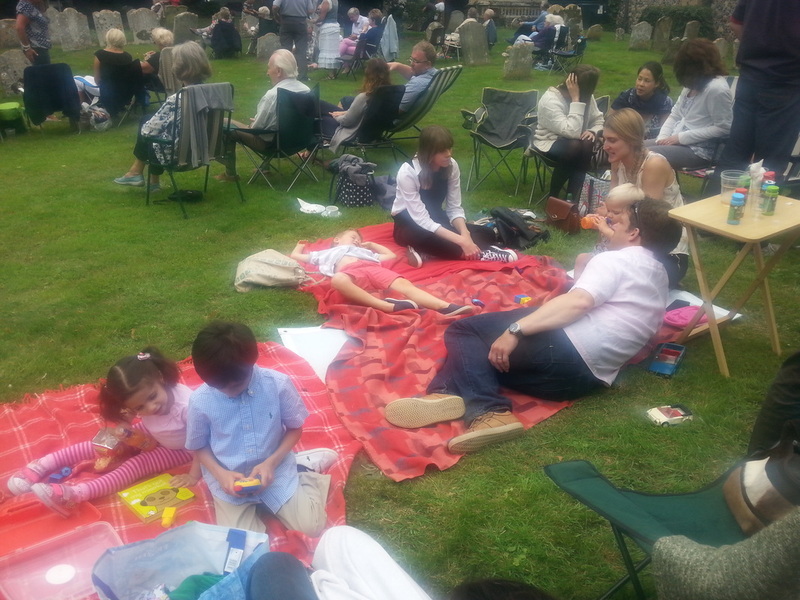 On Sunday 14th August, after the Parish Mass, we had a superb laid-back 1930's afternoon in the churchyard - 'And all that Jazz' with the Brandeston Pickles, plus a barbecue, beer and teas. 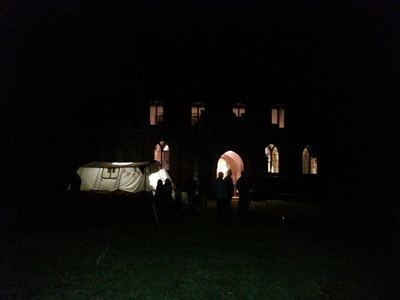 The total profit from the festival for the church restoration fund was £3083.46.